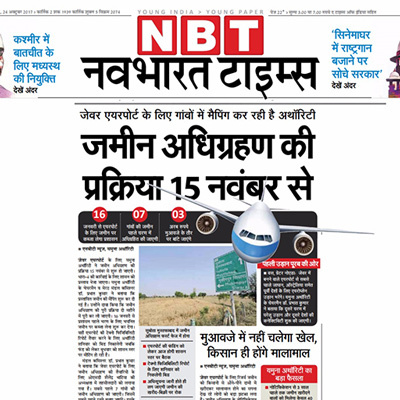 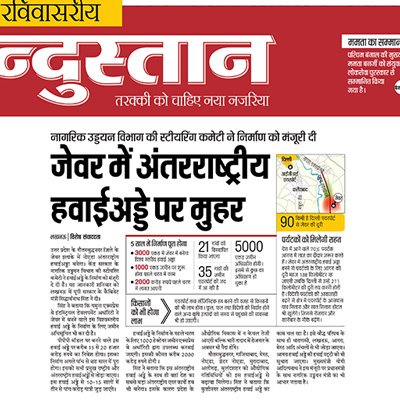 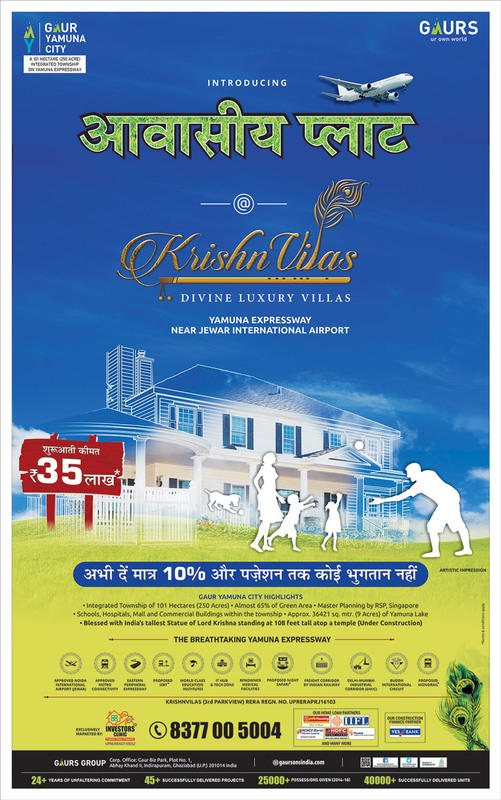 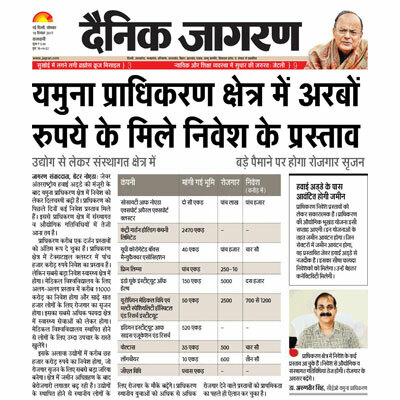 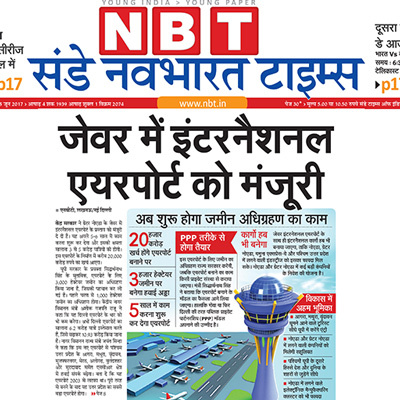 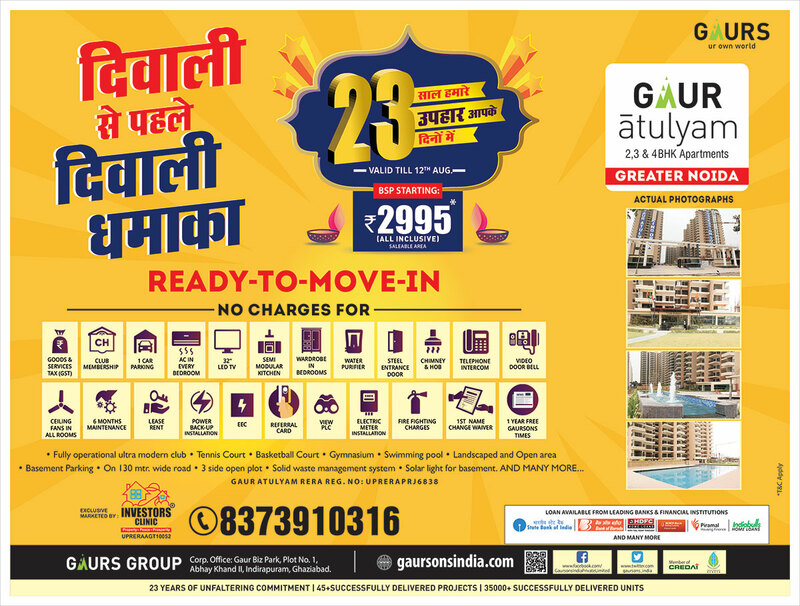 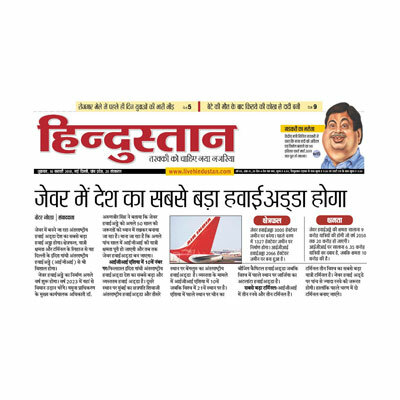 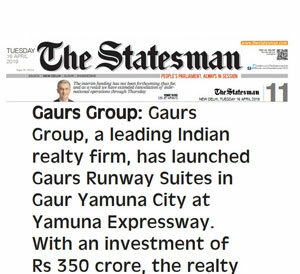 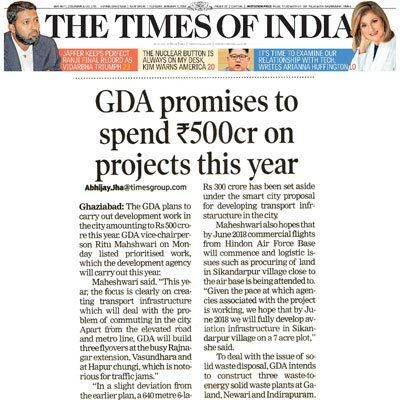 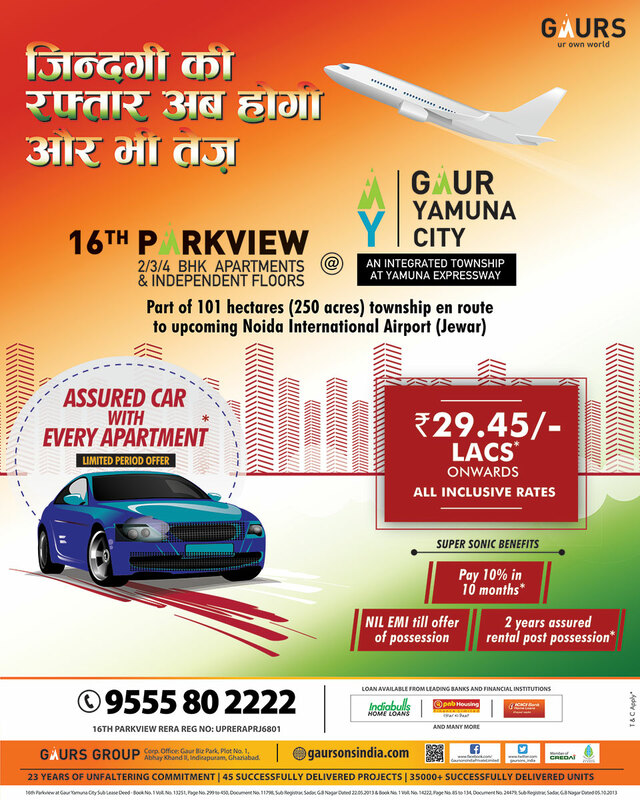 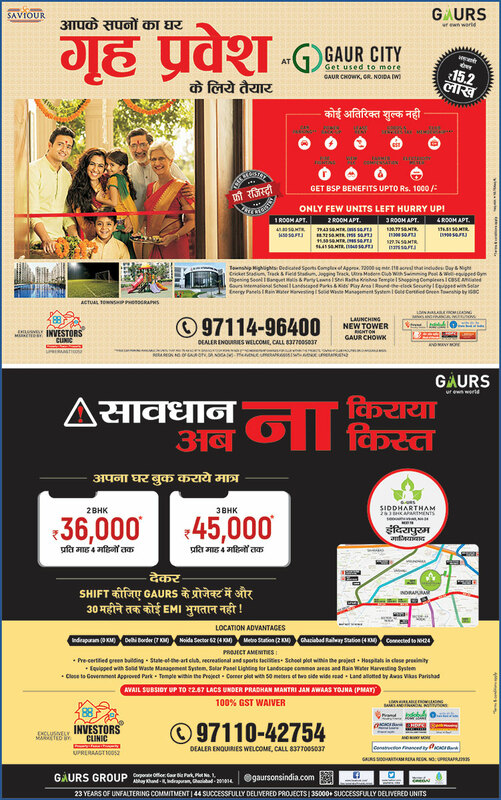 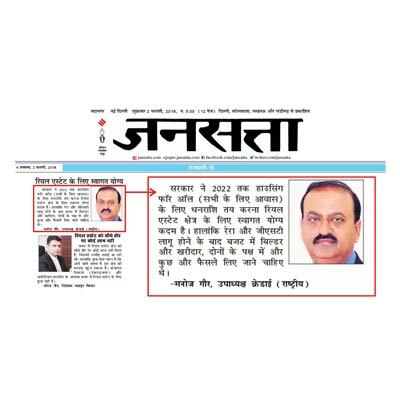 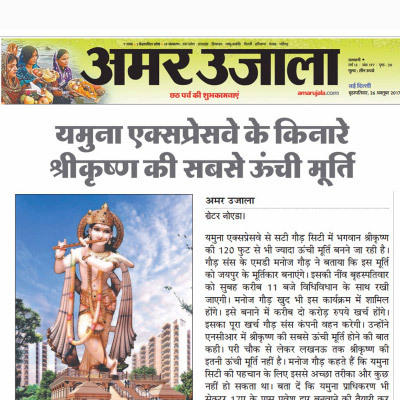 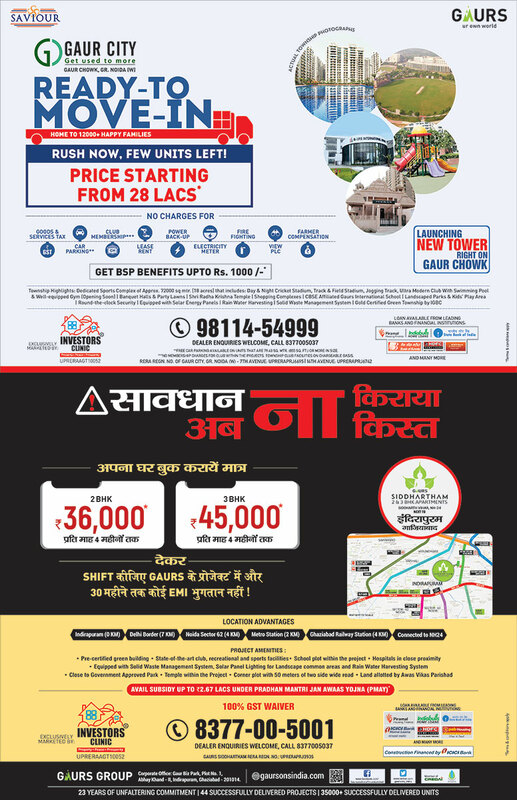 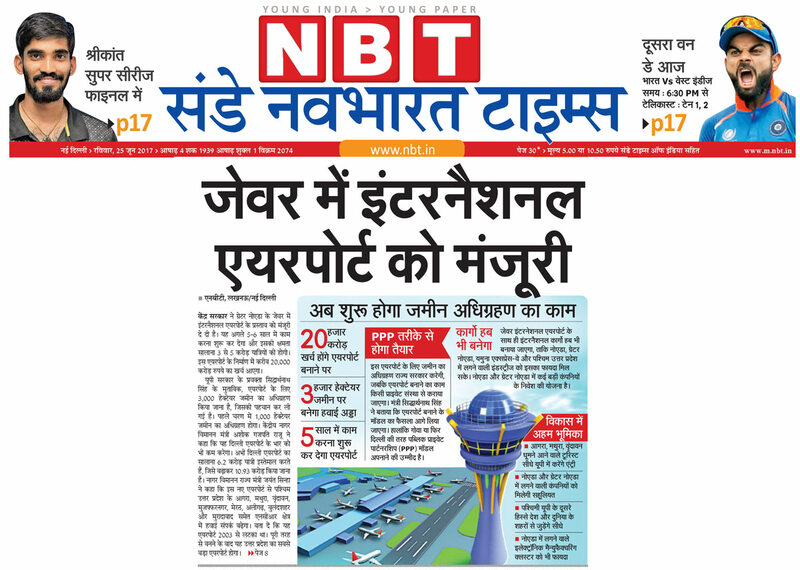 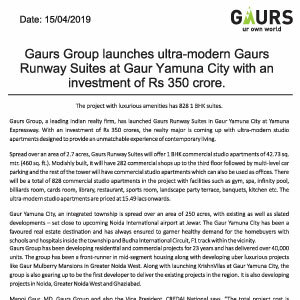 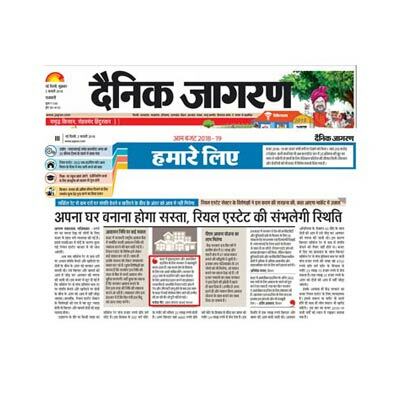 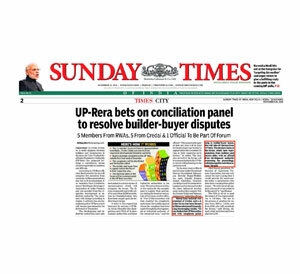 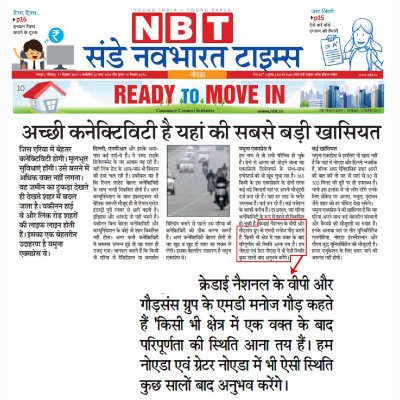 Rashtriya Sahara: Gaurs Group to invest Rs 350 cr in new realty project at Yamuna Expressway. 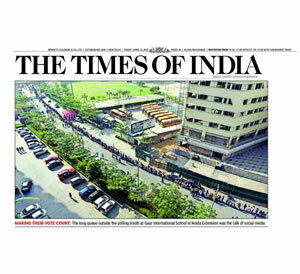 TOI: Long queue outside the polling booth at Gaurs International School. 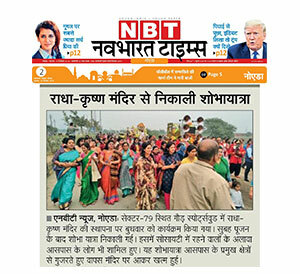 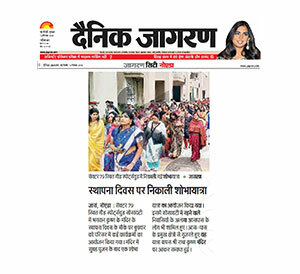 Amar Ujala: Voters queue up in Gaur City. 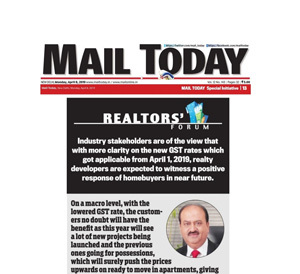 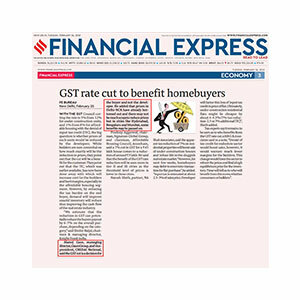 Mail Today: A positive response from homebuyers due to the GST rate cut. 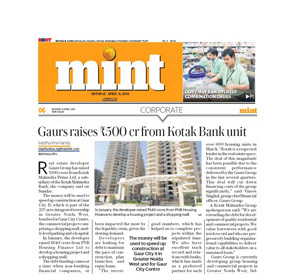 Mint: Gaurs raises Rs 500 cr from Kotak bank unit. 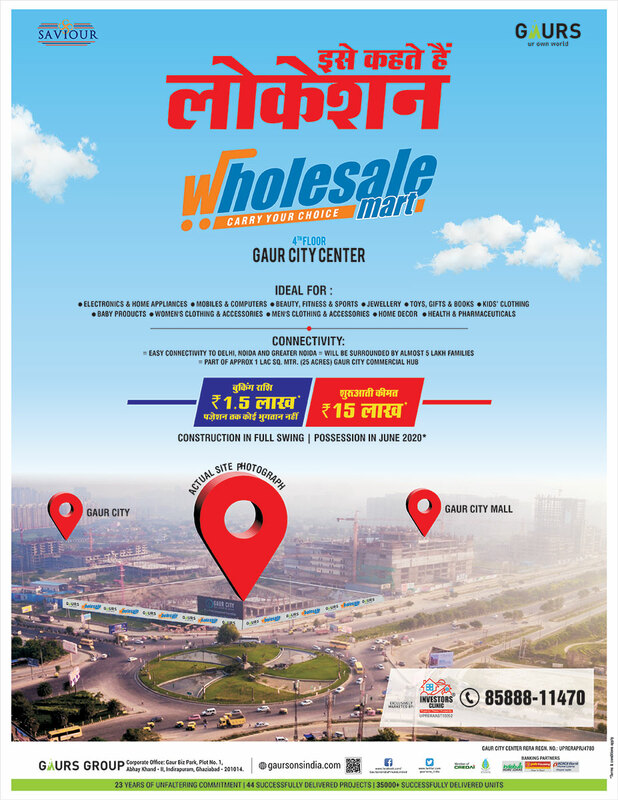 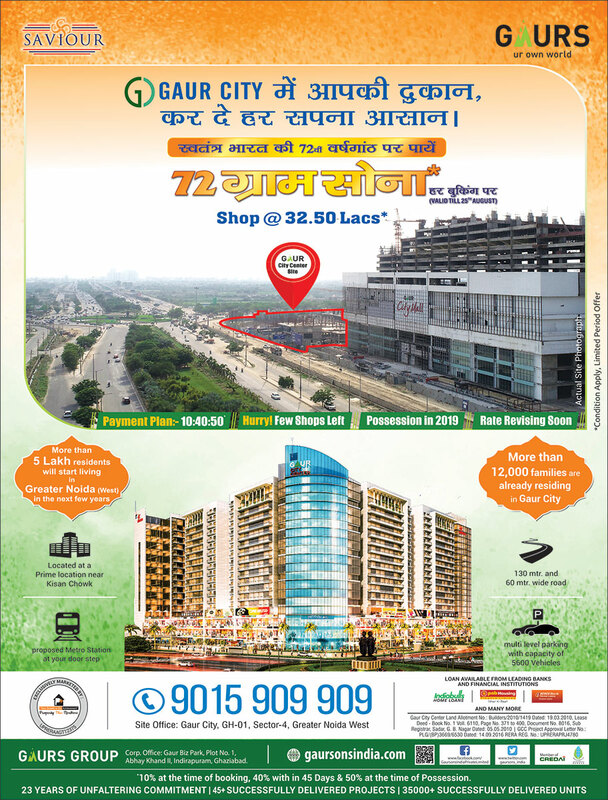 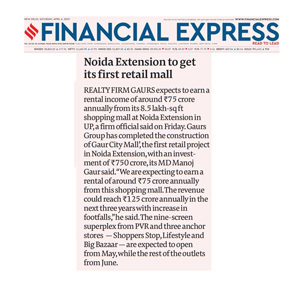 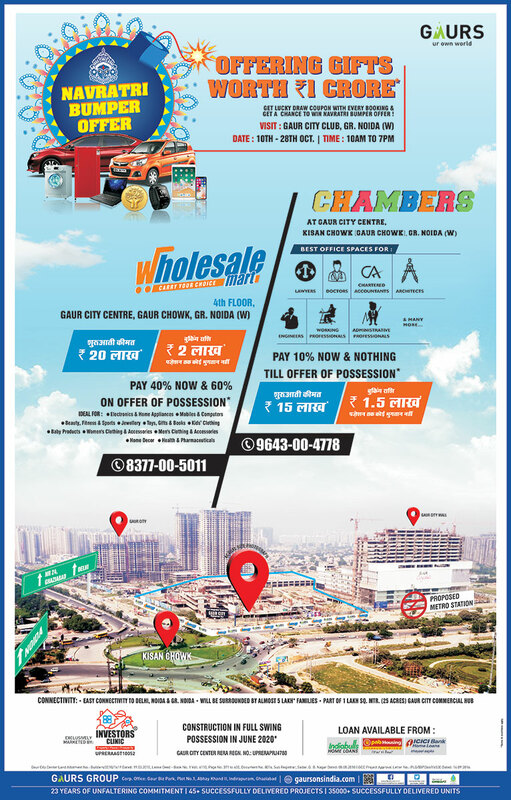 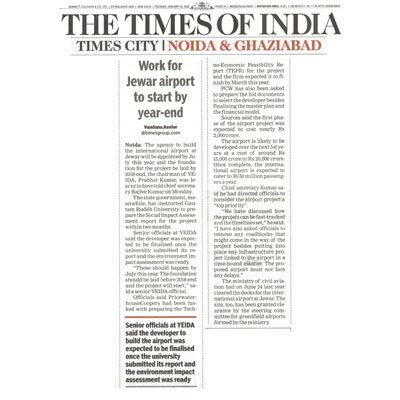 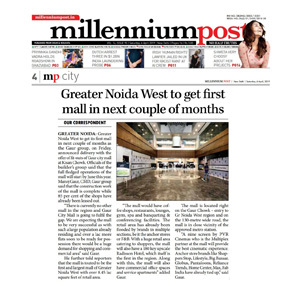 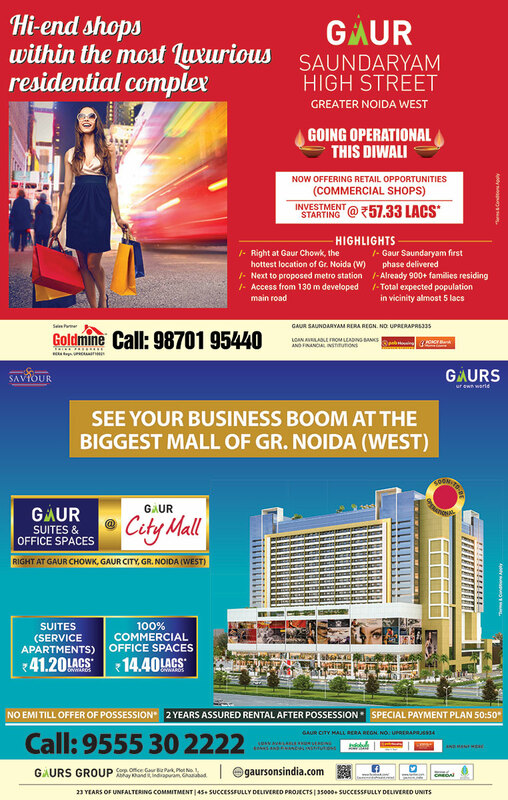 Navodaya: Greater Noida West to get the first mall, Gaur City Mall in next couple of months. 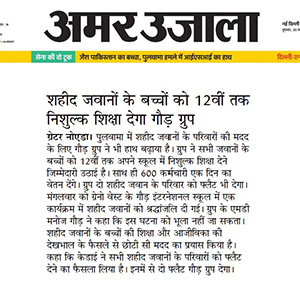 Amar Ujala: The children of the martyred CRPF soldiers to get free education till 12th Standard at Gaurs International School. 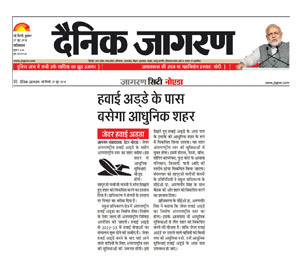 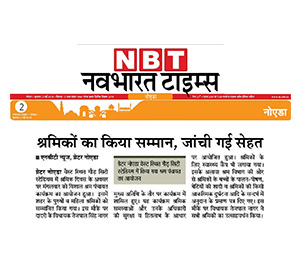 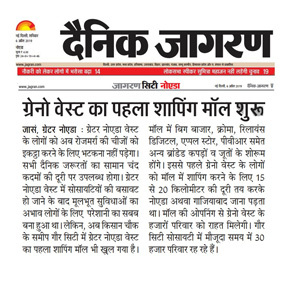 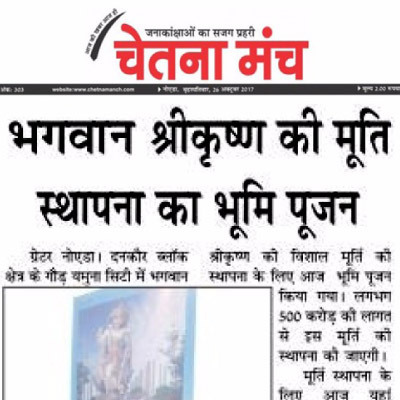 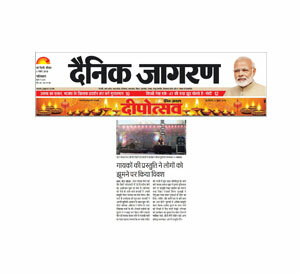 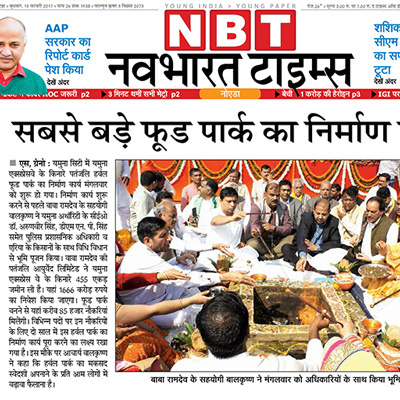 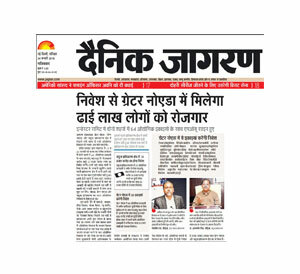 Dainik Jagran: Gaurs Group to help the families of martyred CRPF soldiers. 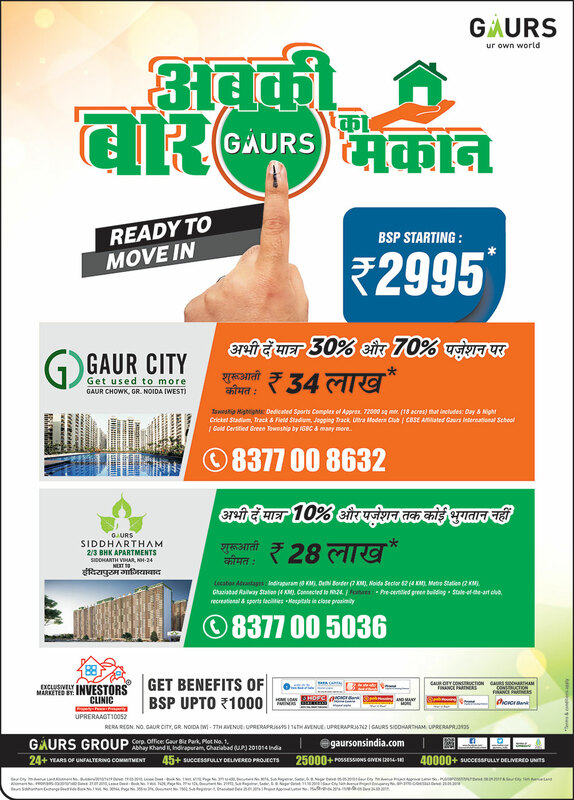 Hindustan: Gaurs Group to donate two flats for CRPF martyrs. 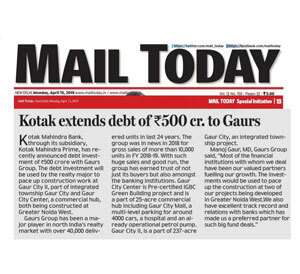 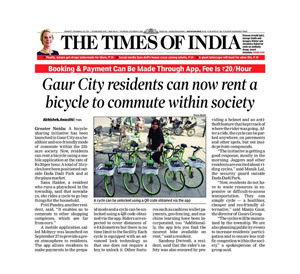 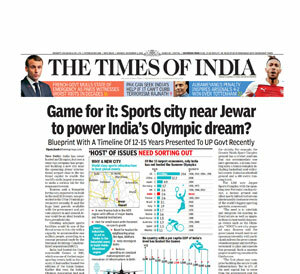 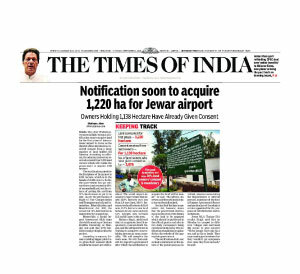 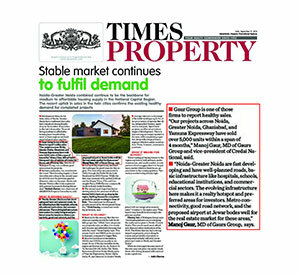 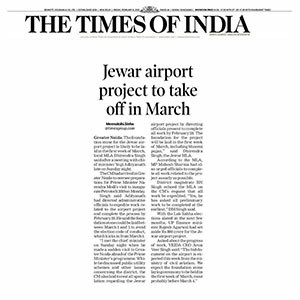 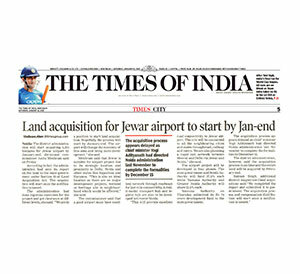 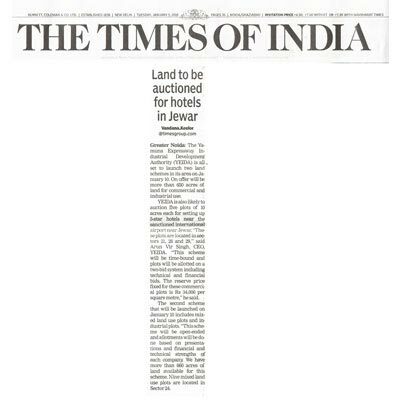 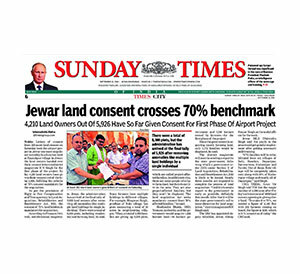 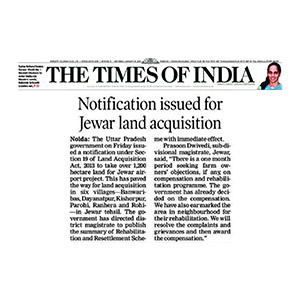 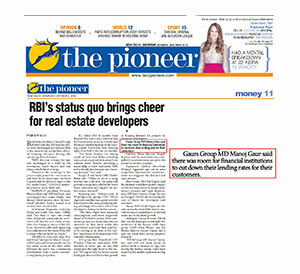 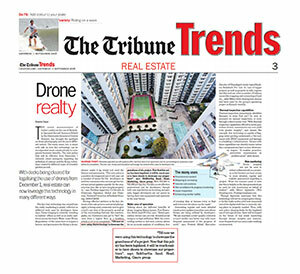 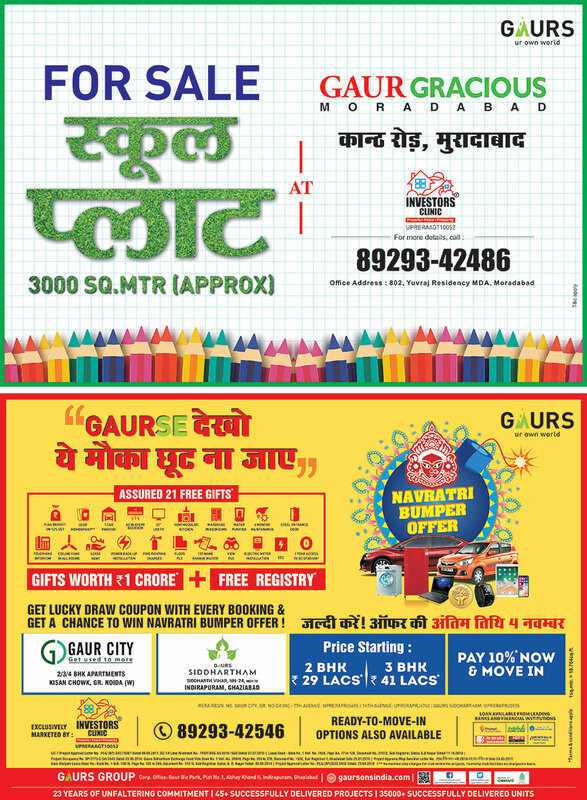 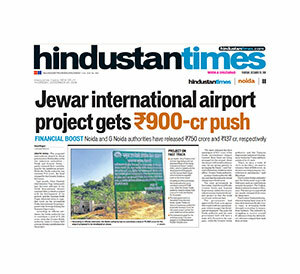 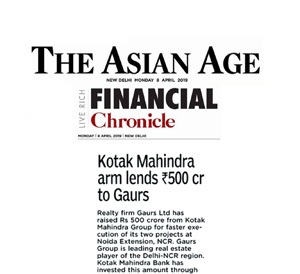 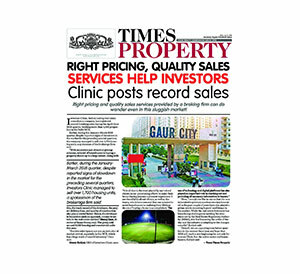 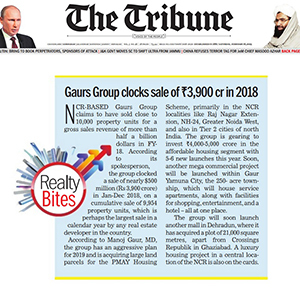 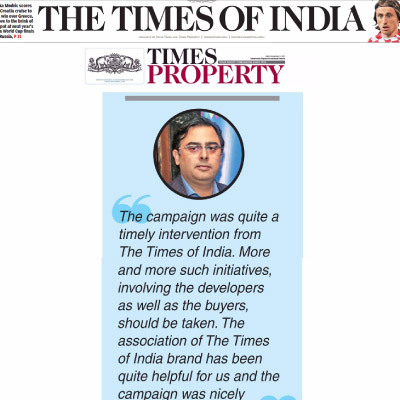 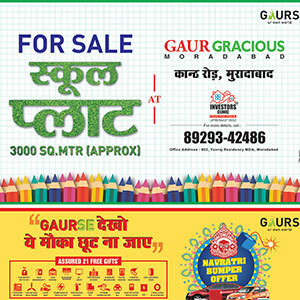 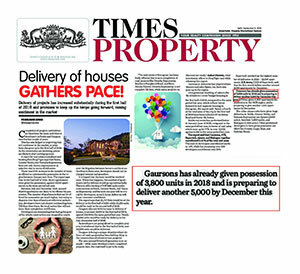 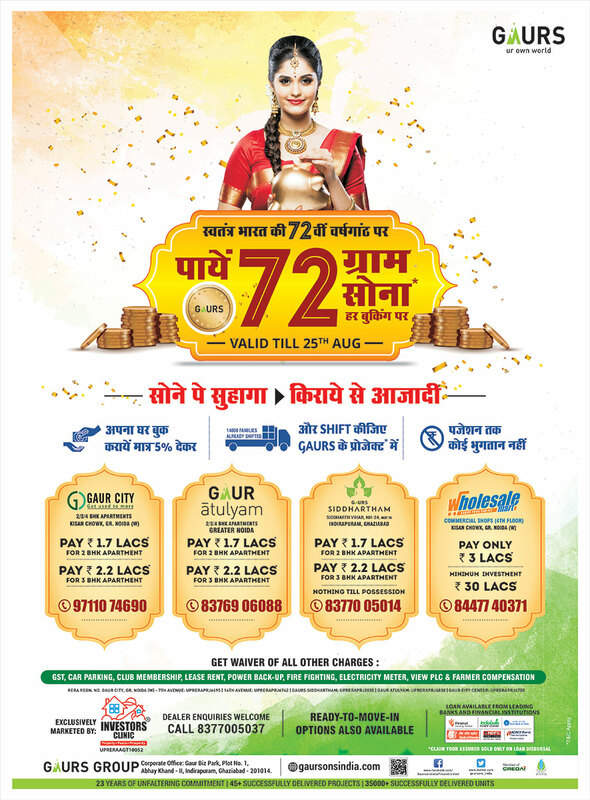 The Tribune: Gaurs Group clocks sale of Rs. 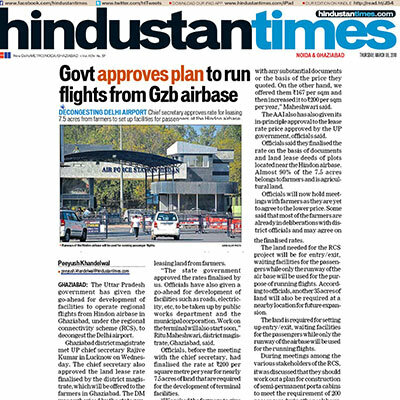 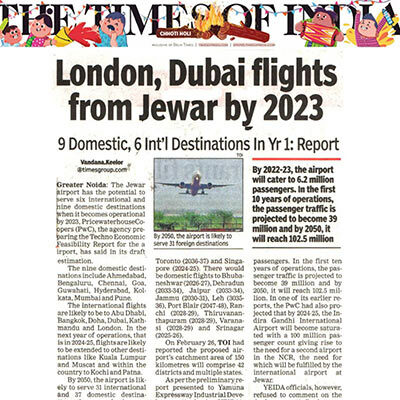 3,900 cr in 2018. 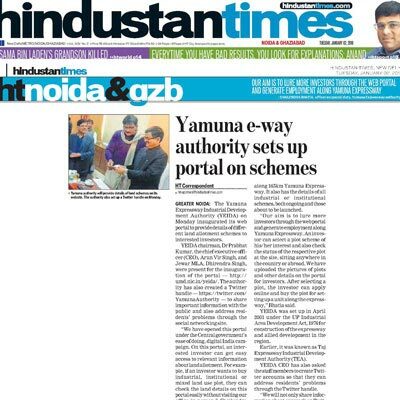 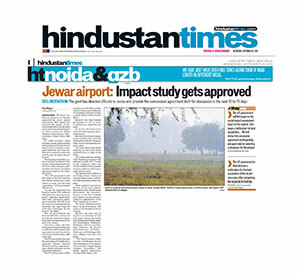 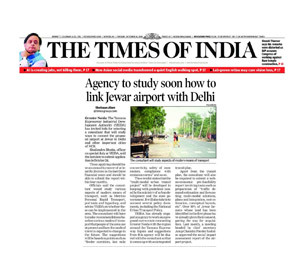 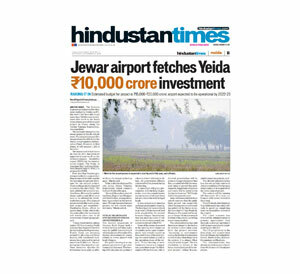 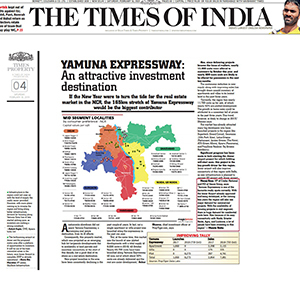 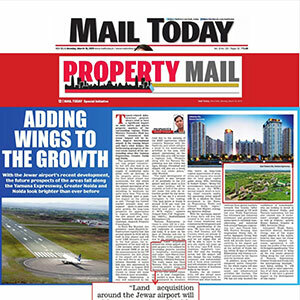 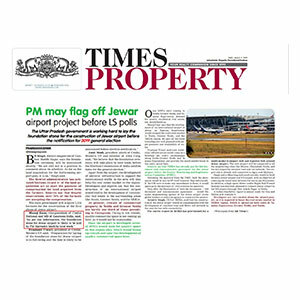 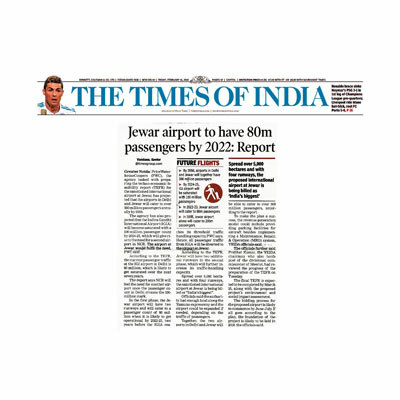 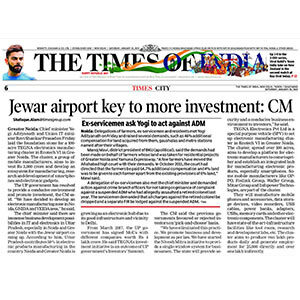 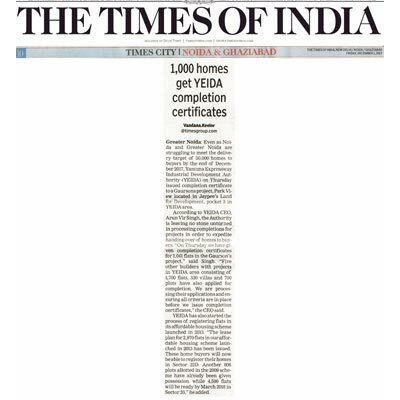 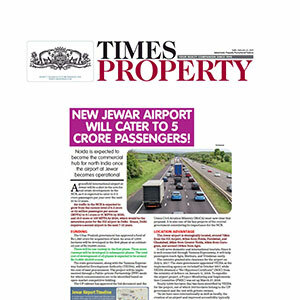 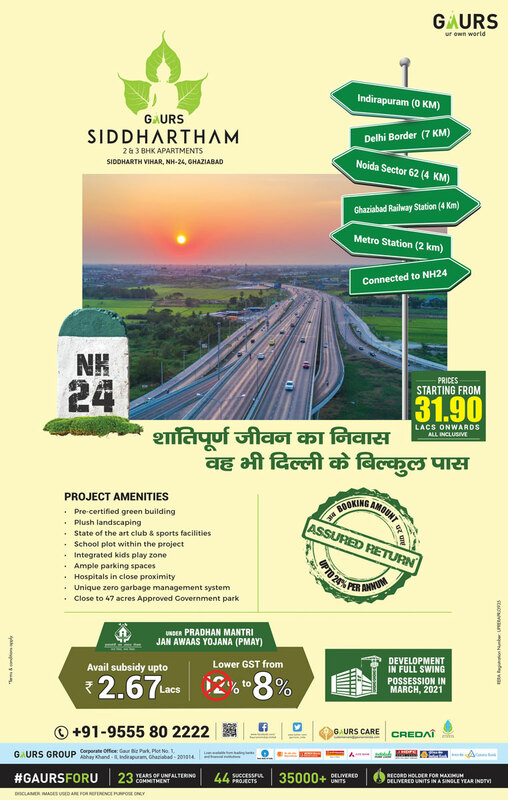 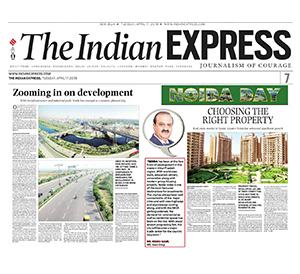 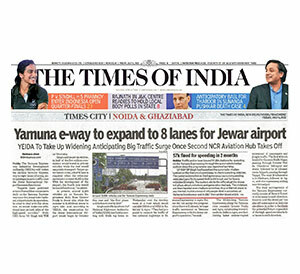 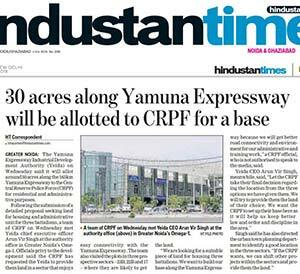 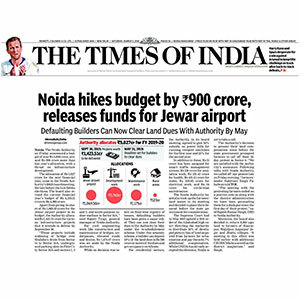 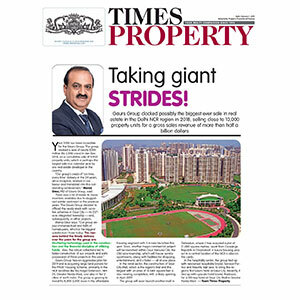 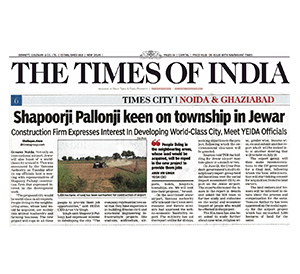 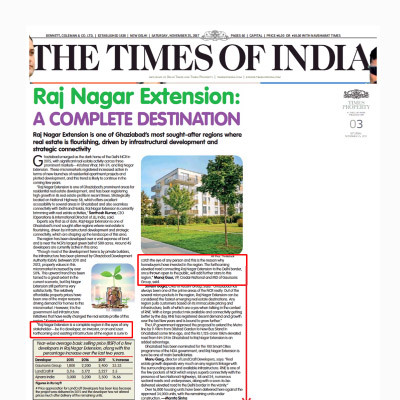 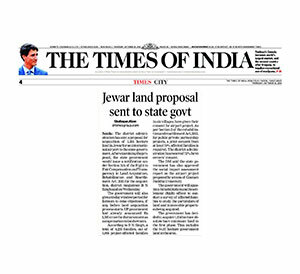 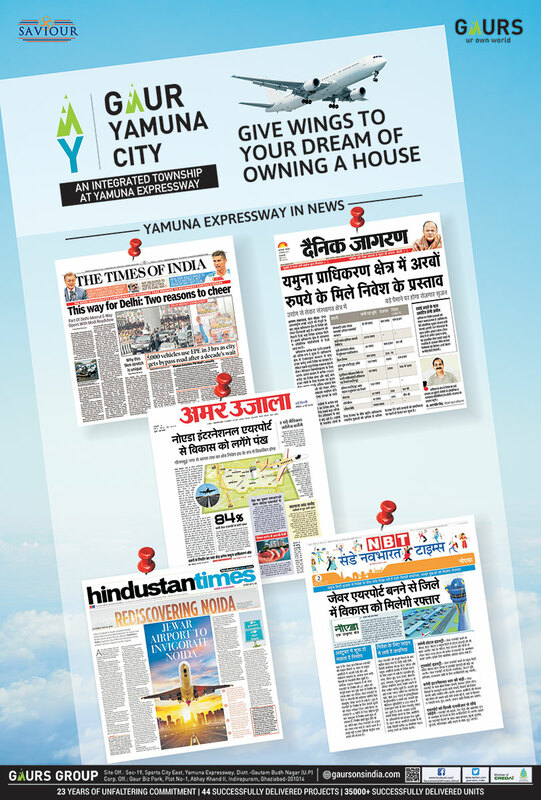 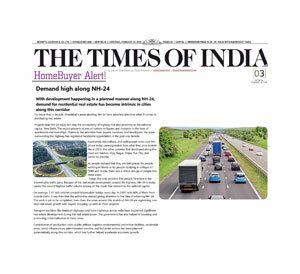 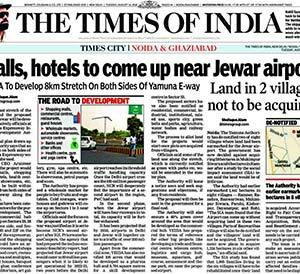 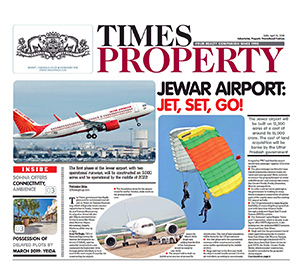 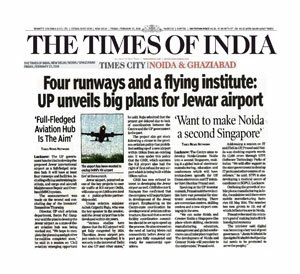 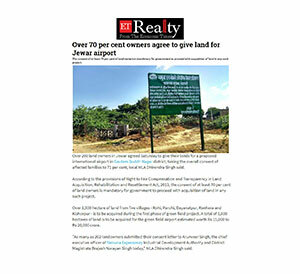 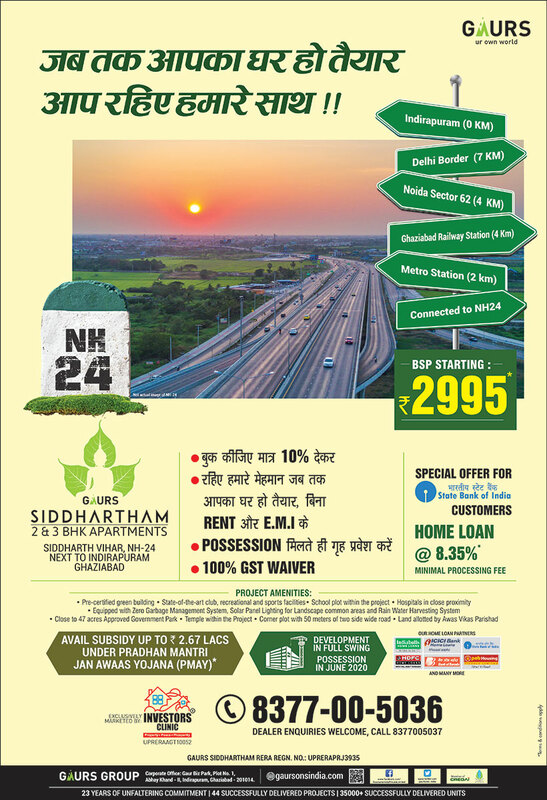 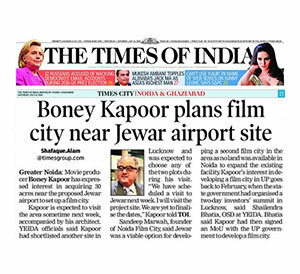 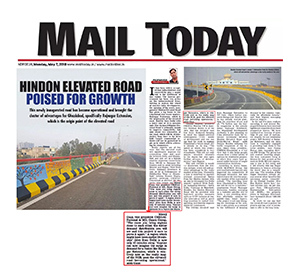 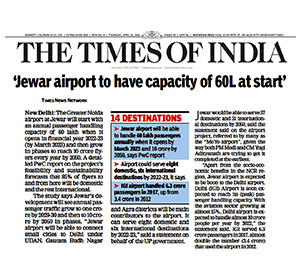 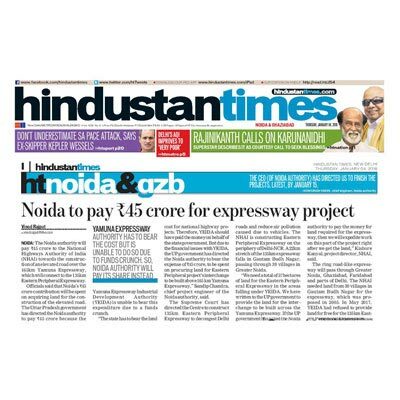 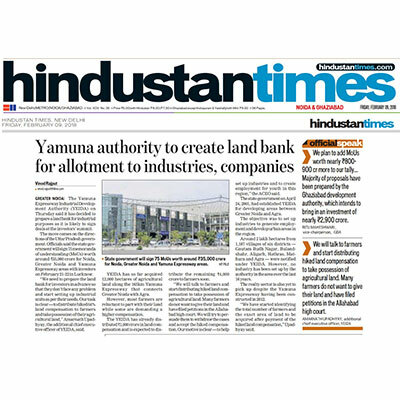 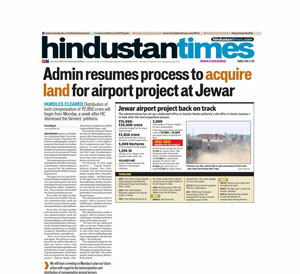 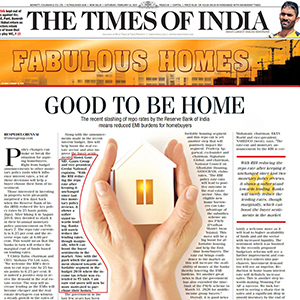 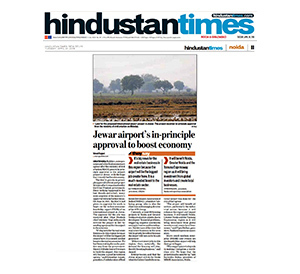 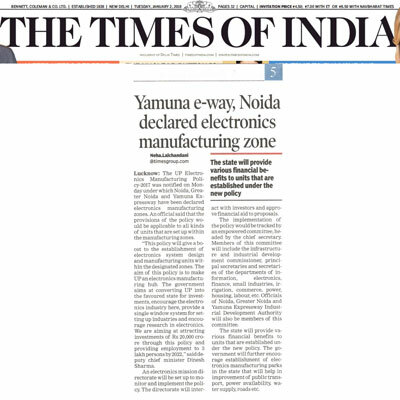 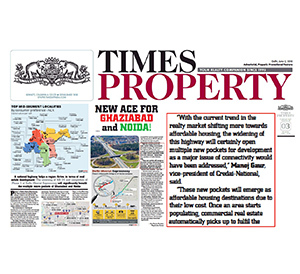 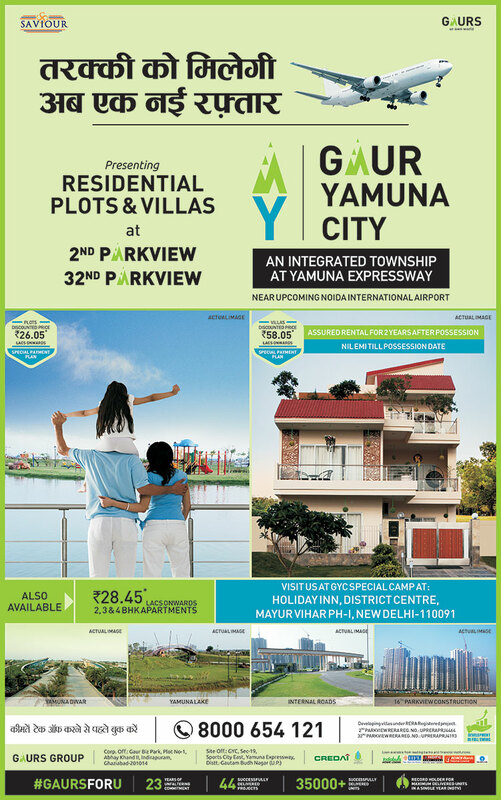 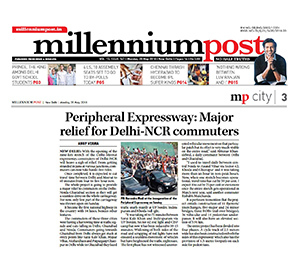 TOI: Yamuna Expressway: An attractive investment. 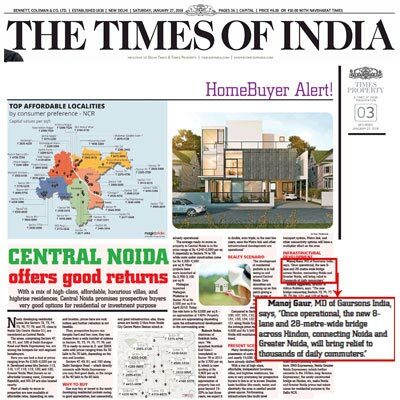 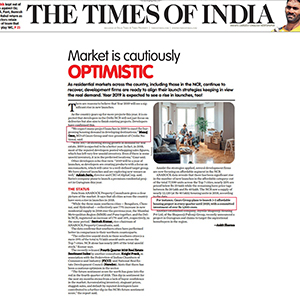 TOI: Residential Markets across the country continue to recover. 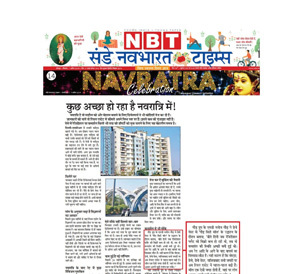 Navodaya: Study Tour of Gaur City by Members of CREDAI Maharashtra. 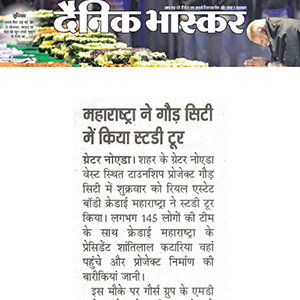 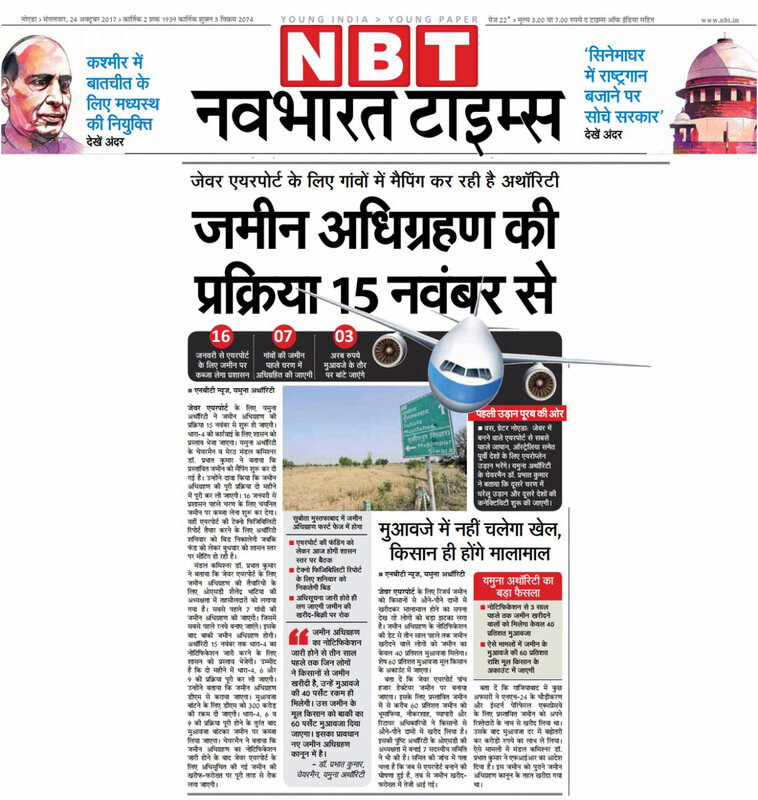 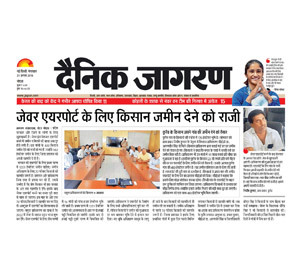 Dainik Bhaskar: 145 CREDAI Maharashtra members visited Gaur City for a study tour. 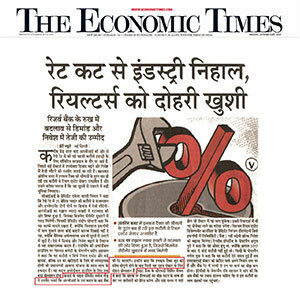 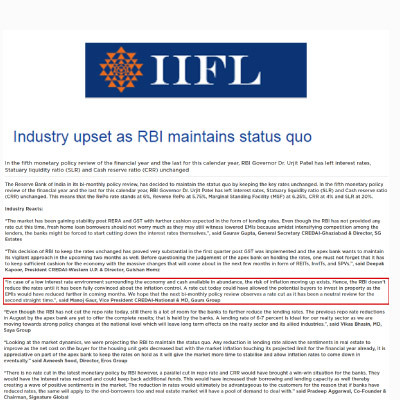 TOI: The recent slashing of REPO rate by RBI will reduce the EMI burden on homebuyers. 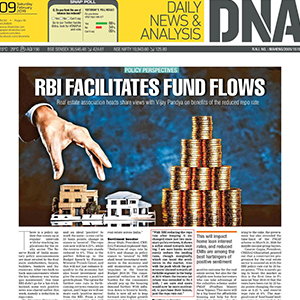 DNA: RBI facilitates fund flows. 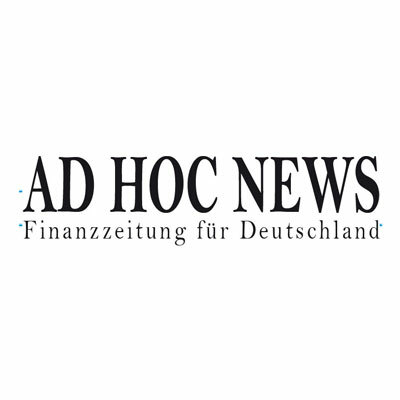 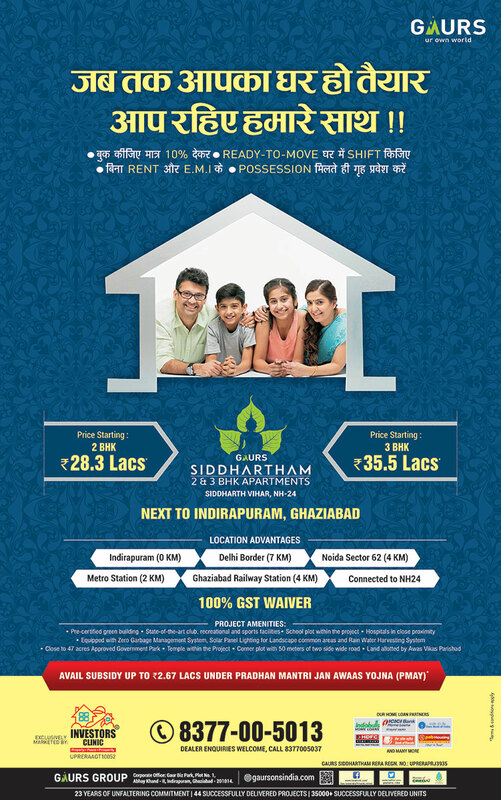 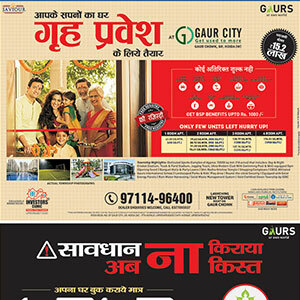 Hindustan: Great chance of saving on home purchasing. 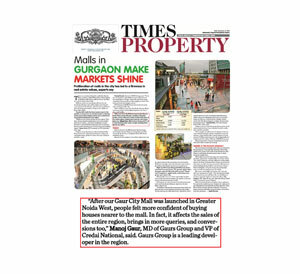 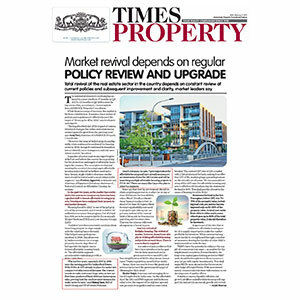 Times Property: Market revival depends on regular policy review and upgrade. 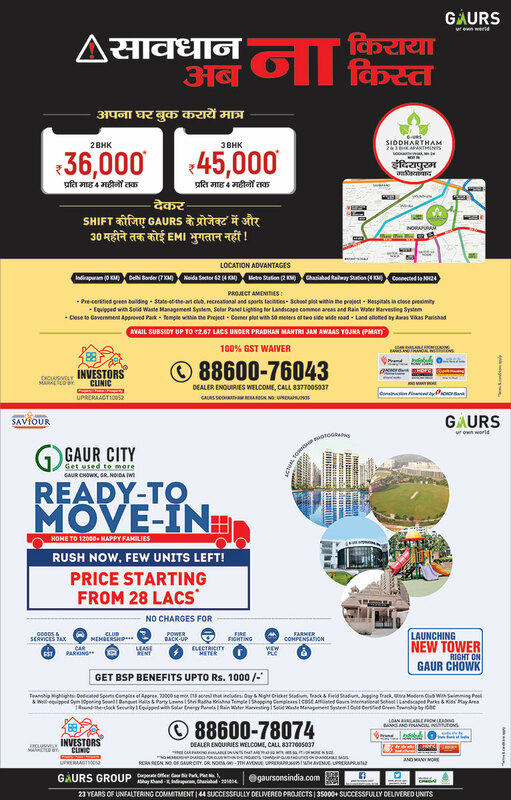 The Economic Times: Realty sector hopes for a boost in housing sales after RBI Cut..
Amar Ujala: Solid Waste Management turning waste to manure at Gaur City. 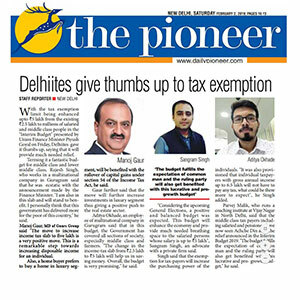 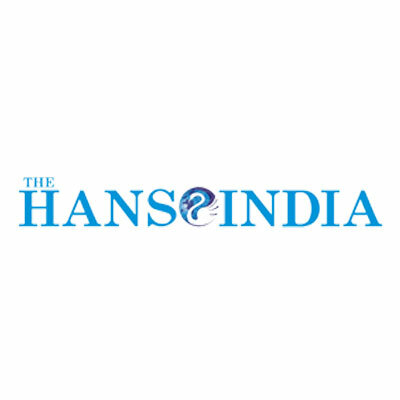 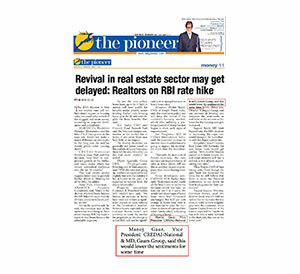 The Pioneer: Delhiites gives thumbs up to tax exemption. 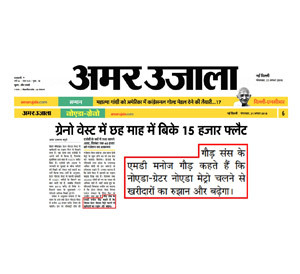 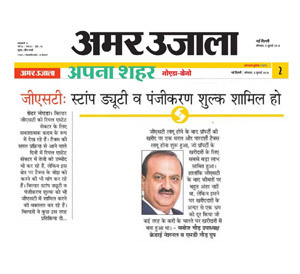 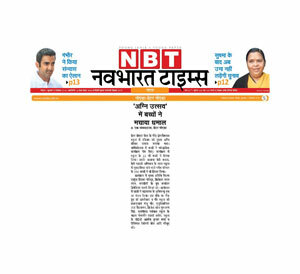 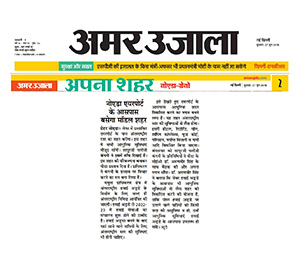 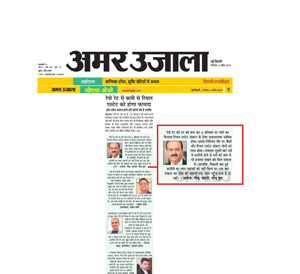 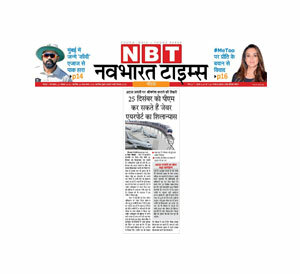 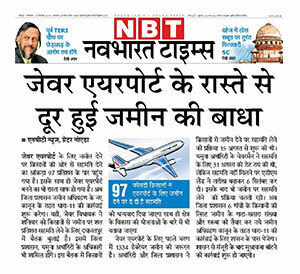 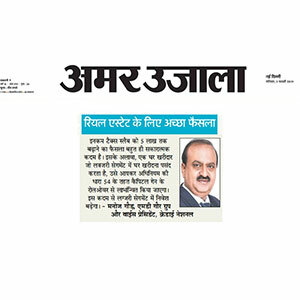 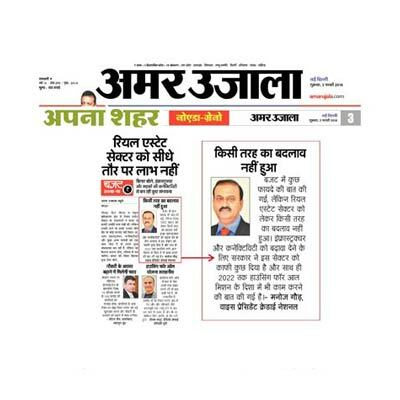 Amar Ujala: The budget lowers tax burden, a good decision for the real estate sector. 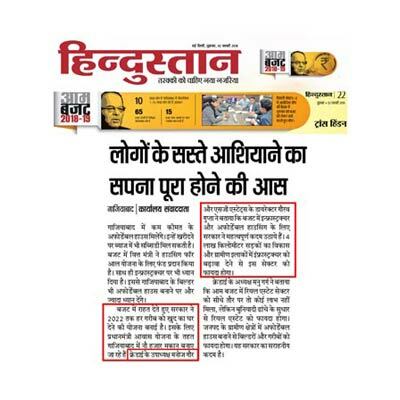 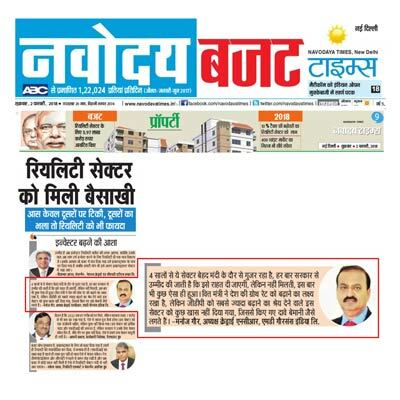 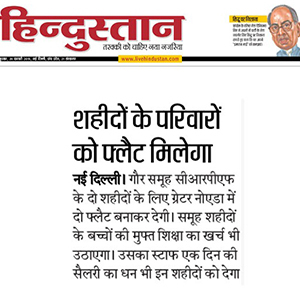 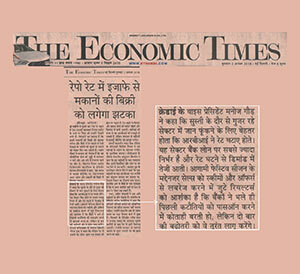 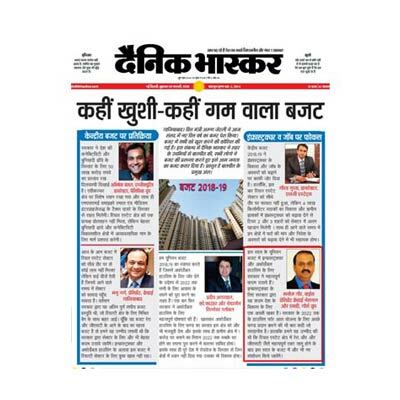 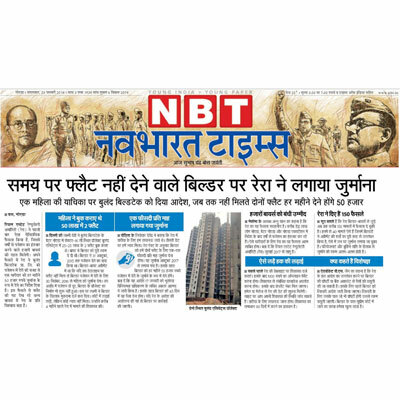 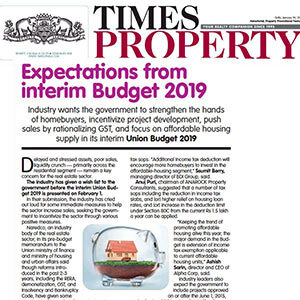 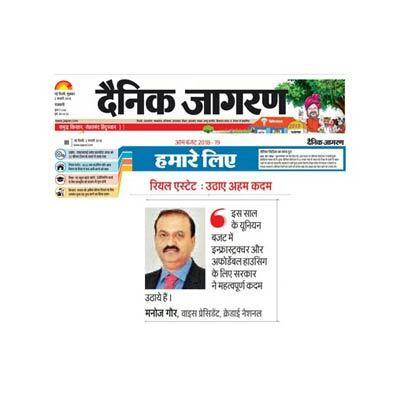 Dainik Jagran: The Interim Budget will give a positive push to the real estate sector. 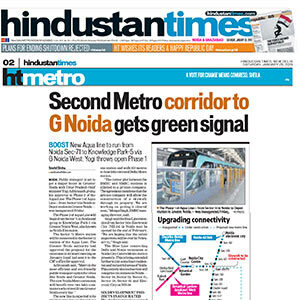 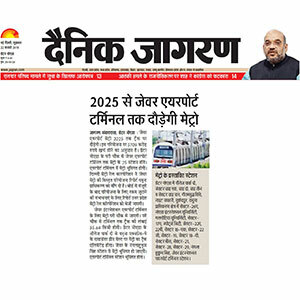 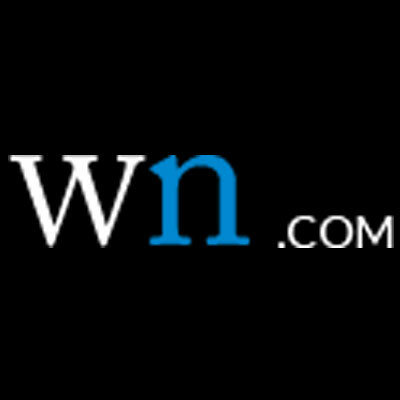 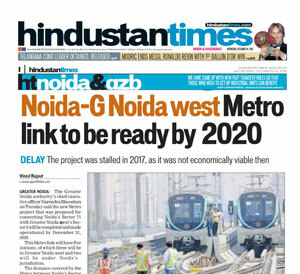 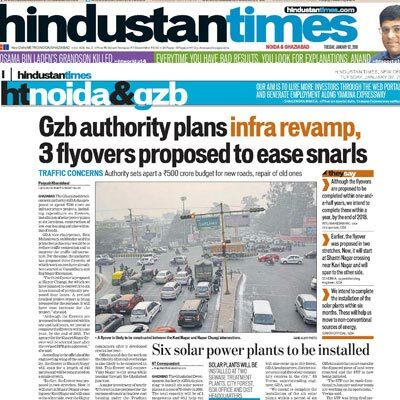 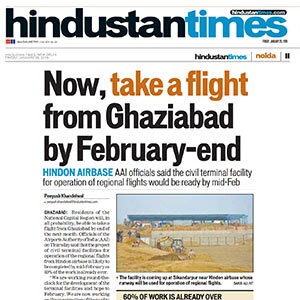 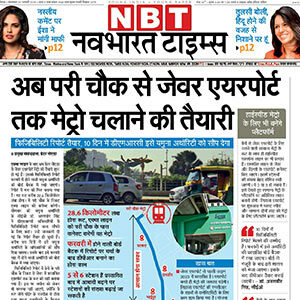 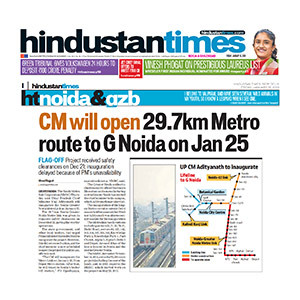 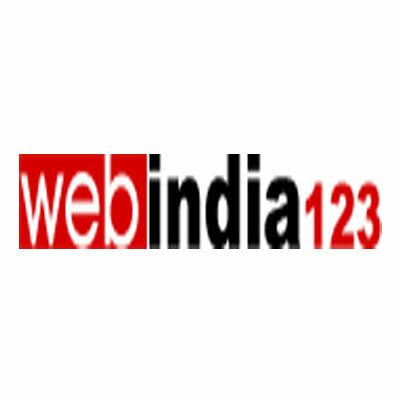 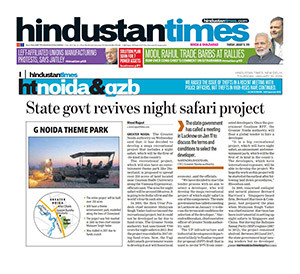 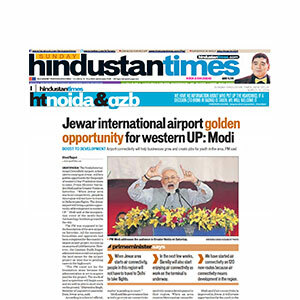 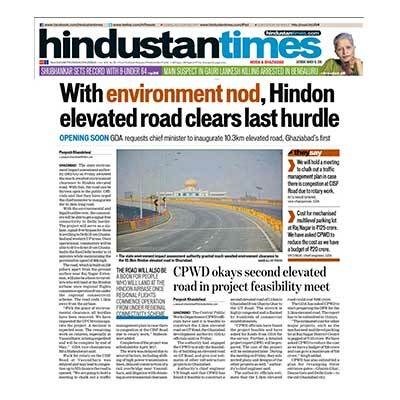 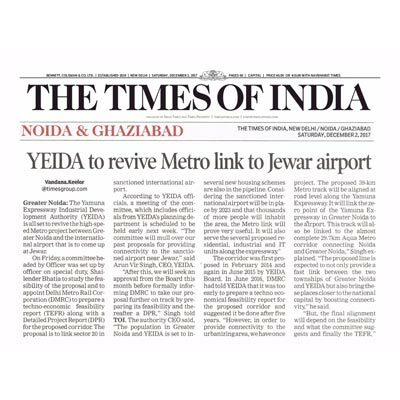 HindustanTimes: Noida-G Noida West Metro link to be ready by 2020. 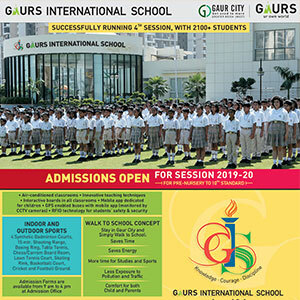 Hindustan: 2200 students participated in the 2nd annual day function of Gaurs International School. 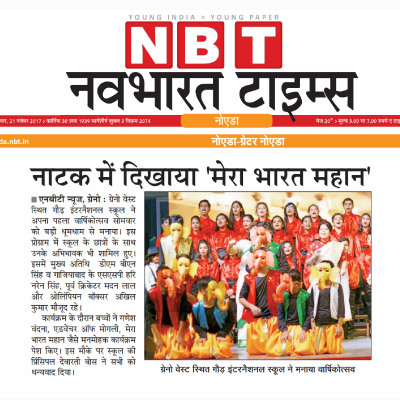 NBT: Students of Gaurs International School made their 2nd annual day function a great success with their performances. 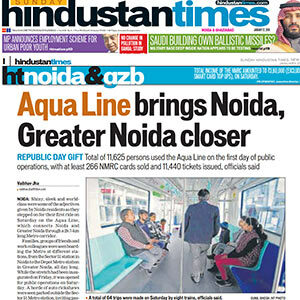 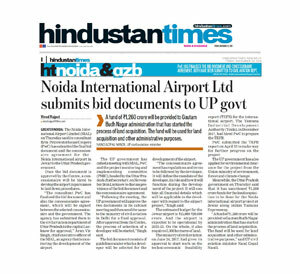 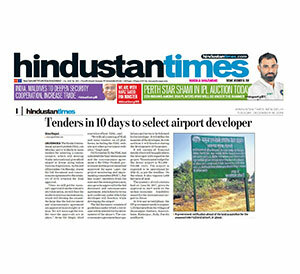 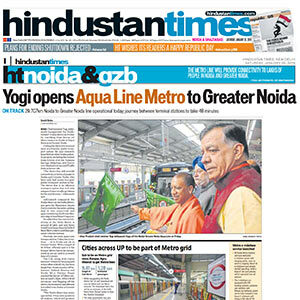 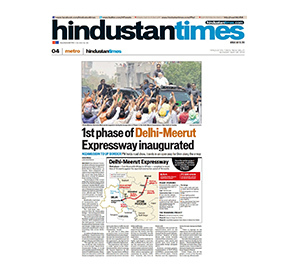 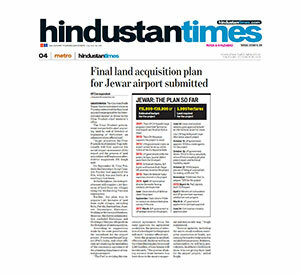 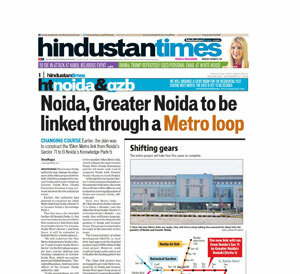 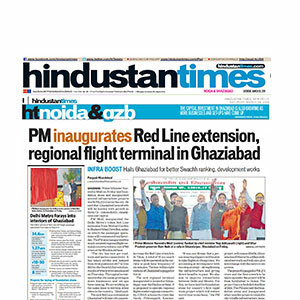 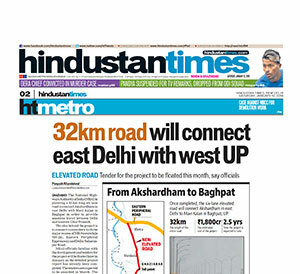 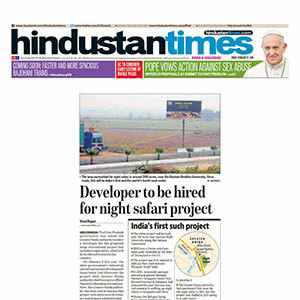 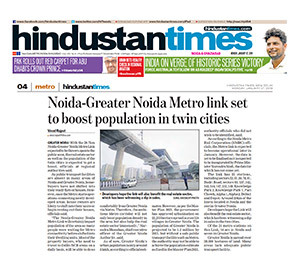 HindustanTimes: Noida, Greater Noida to be linked through a Metro loop. 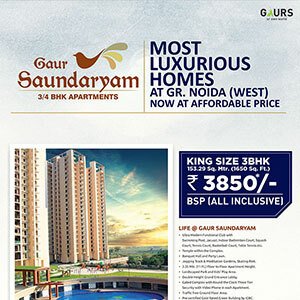 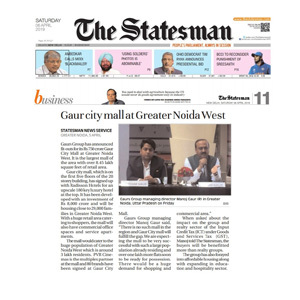 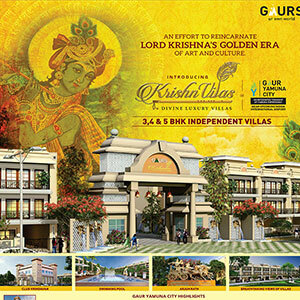 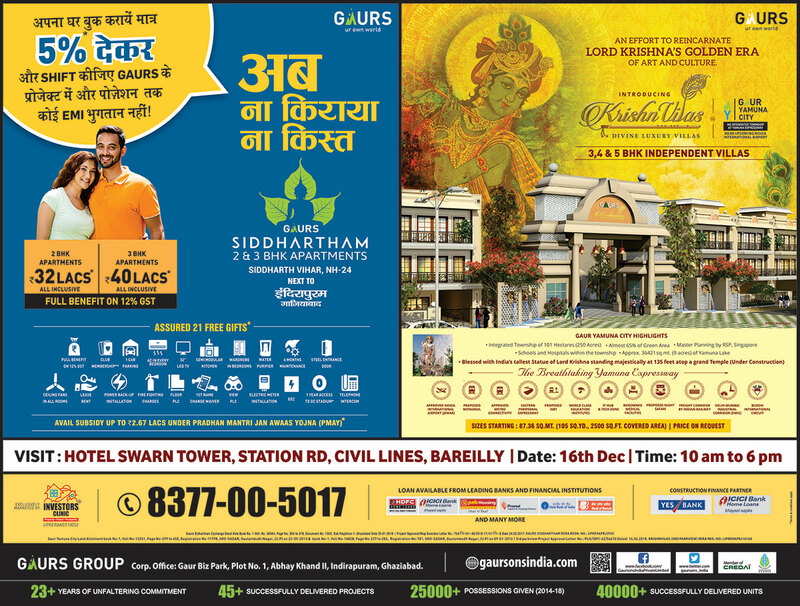 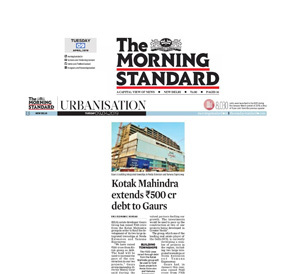 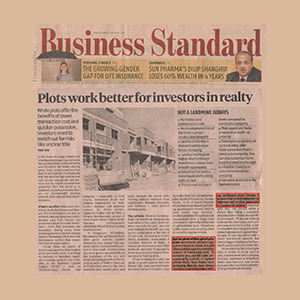 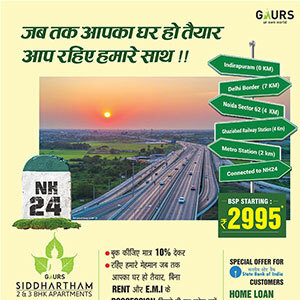 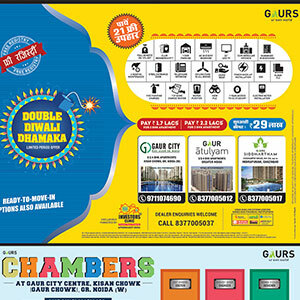 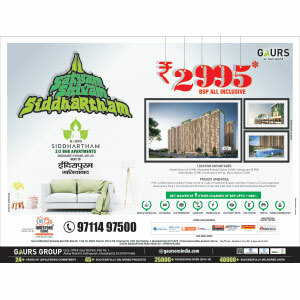 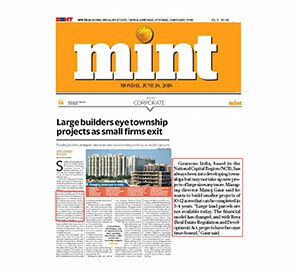 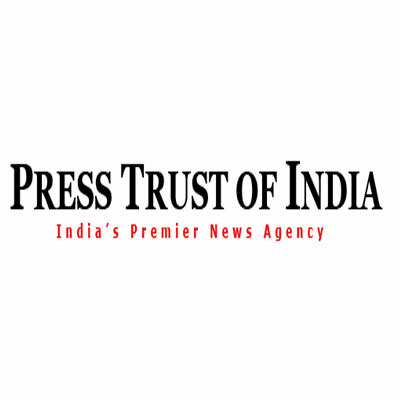 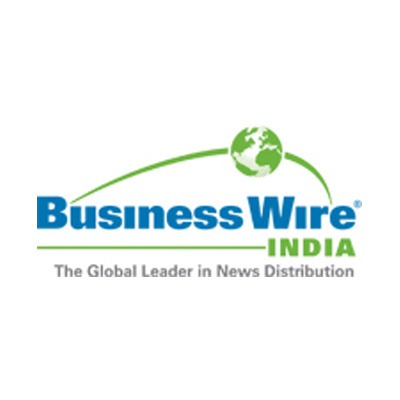 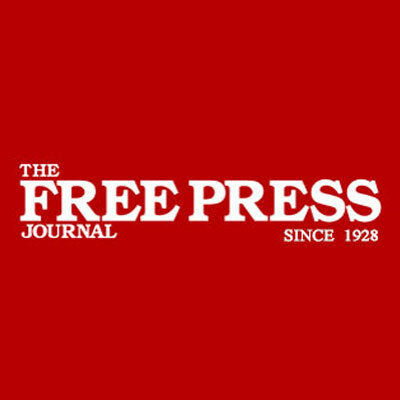 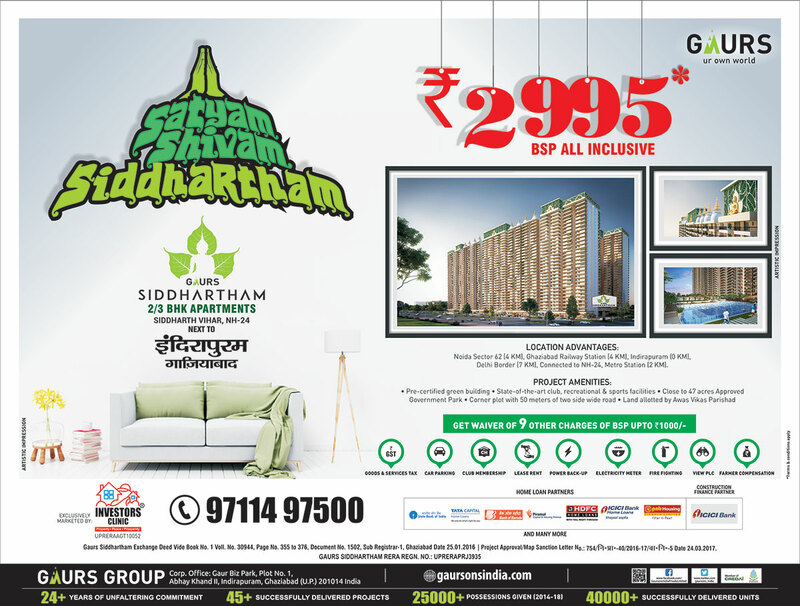 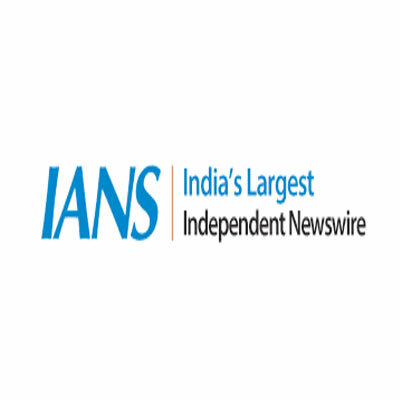 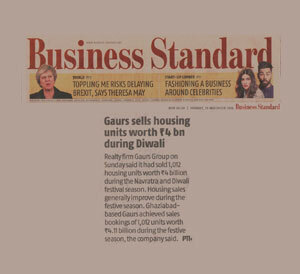 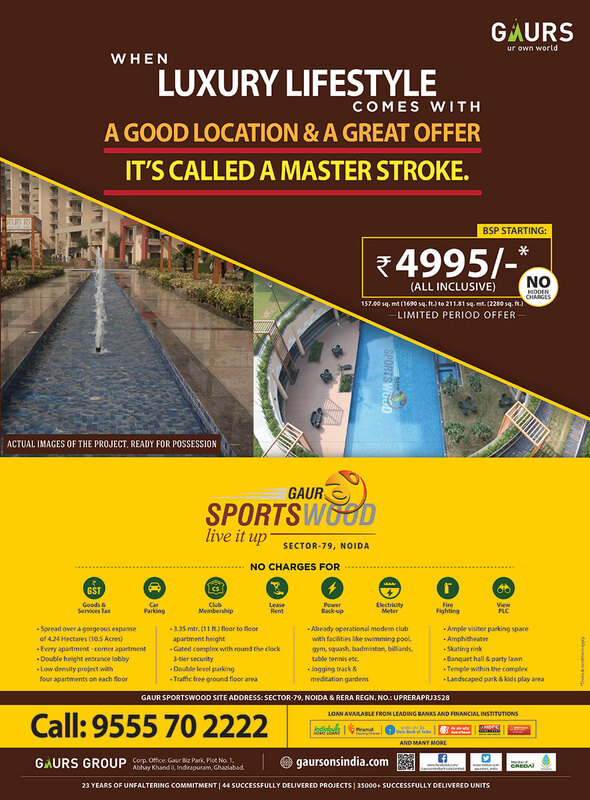 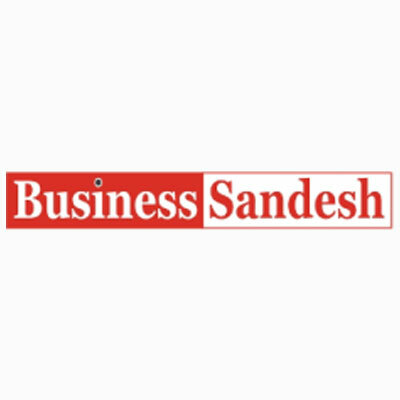 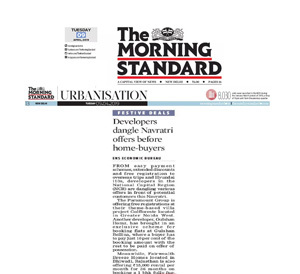 Business Standard: Gaurs Sells housing units worth Rs. 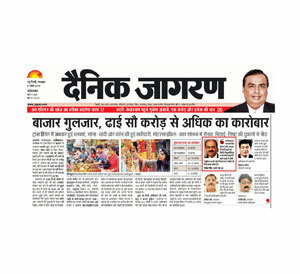 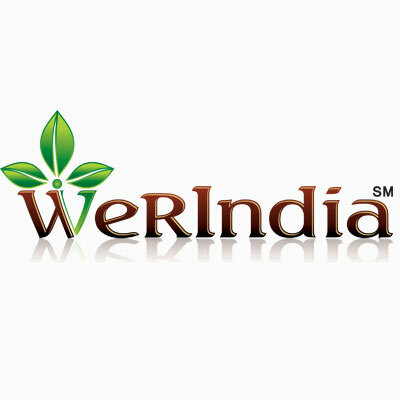 4 billion during Diwali. 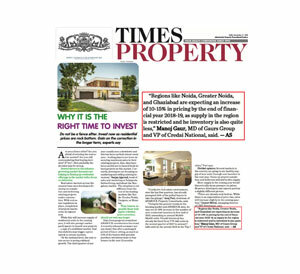 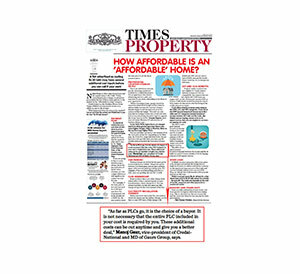 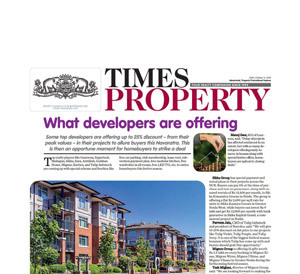 Times Property: Why is it the right time to invest? 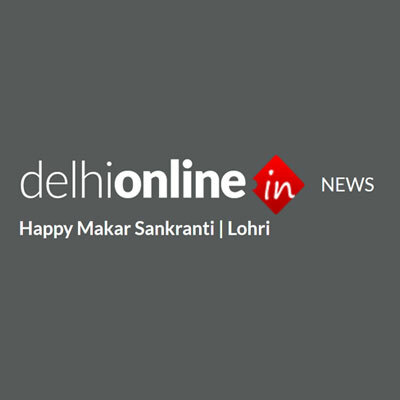 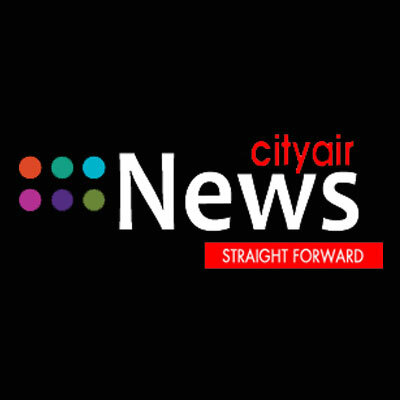 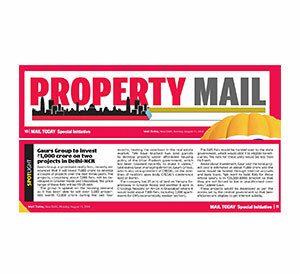 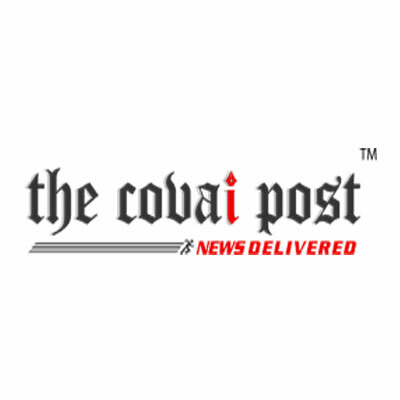 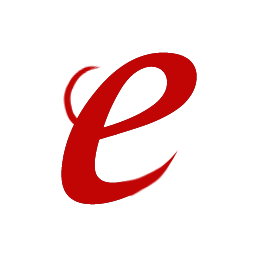 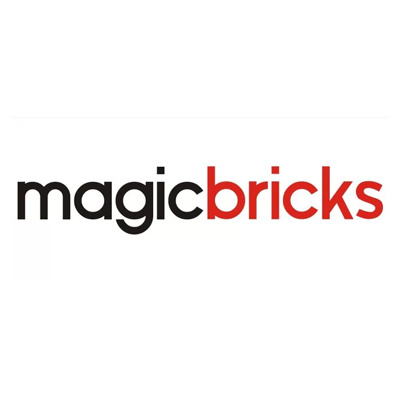 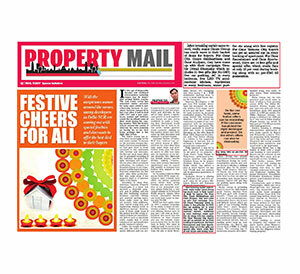 Property Mail: Festive cheers for all.. 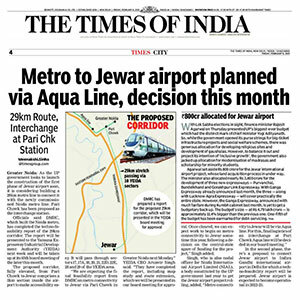 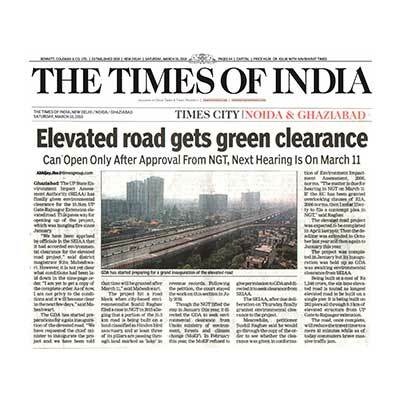 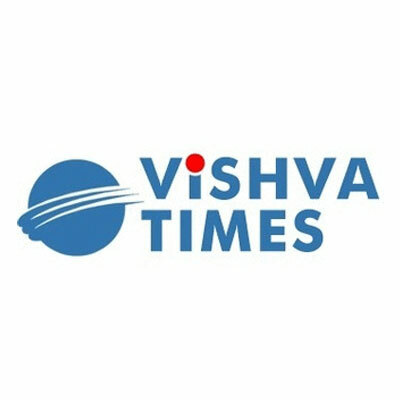 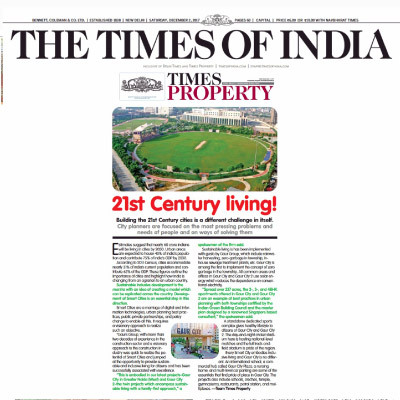 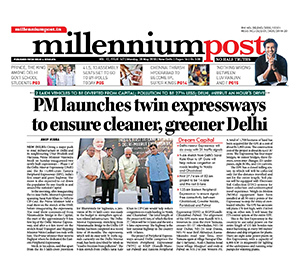 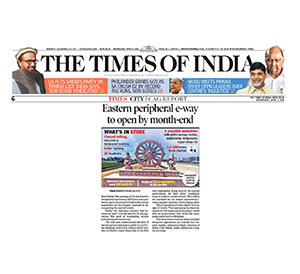 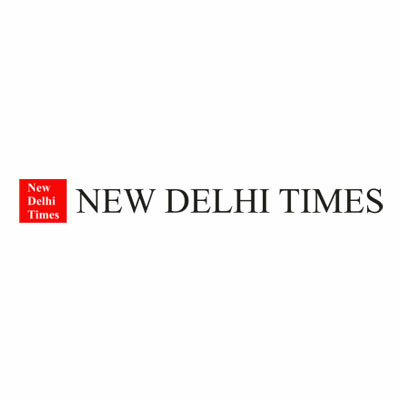 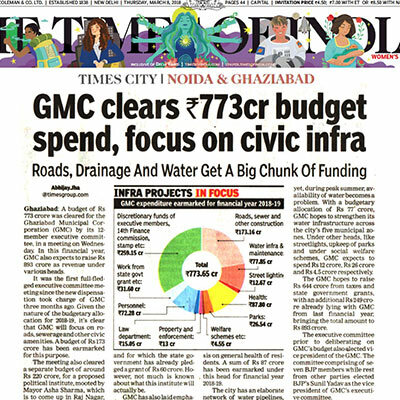 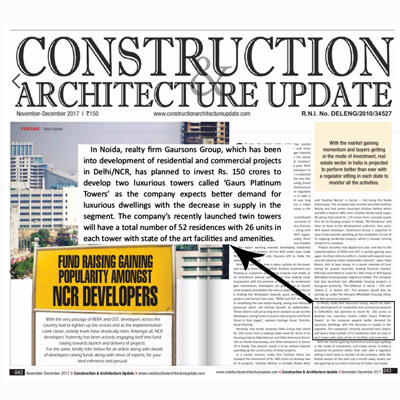 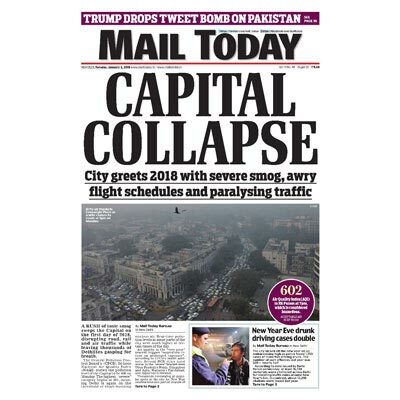 The Times Of India: Building the 21st Century cities is a different challenge in itself. 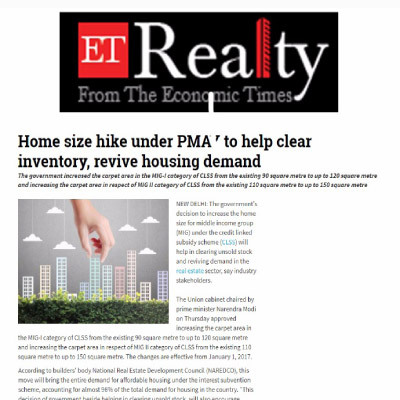 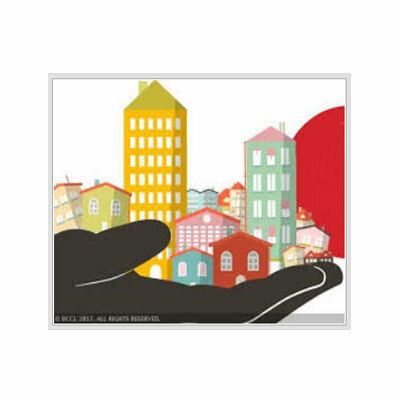 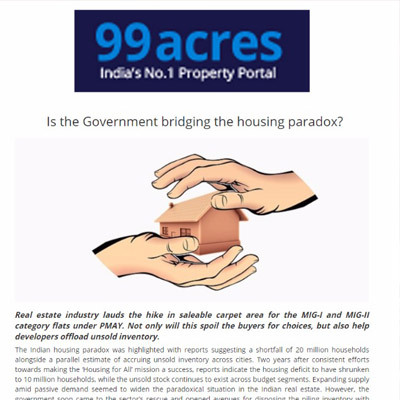 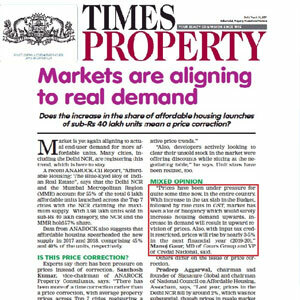 ET Realty: Home Size hike under PMA' to help clear inventory,..
99acre: Is the Government bridging the housing paradox? 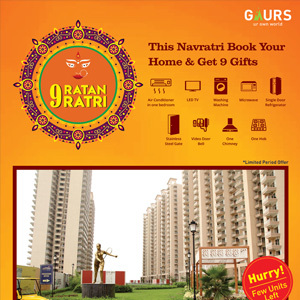 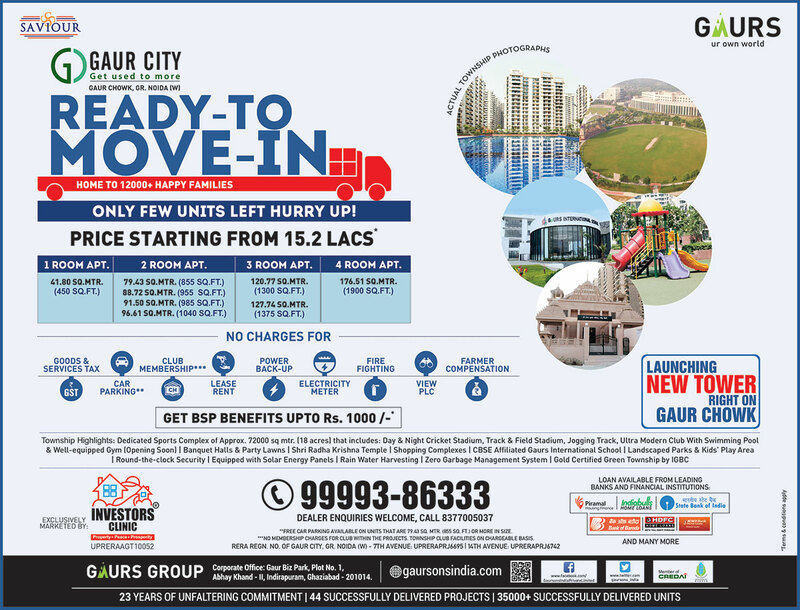 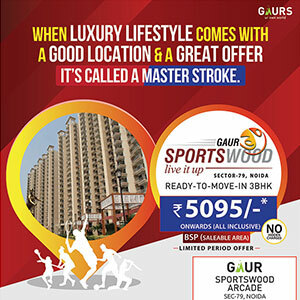 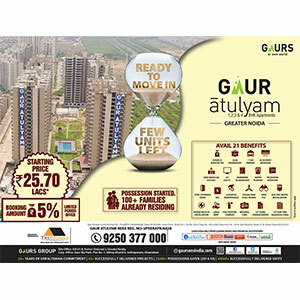 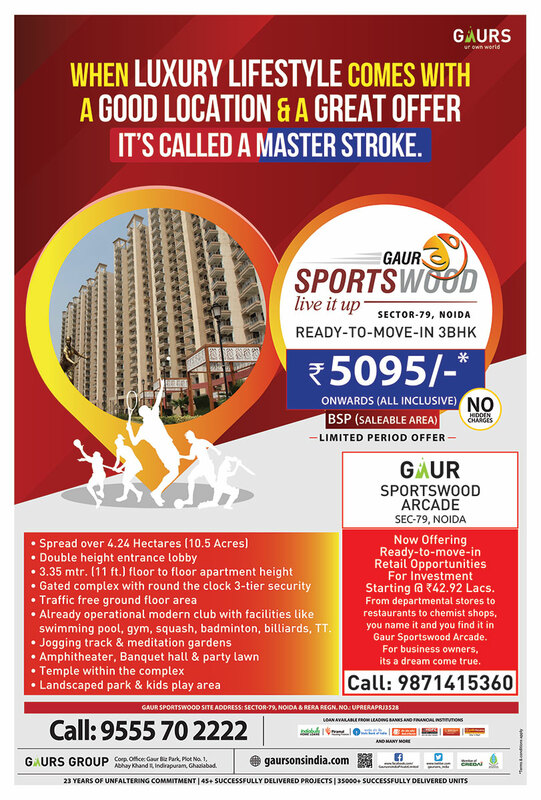 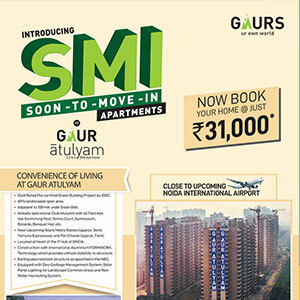 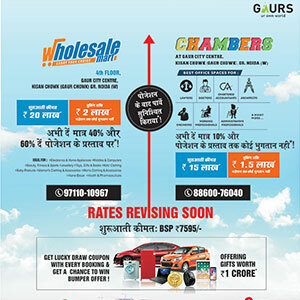 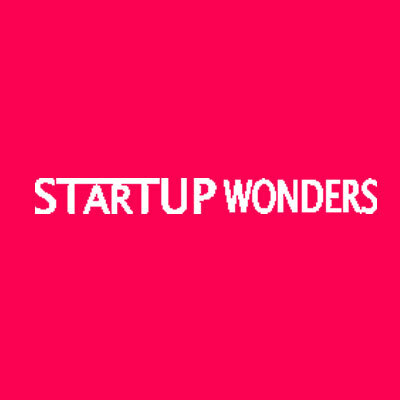 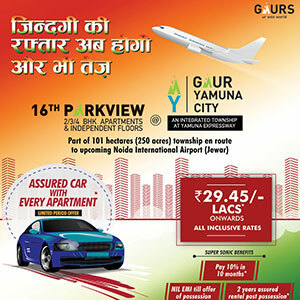 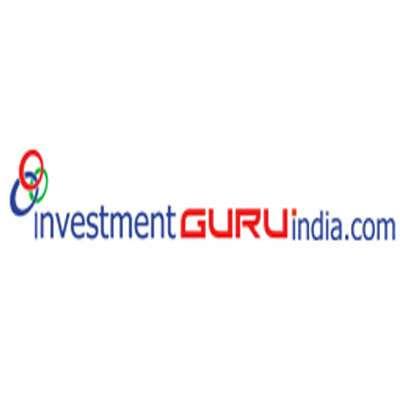 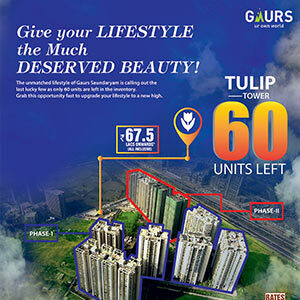 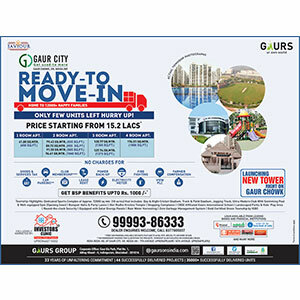 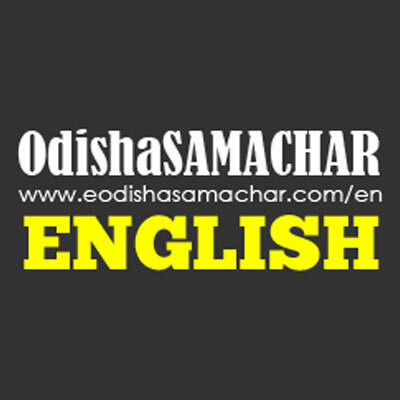 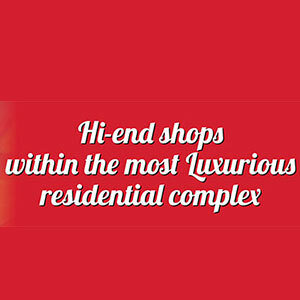 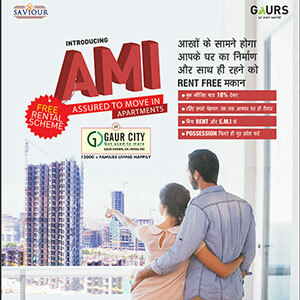 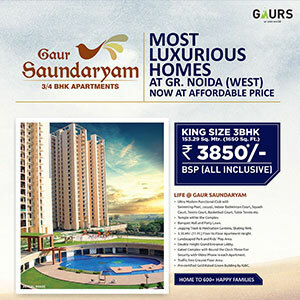 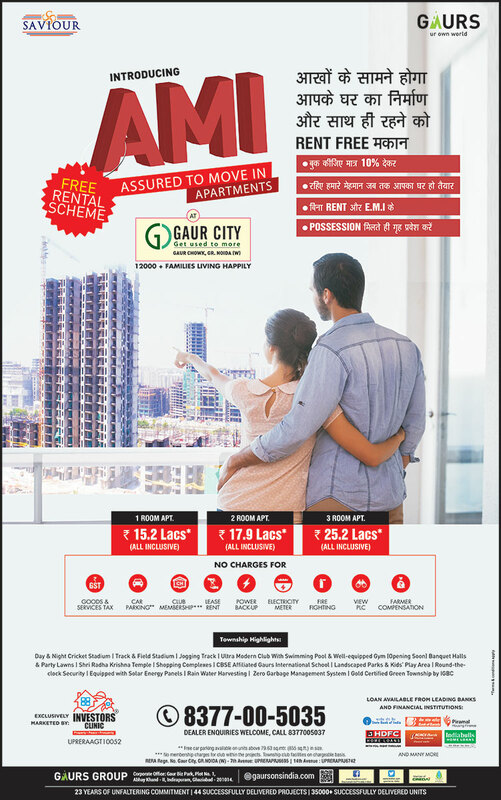 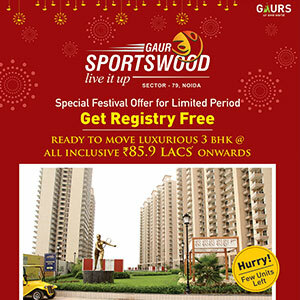 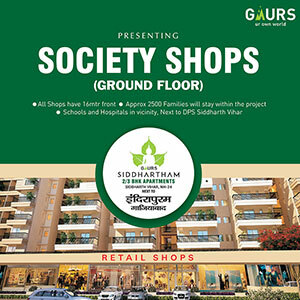 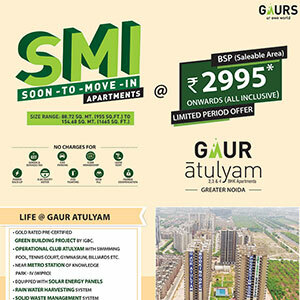 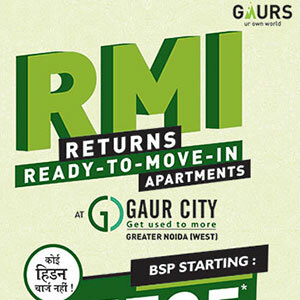 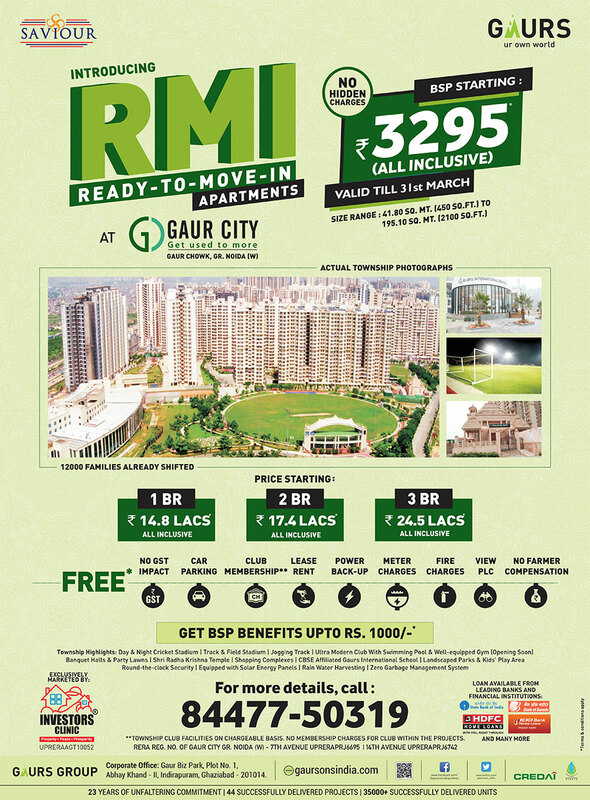 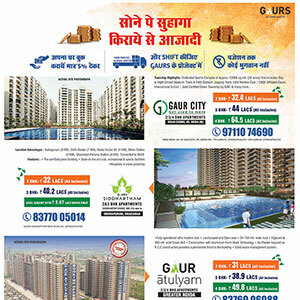 Gaurs to launch apartments in 20-30 lakh range. 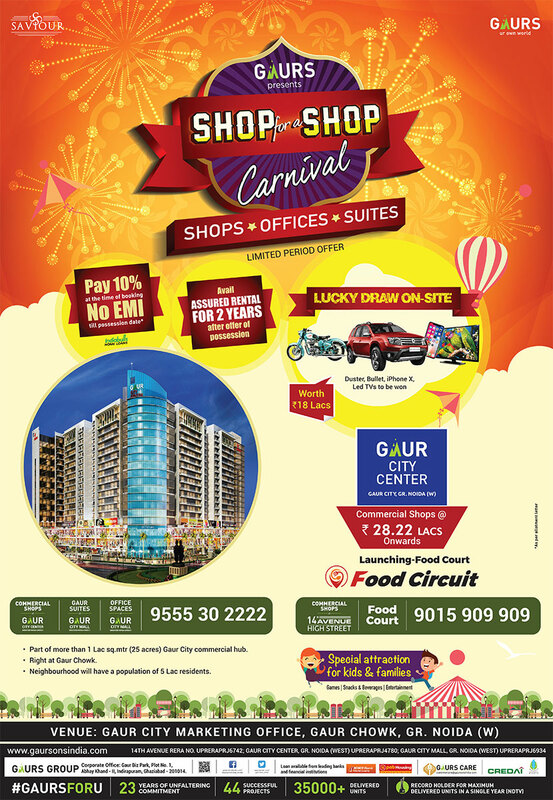 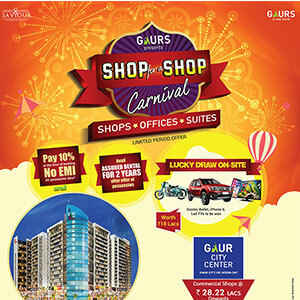 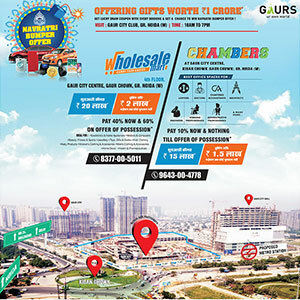 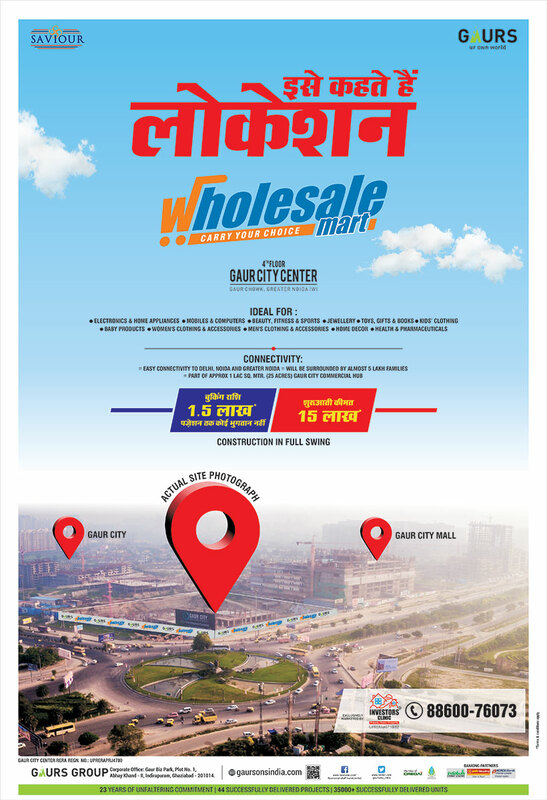 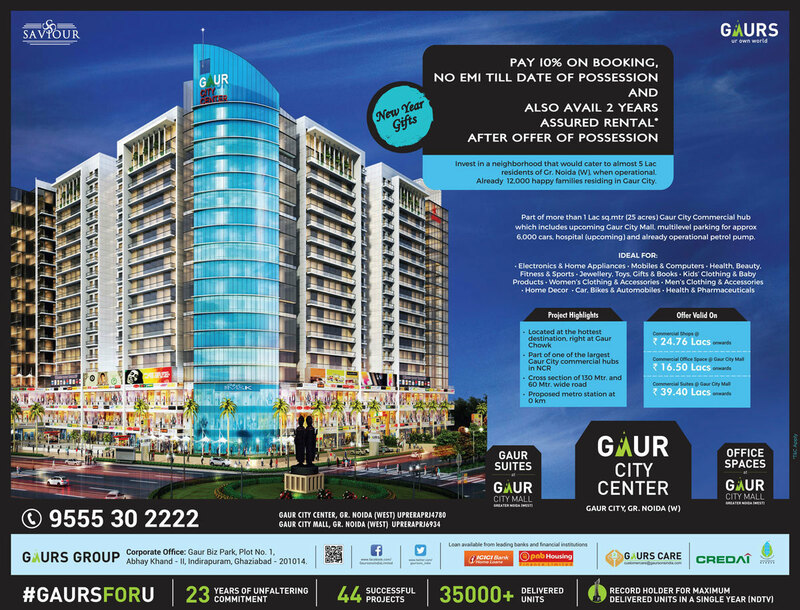 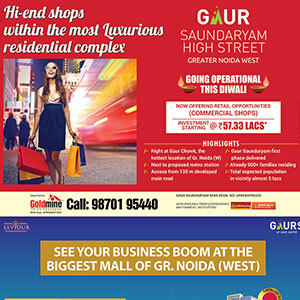 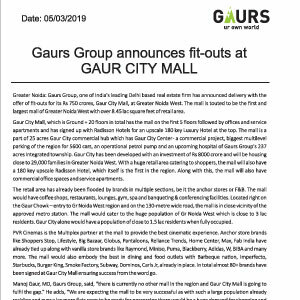 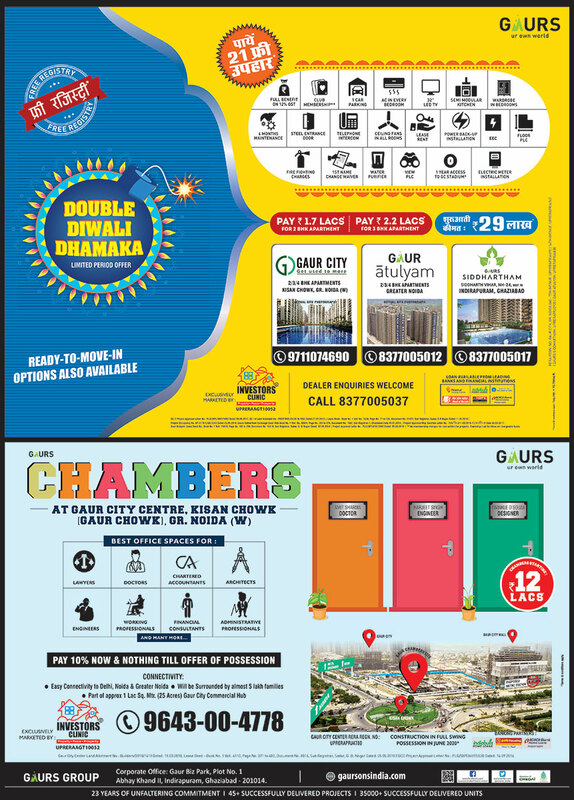 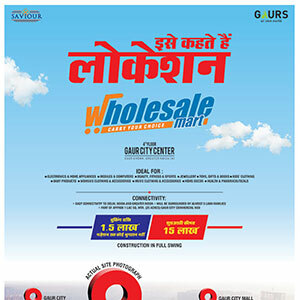 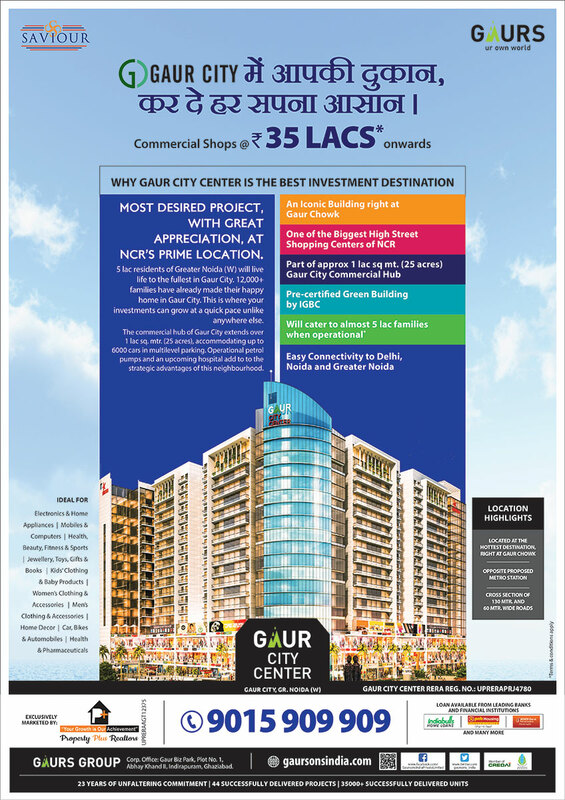 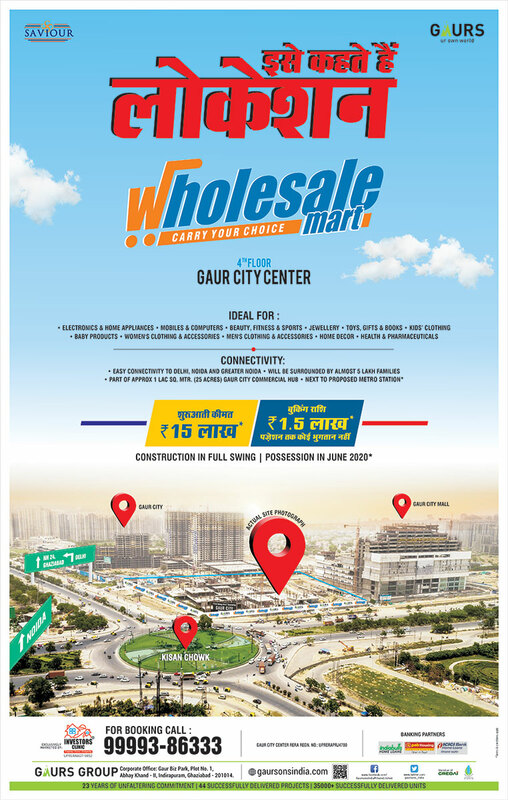 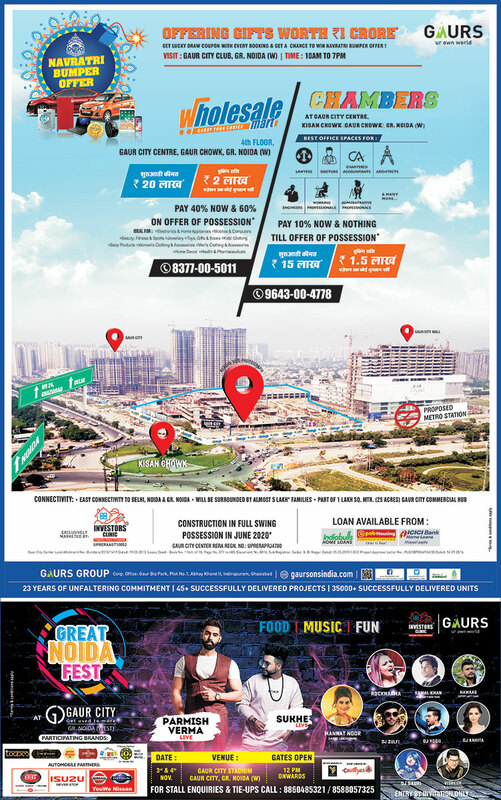 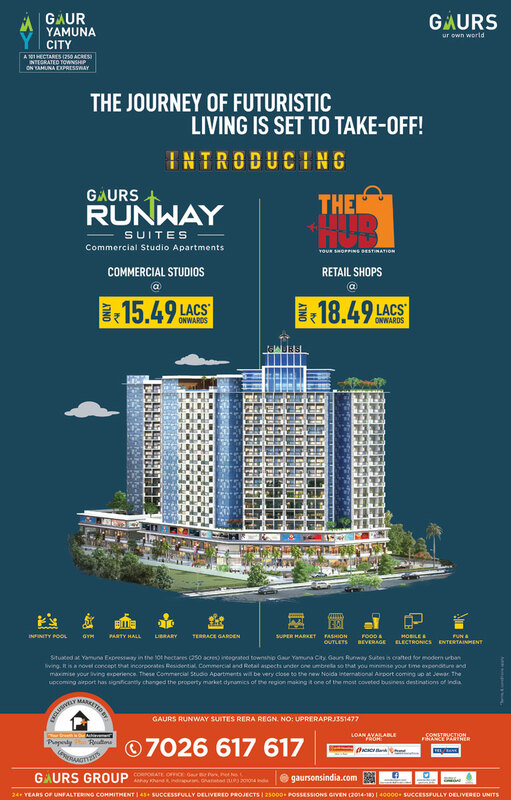 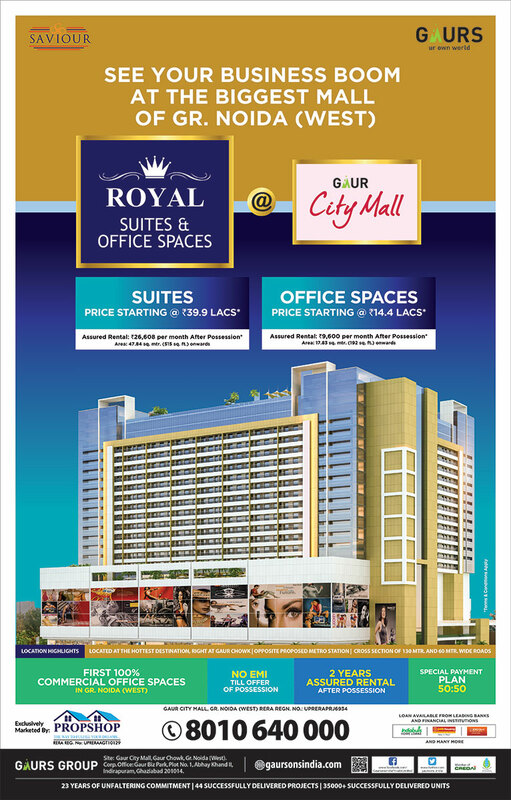 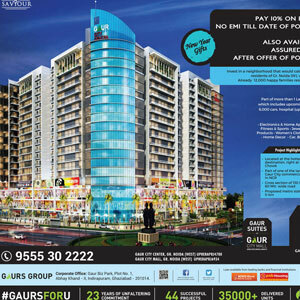 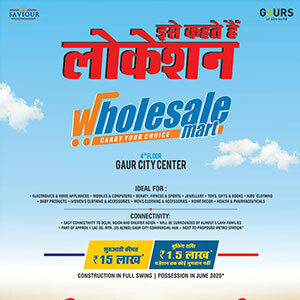 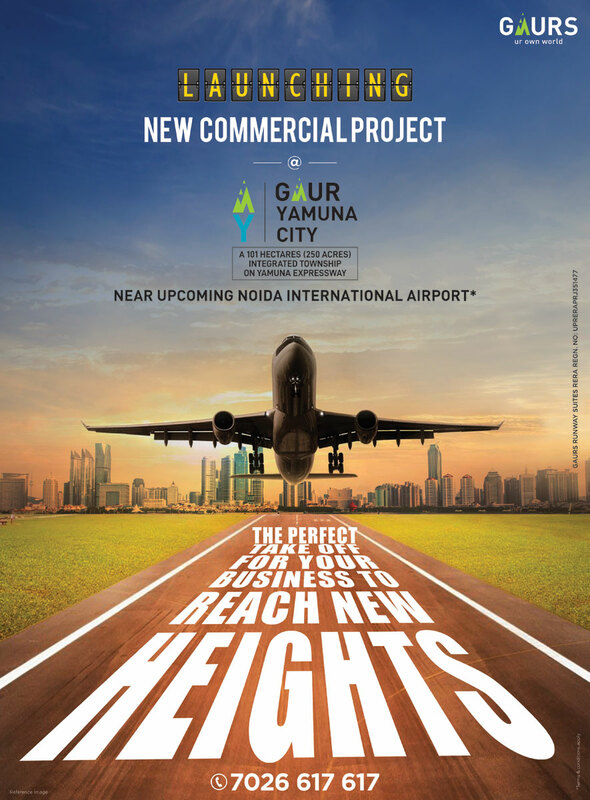 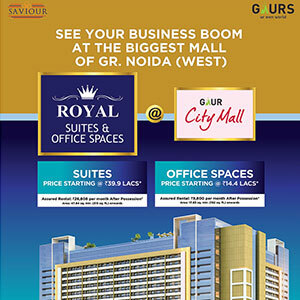 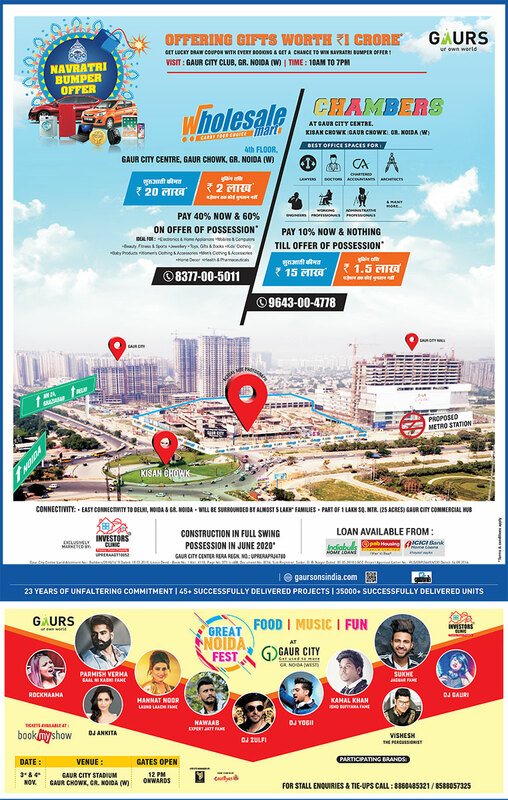 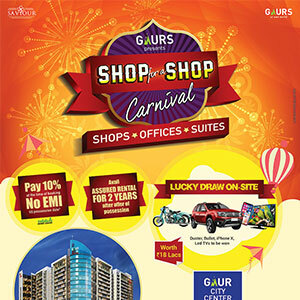 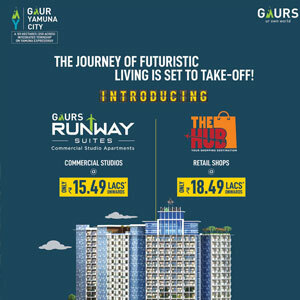 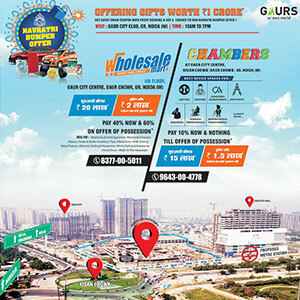 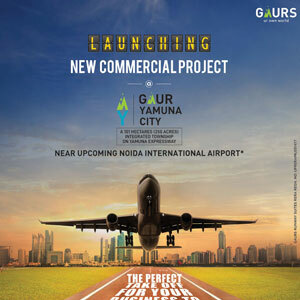 Gaurs Group announces fit-outs at Gaur City Mall. 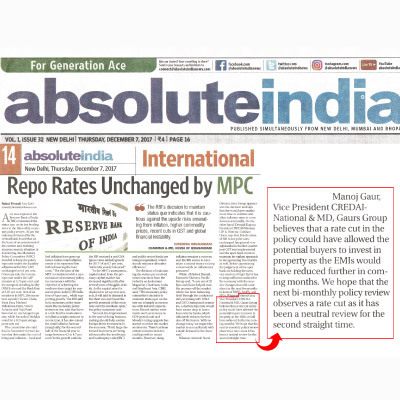 Will your home loan EMI come down post-RBI repo rate cut? 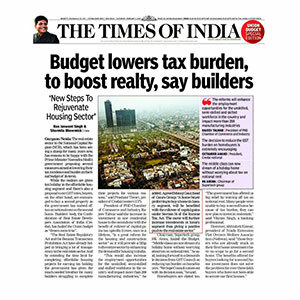 Good news from GST Council meet - Big relief for homebuyers! 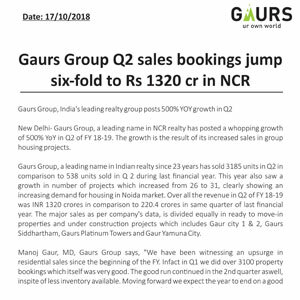 Gaurs Group sells over 10,000 units for a gross sales revenue of more than half a billion dollars in CY 2018. 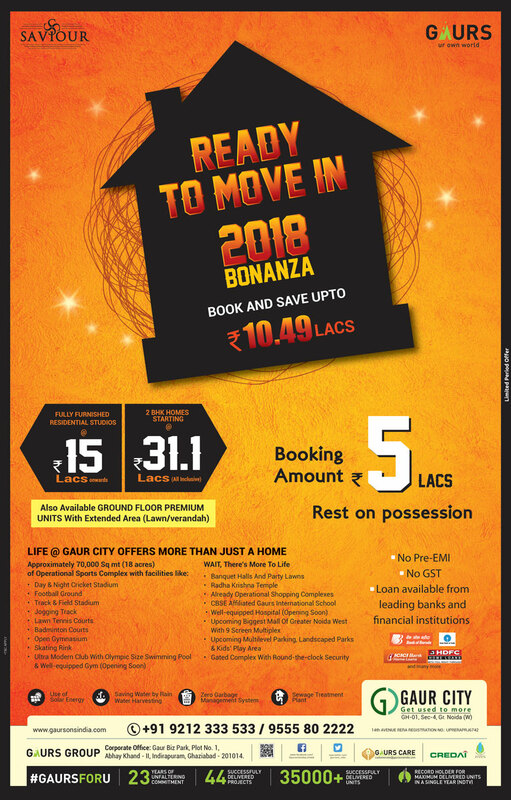 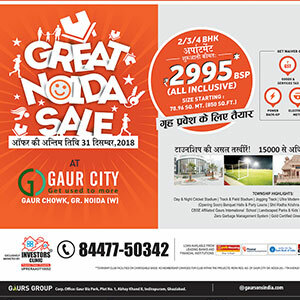 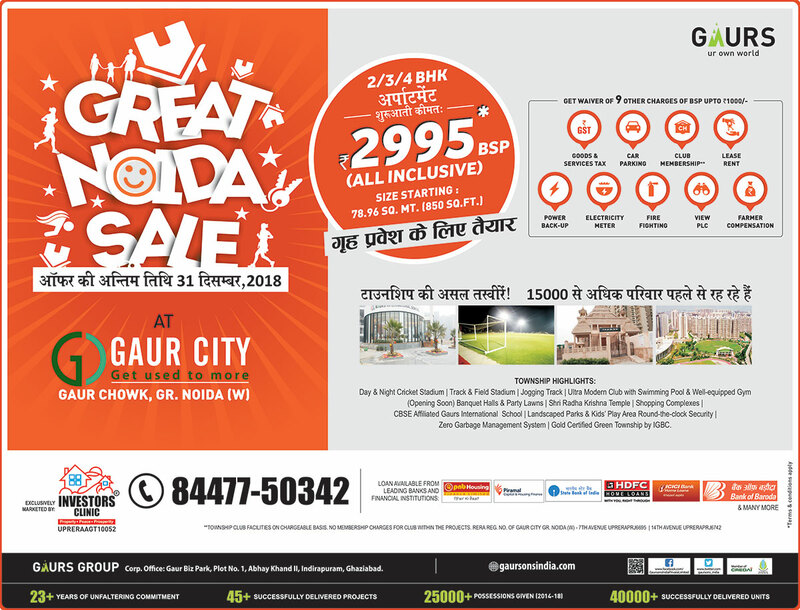 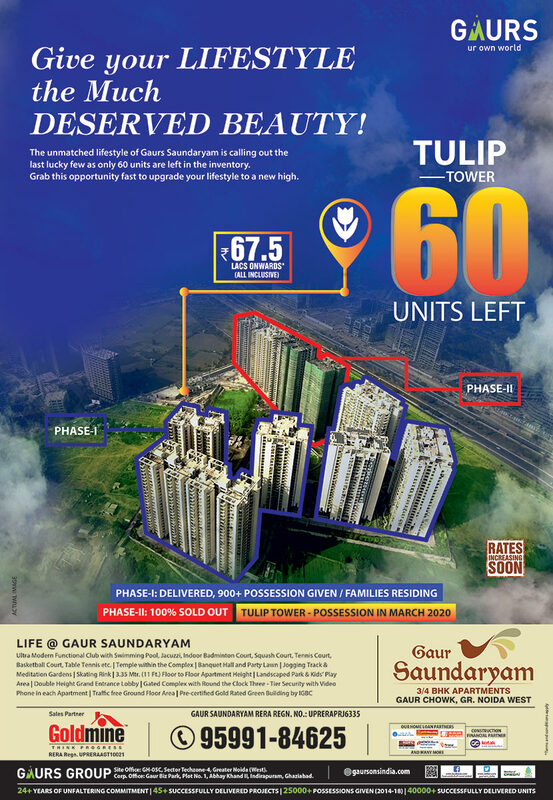 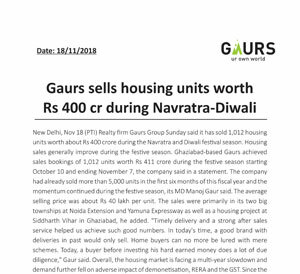 Gaurs Group: Taking Giant Strides by Selling 10000 Property Units in 2018. 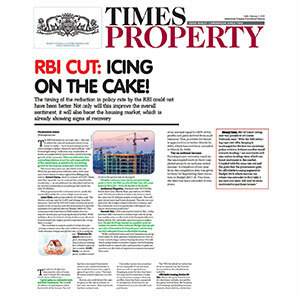 Repo rate cut to lower homebuyers' mortgage, developers' working capital cost. 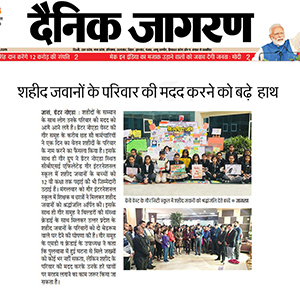 20 talented girls of Gaurs International School’s evening classes welcomed the Hon’ble Prime Minister, Shri Narender Modi and interacted with him at Talkatora Stadium at - CREDAI YOUTHCON 2019. 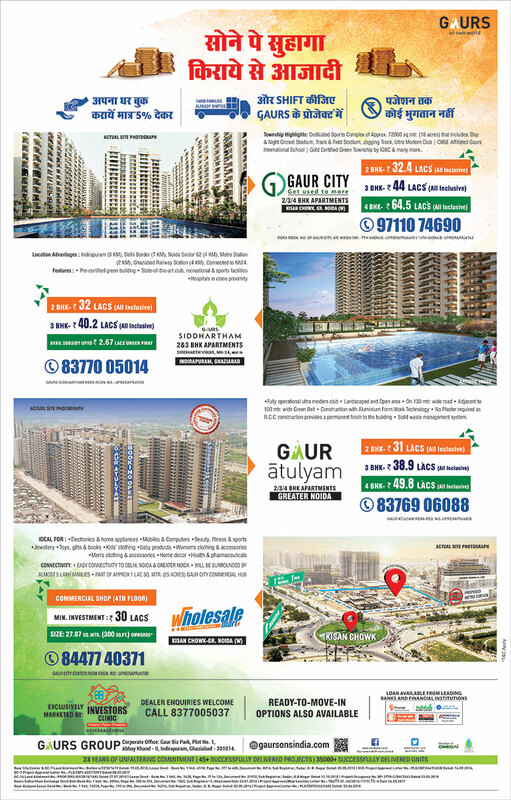 Gaur Cascades bagged the award for the Best Residential Project National - Affordable Segment 2017-18 at 12th CNBC Awaaz Real Estate Awards. 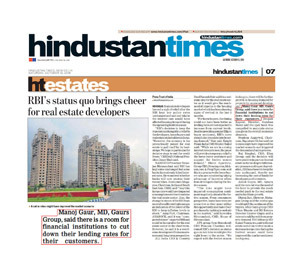 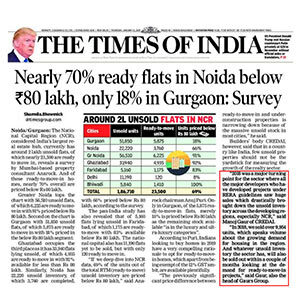 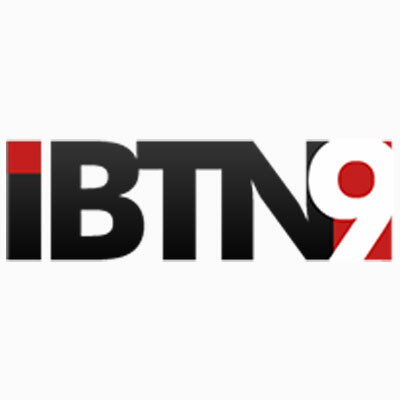 In a story on grading system initiated by UP RERA to rate the developers across Noida, Greater Noida and Ghaziabad, Mr. Manoj Gaur, MD, Gaurs Group and Vice President, CREDAI National has shared his views in leading business news channel, Zee Business. 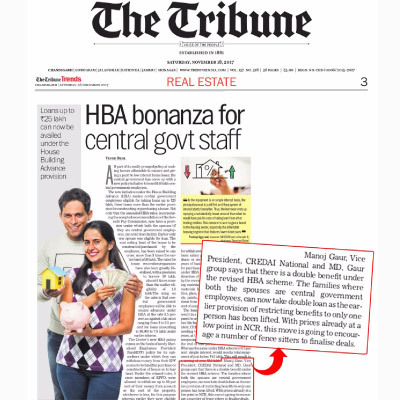 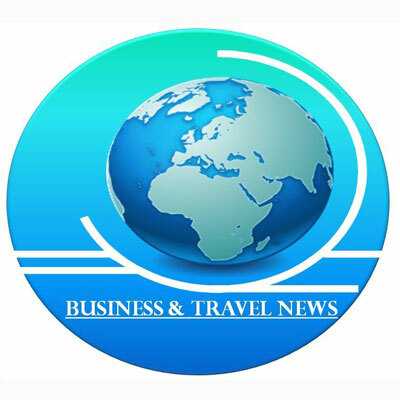 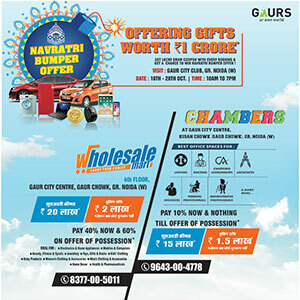 Zee Business exclusively covers our ongoing festive offers along with the views of our MD, Mr. Manoj Gaur. 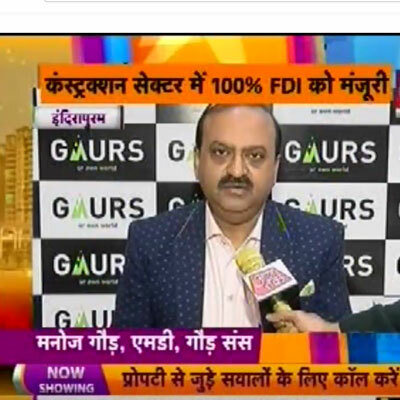 Mr. Manoj Gaur, MD, Gaurs Group in a candid interview with Ms Manisha Natrajan on CNBC TV. 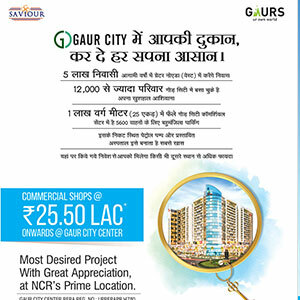 Gaur Cascades bagged the award for the Best Affordable Project of the year, North India at CNBC Awaaz Real Estate Awards 2017-18. 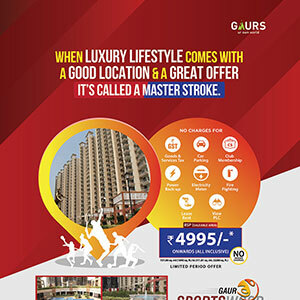 Gaur Cascades bagged the award for the Best Affordable Project of the year at NDTV PROPERTY AWARDS 2017. 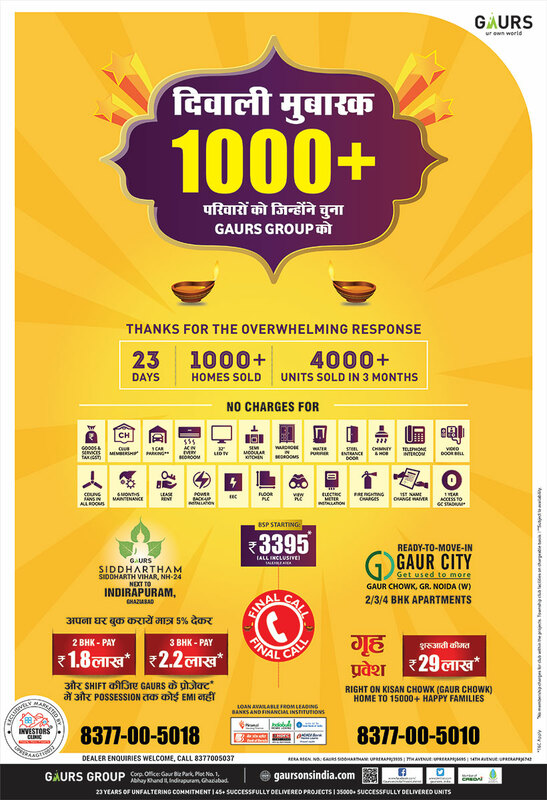 Views of Mr. Manoj Gaur got exclusively featured on Dilli Aajtak's property show #AapkiProperty on the rapid rise in sales and deliveries of properties during Navratras. 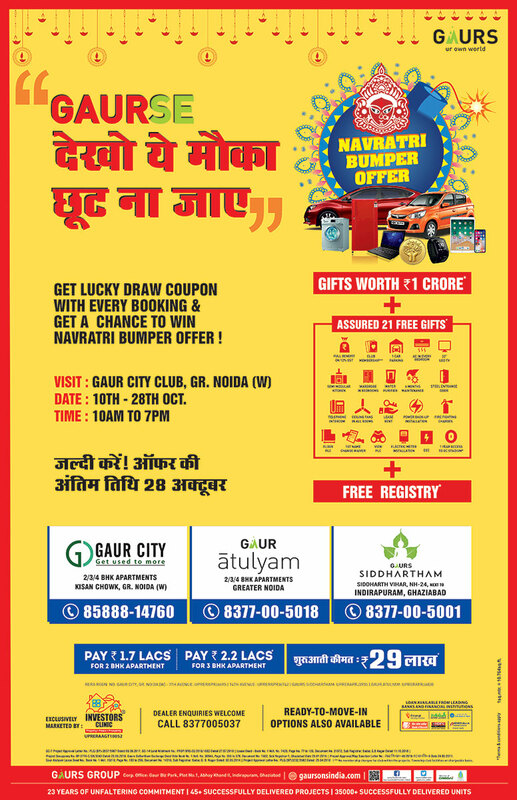 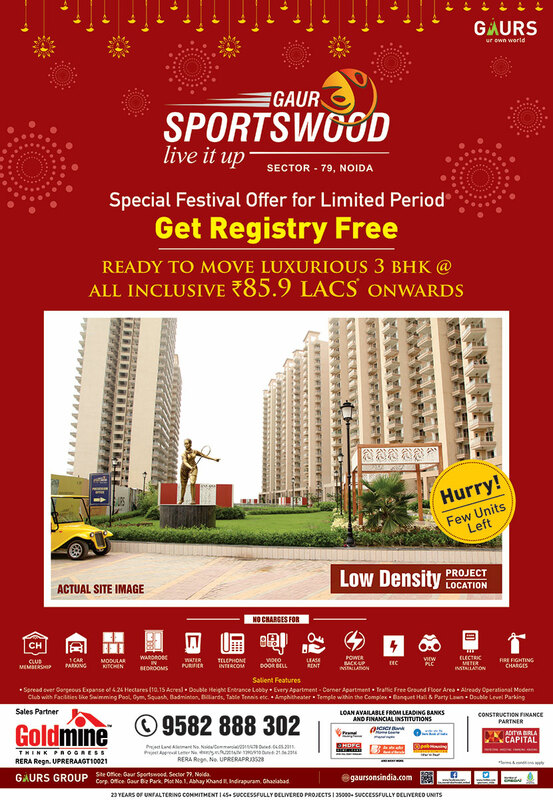 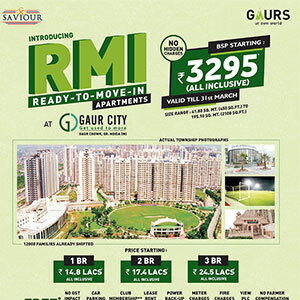 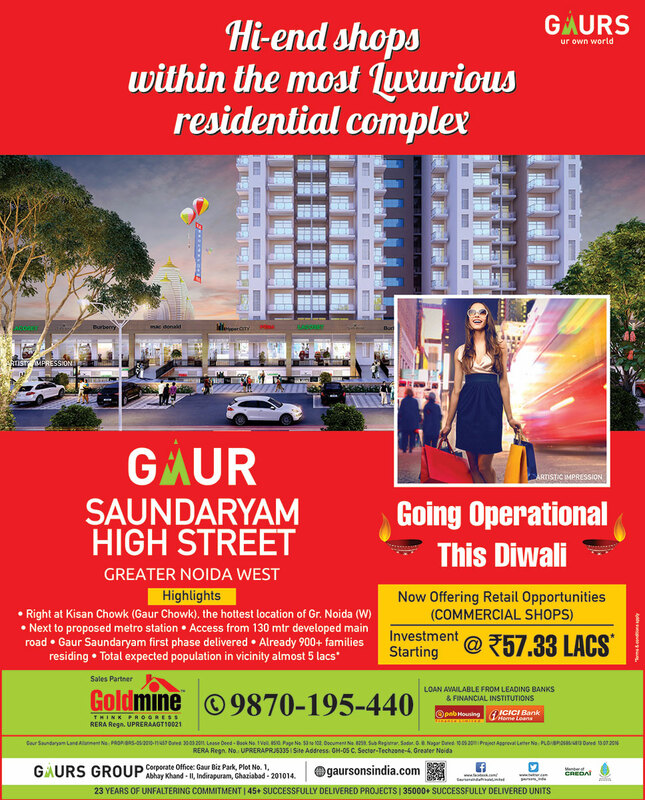 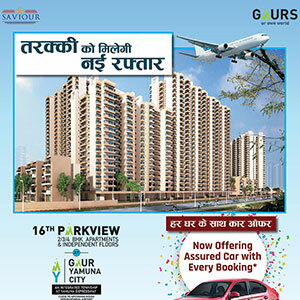 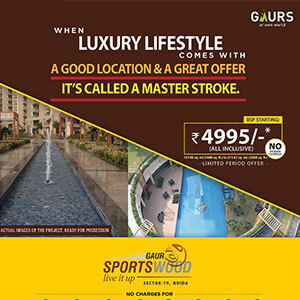 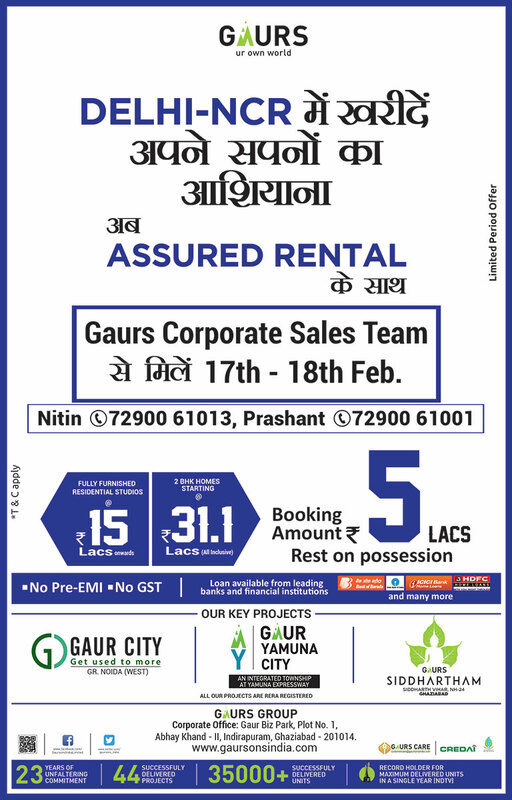 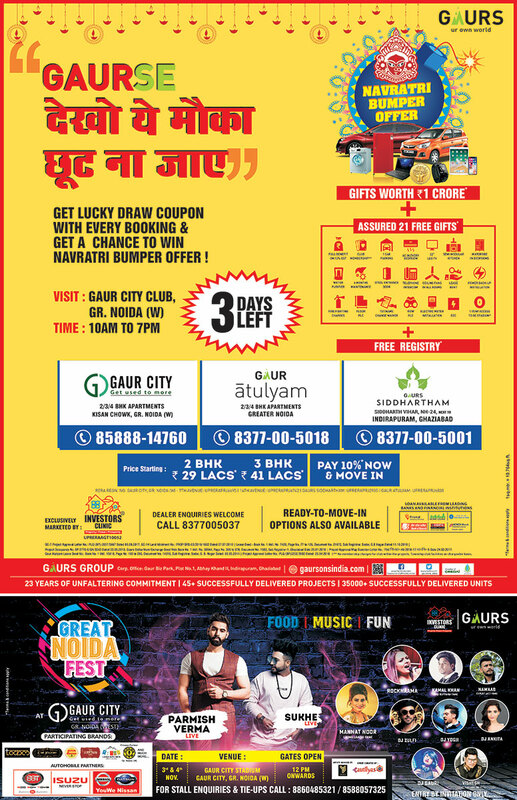 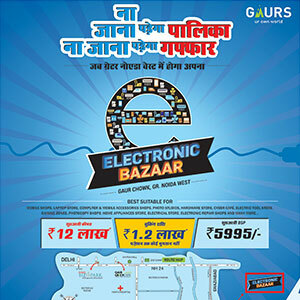 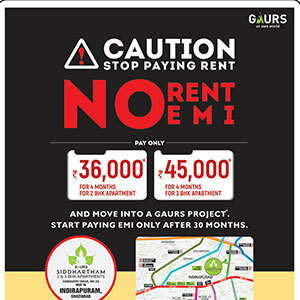 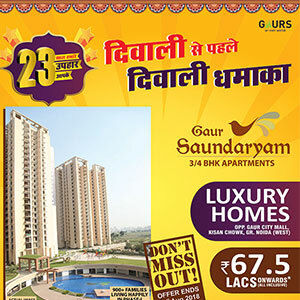 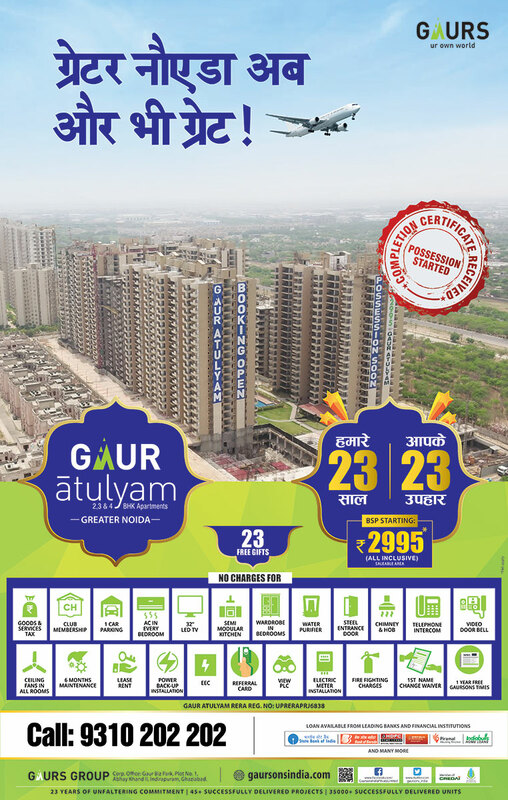 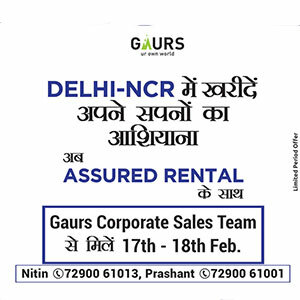 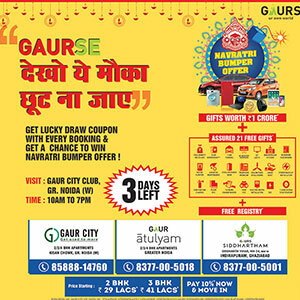 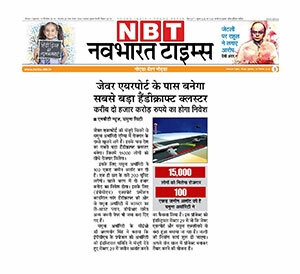 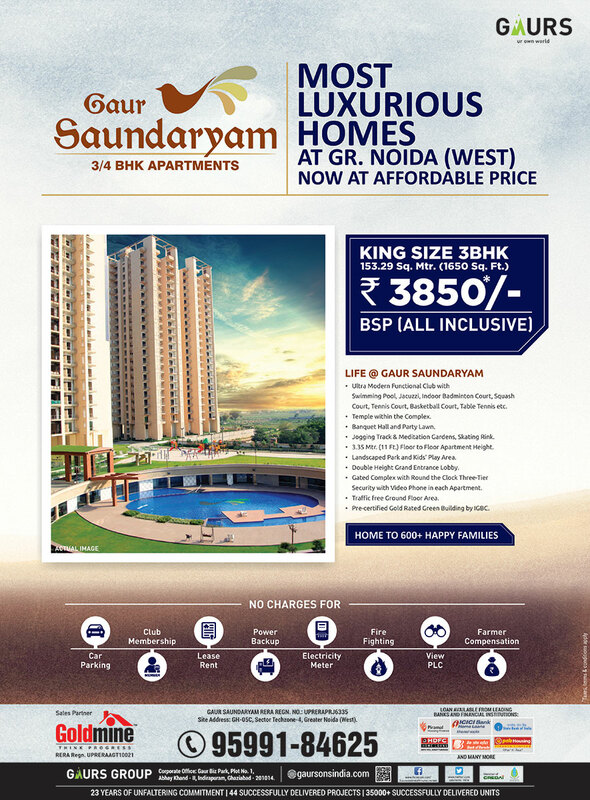 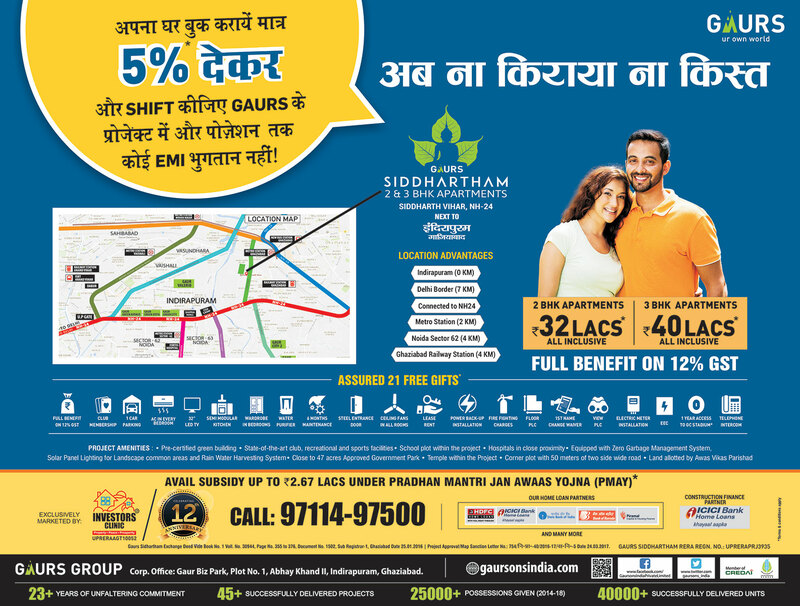 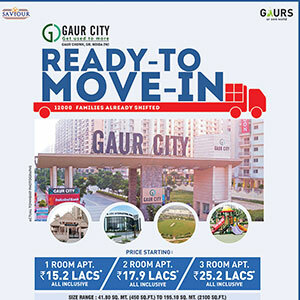 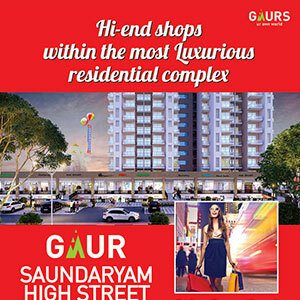 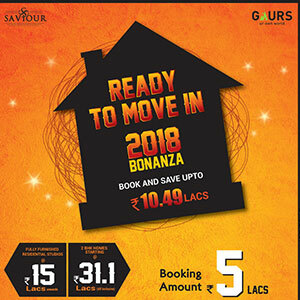 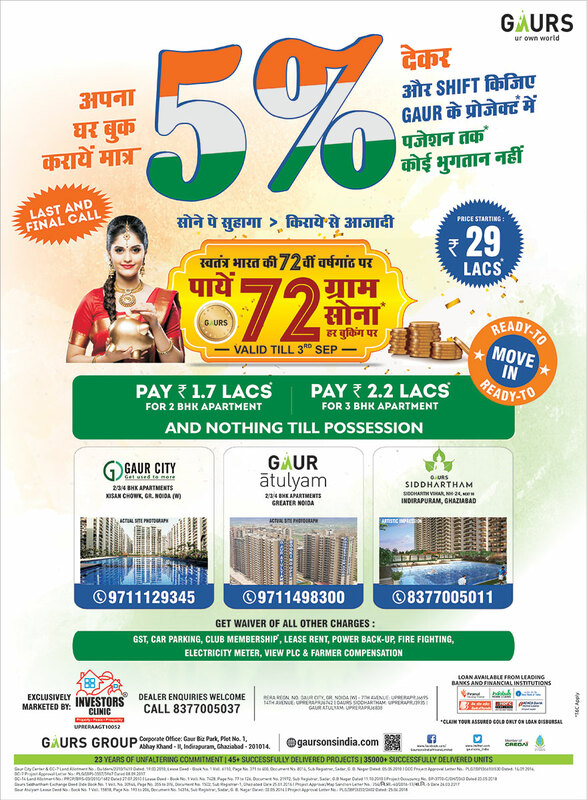 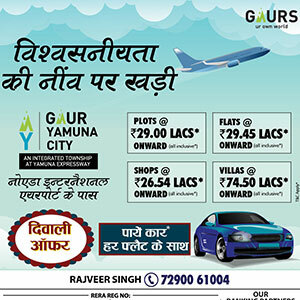 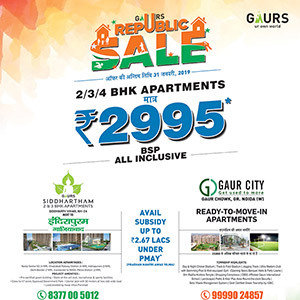 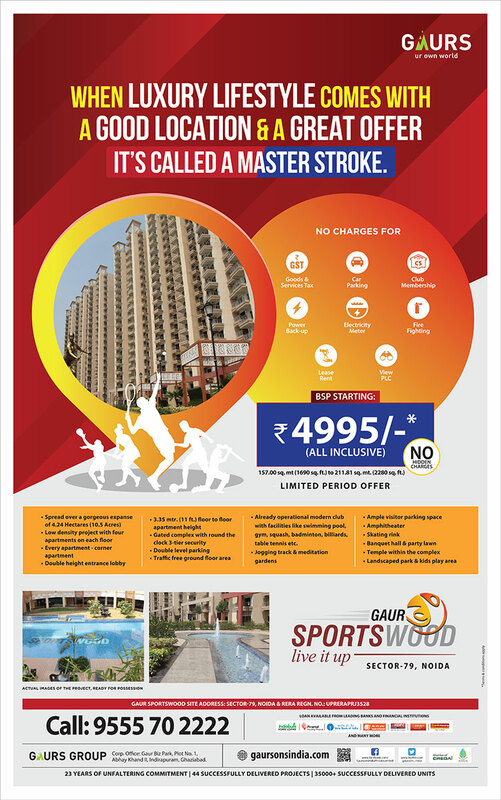 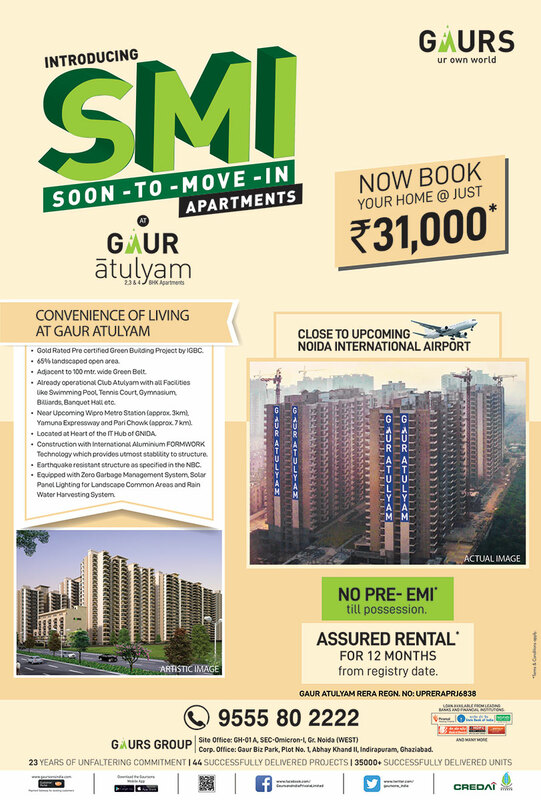 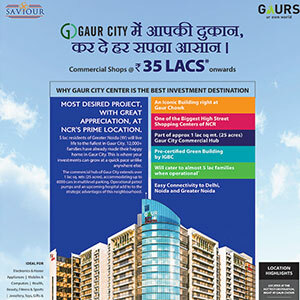 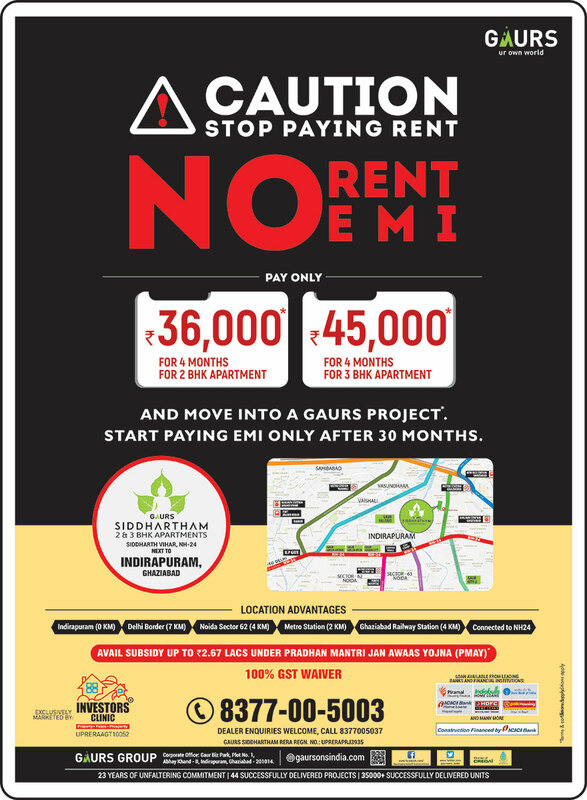 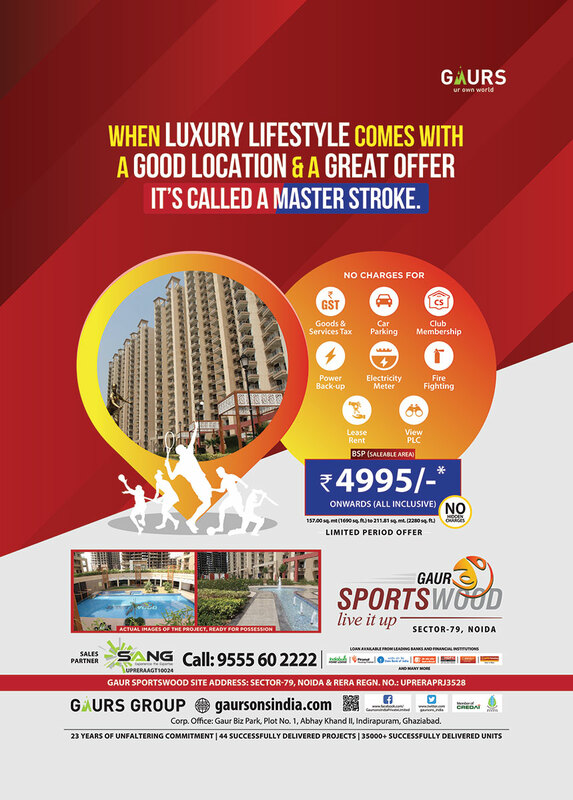 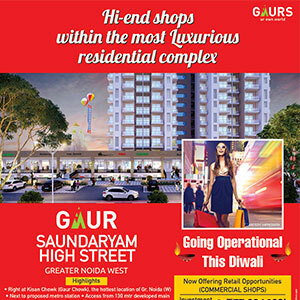 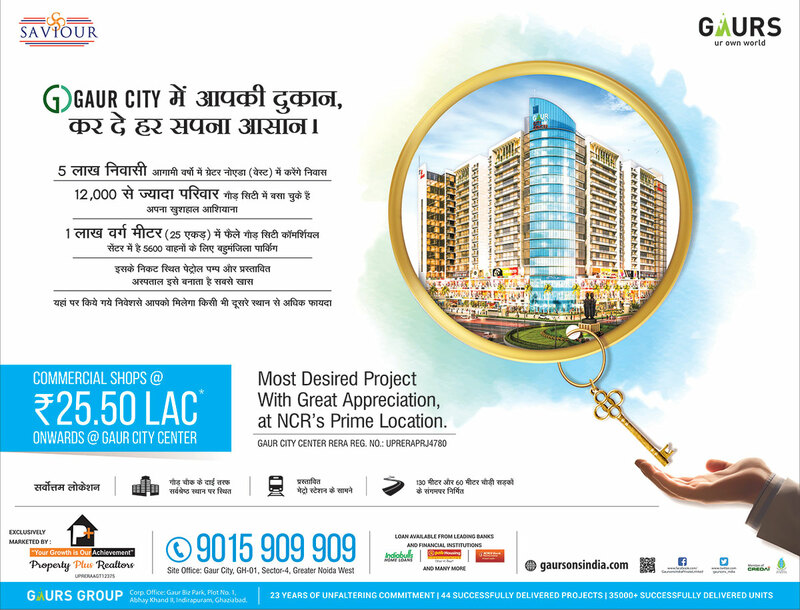 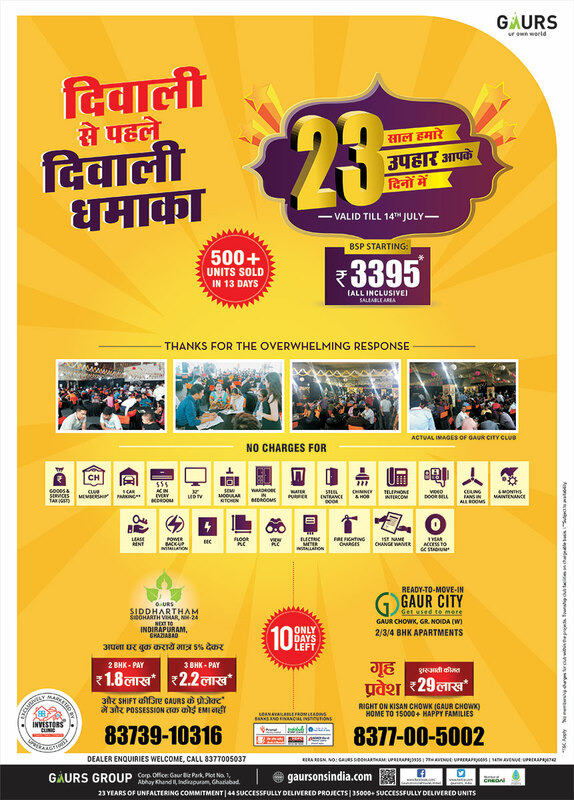 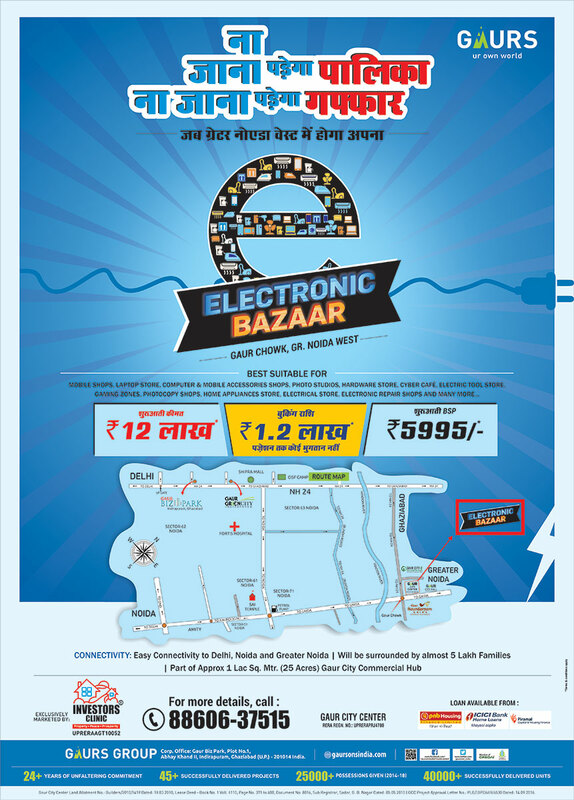 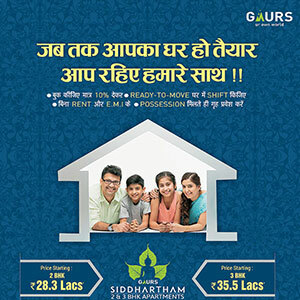 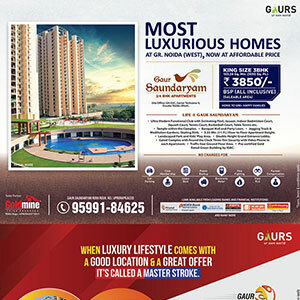 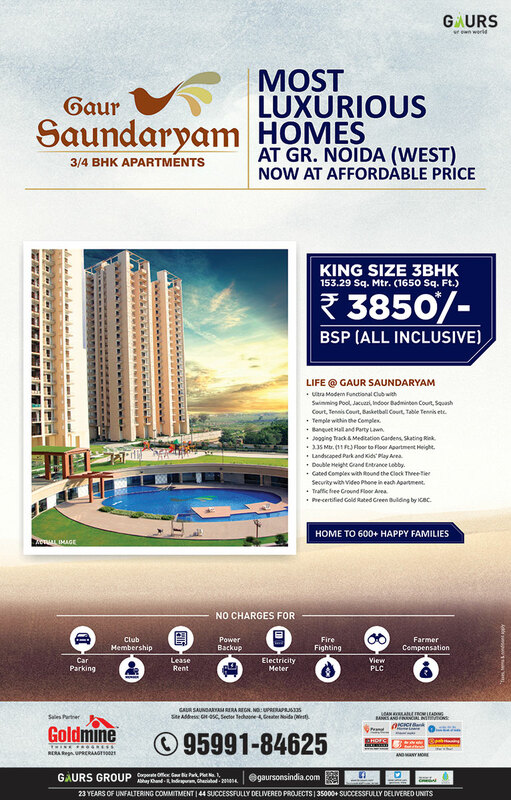 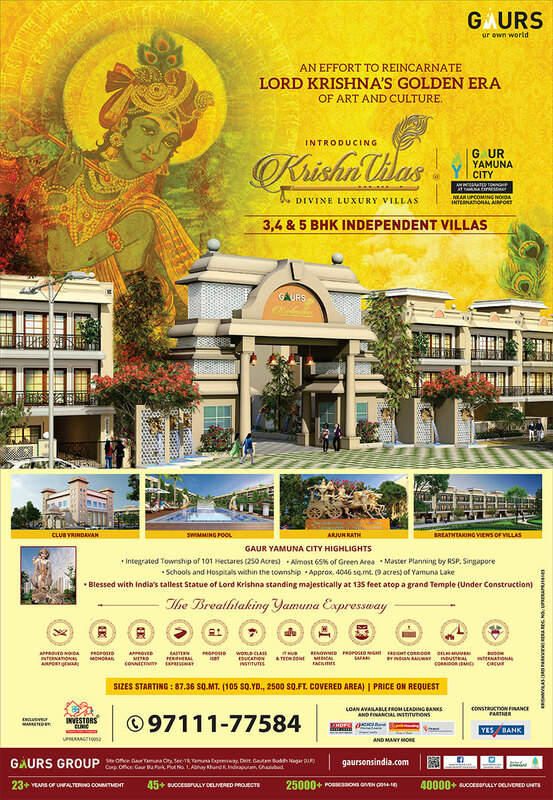 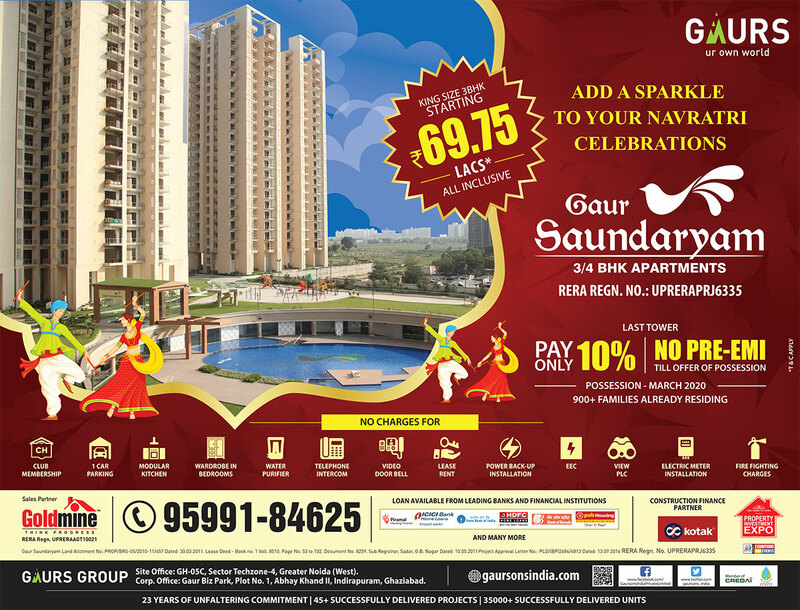 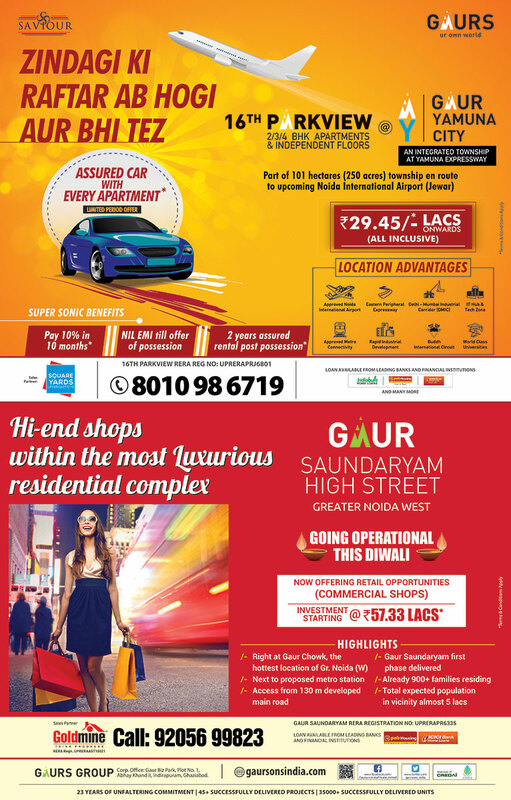 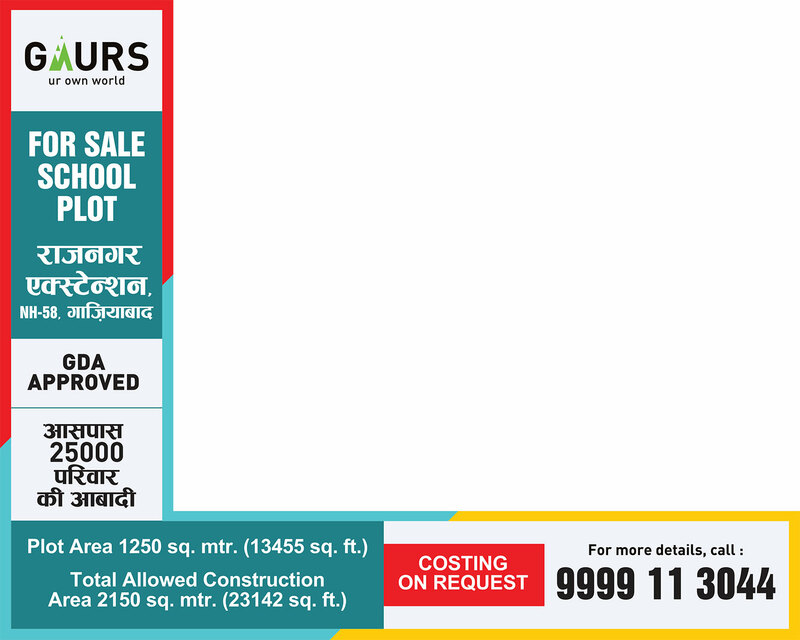 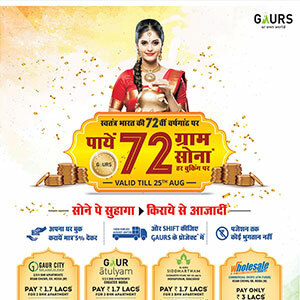 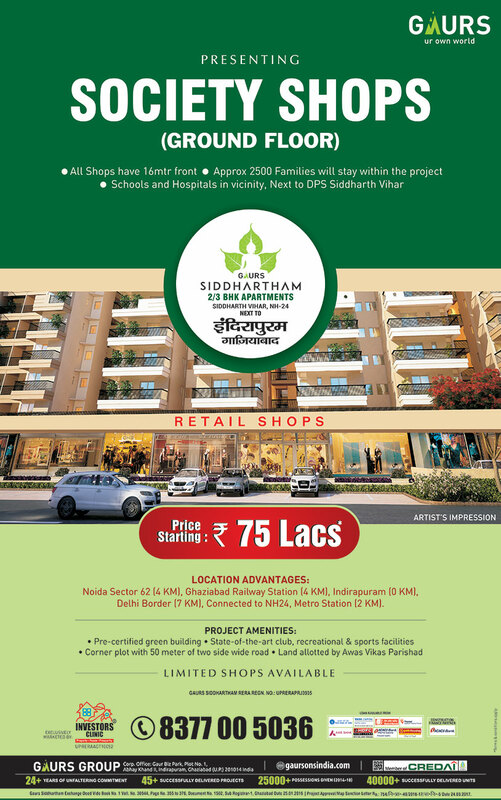 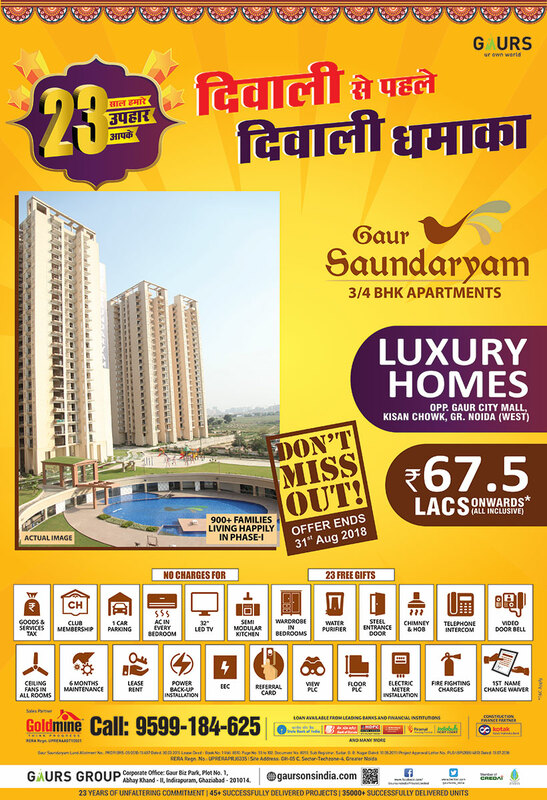 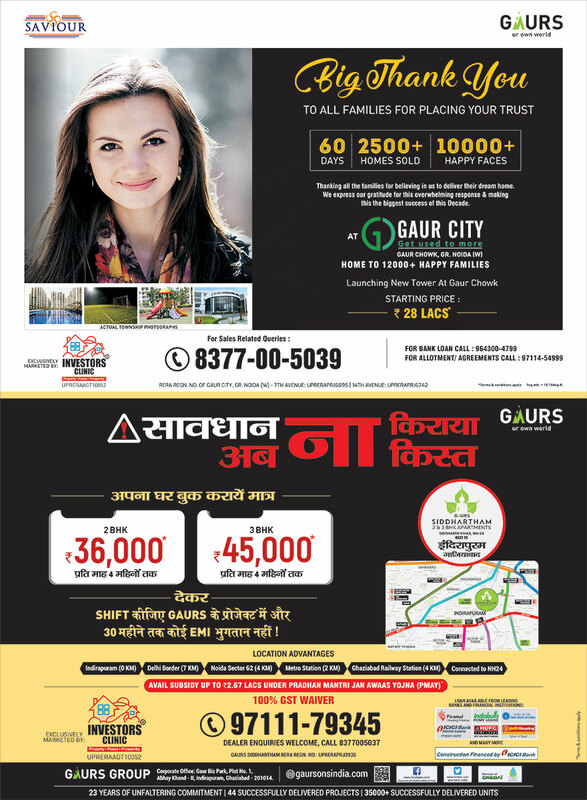 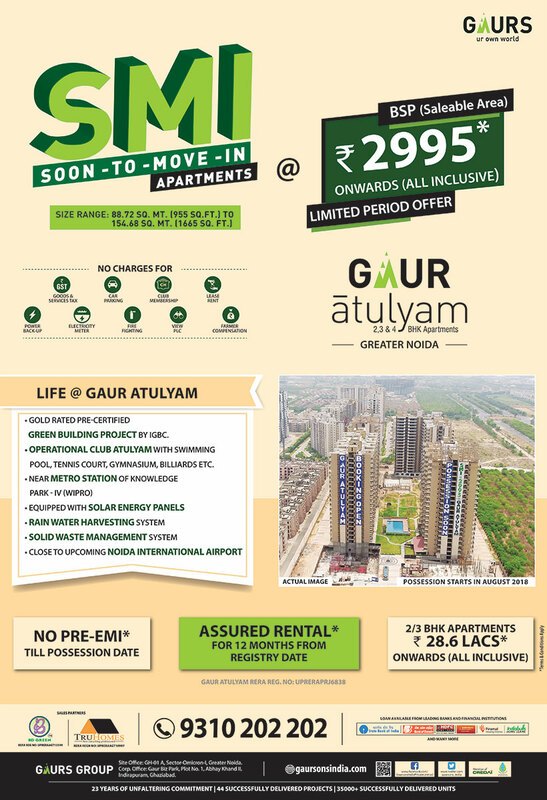 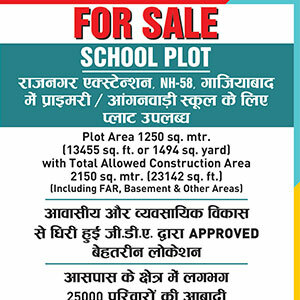 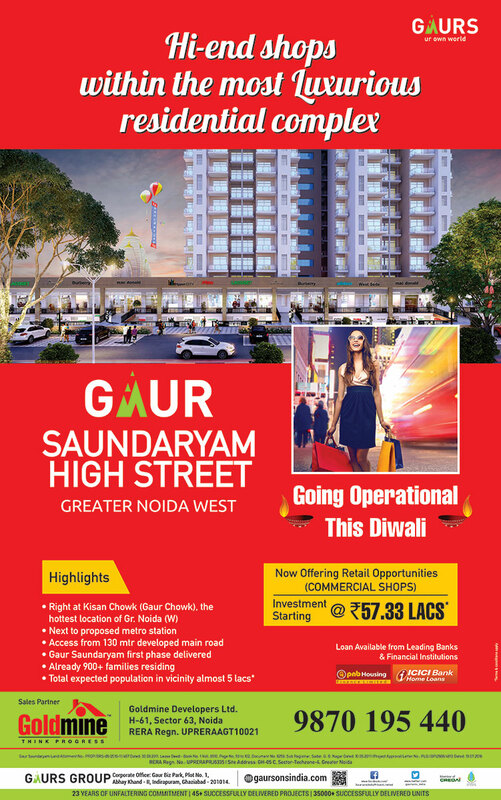 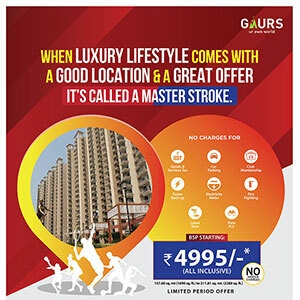 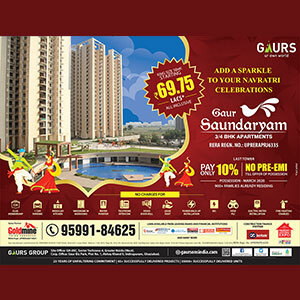 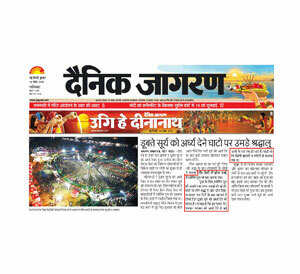 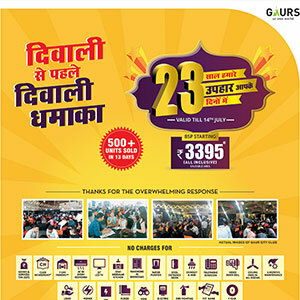 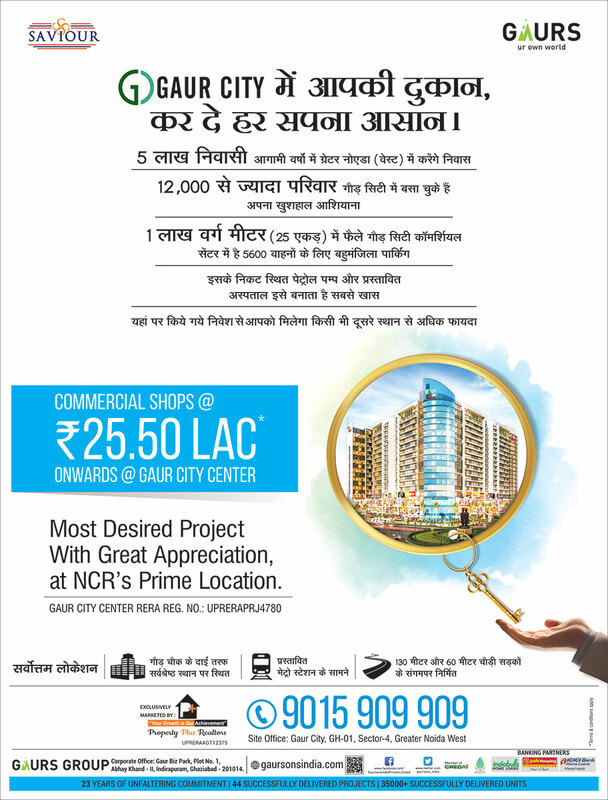 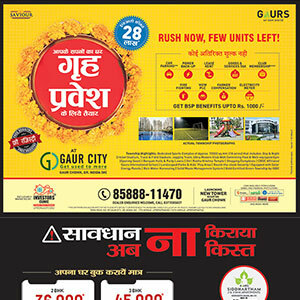 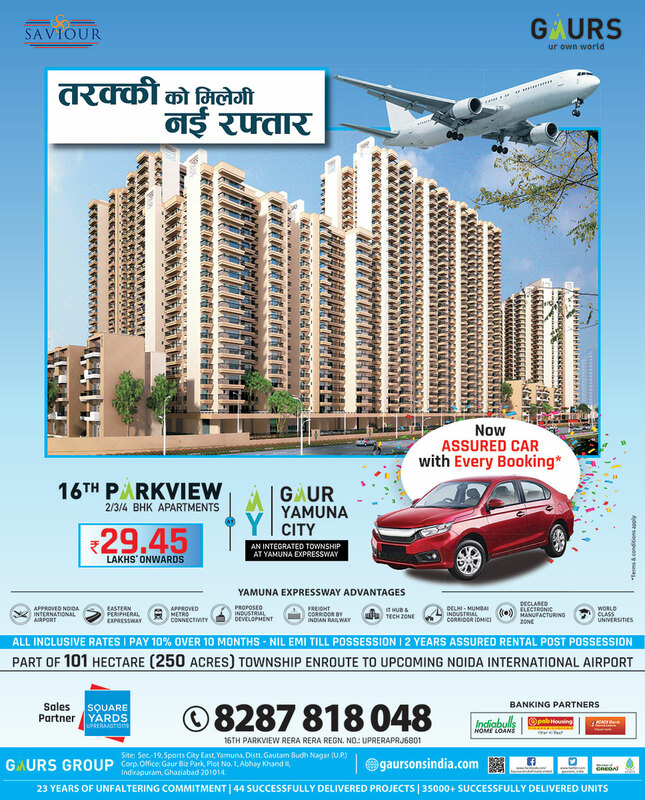 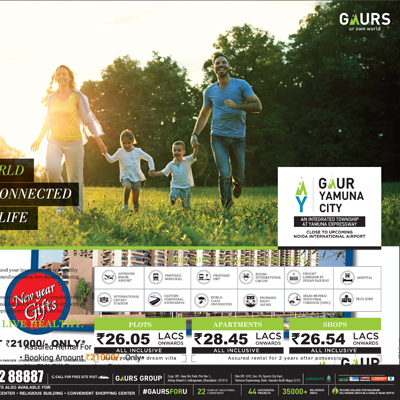 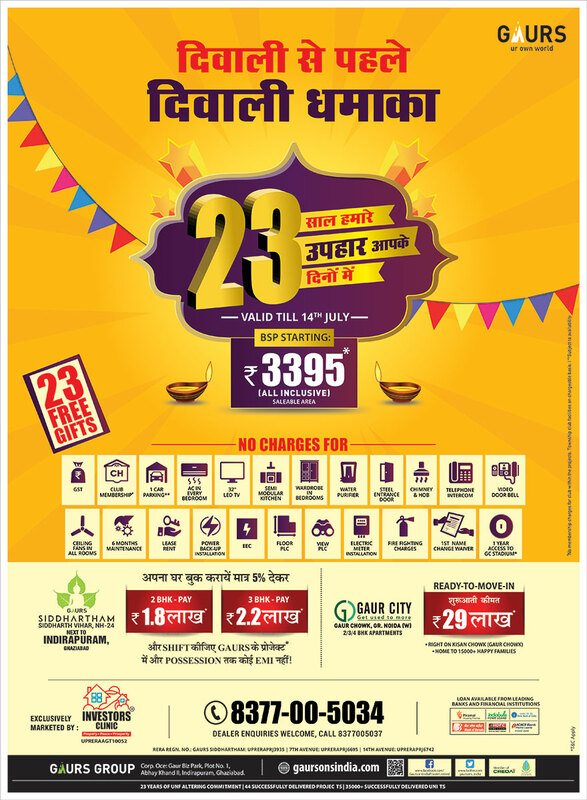 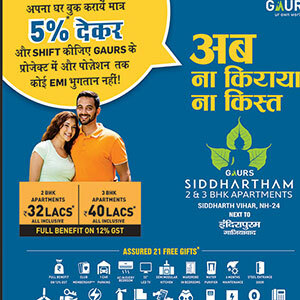 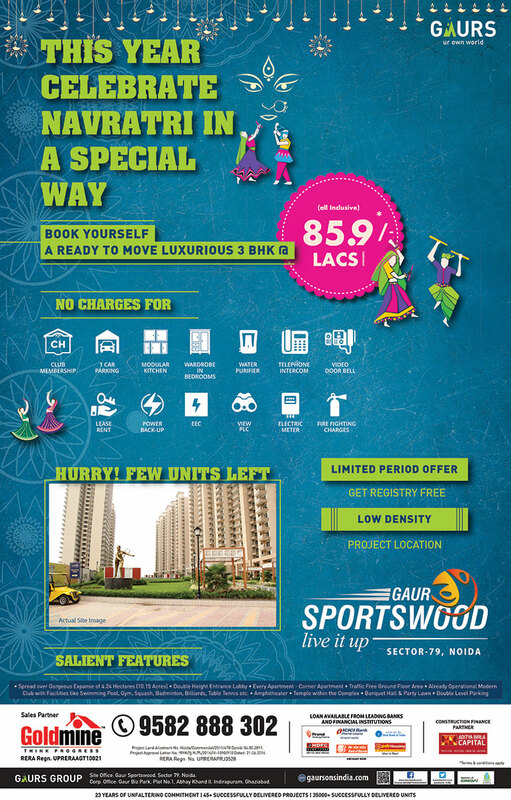 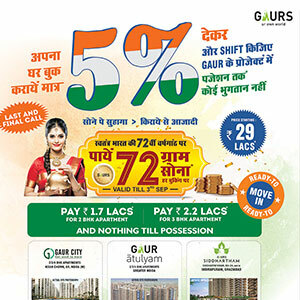 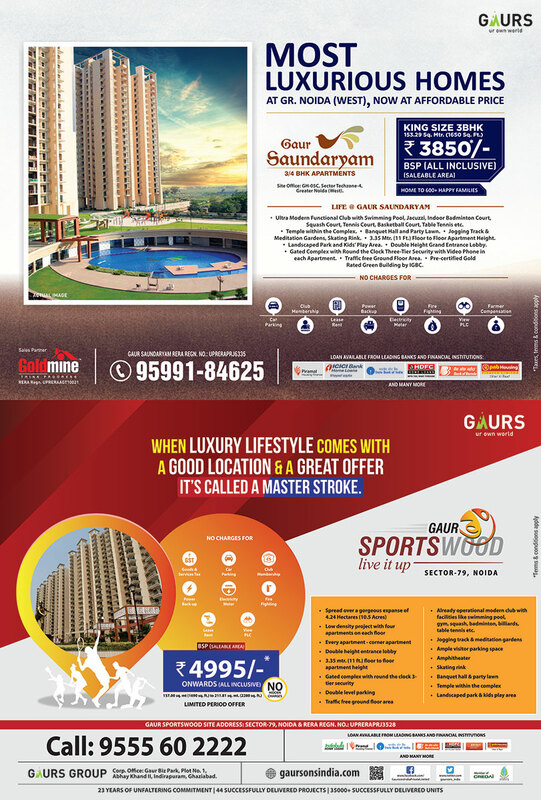 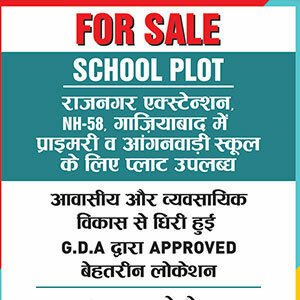 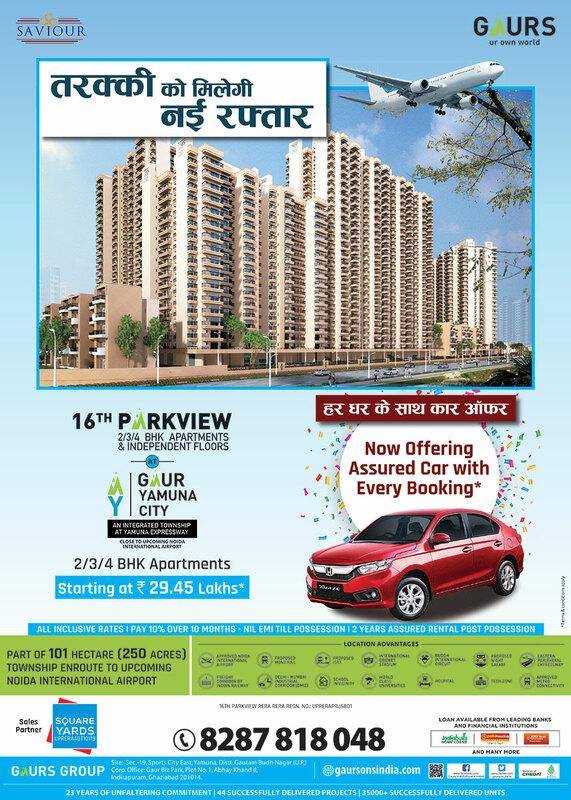 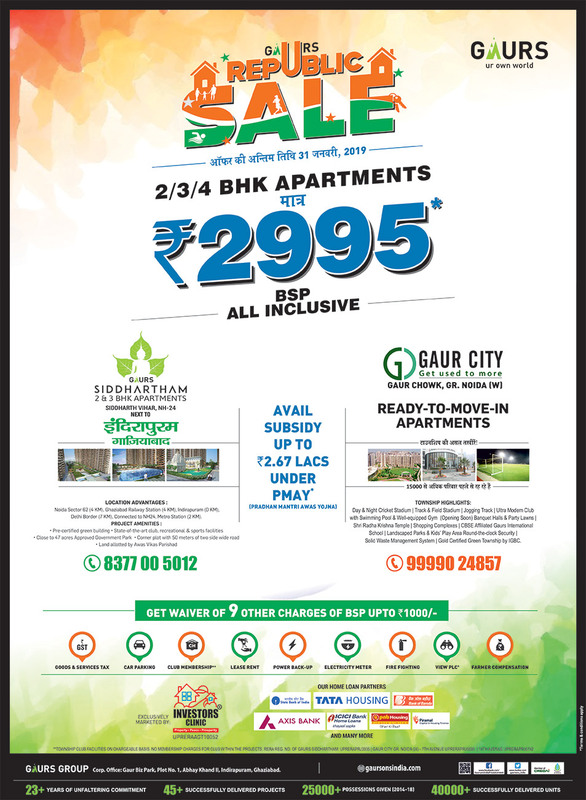 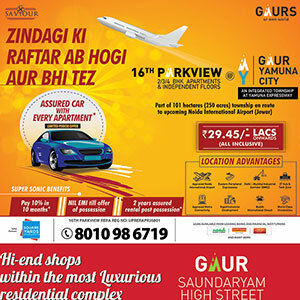 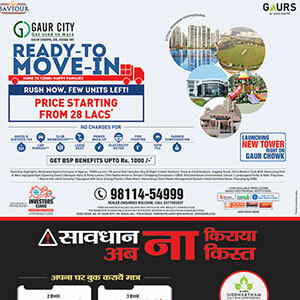 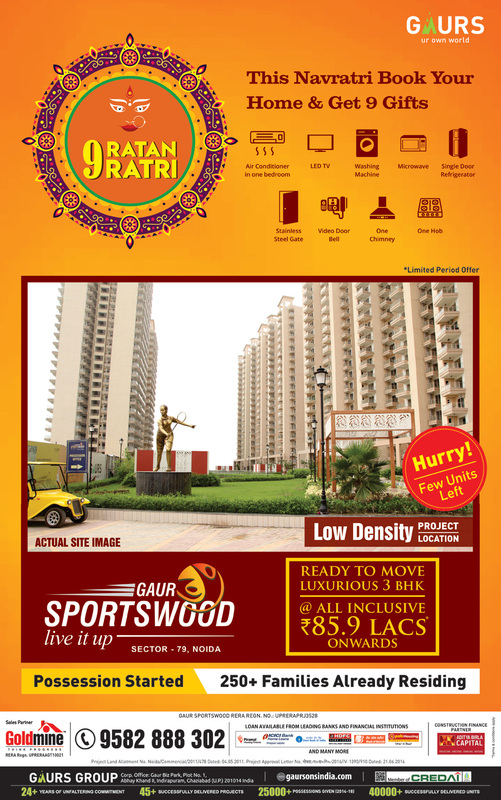 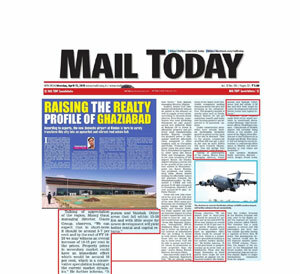 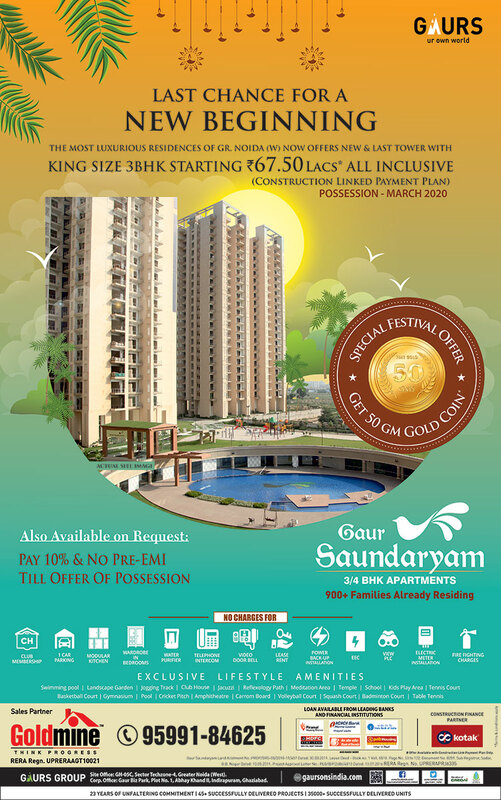 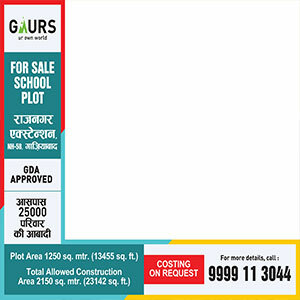 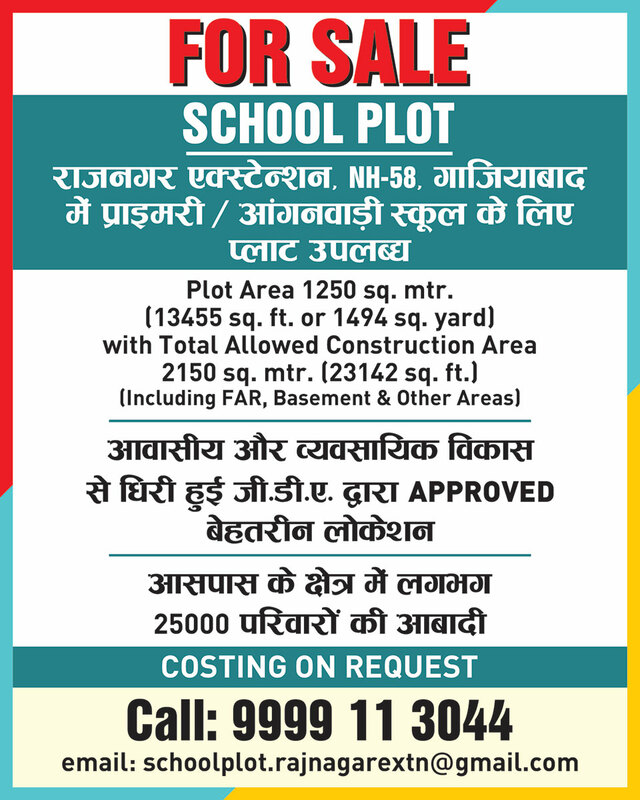 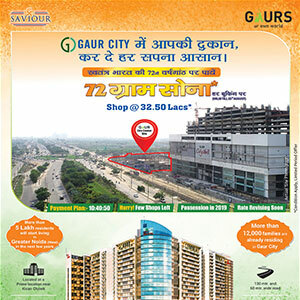 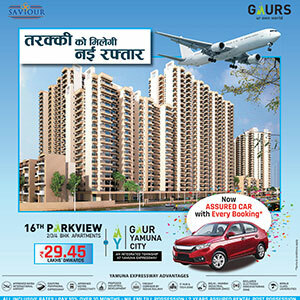 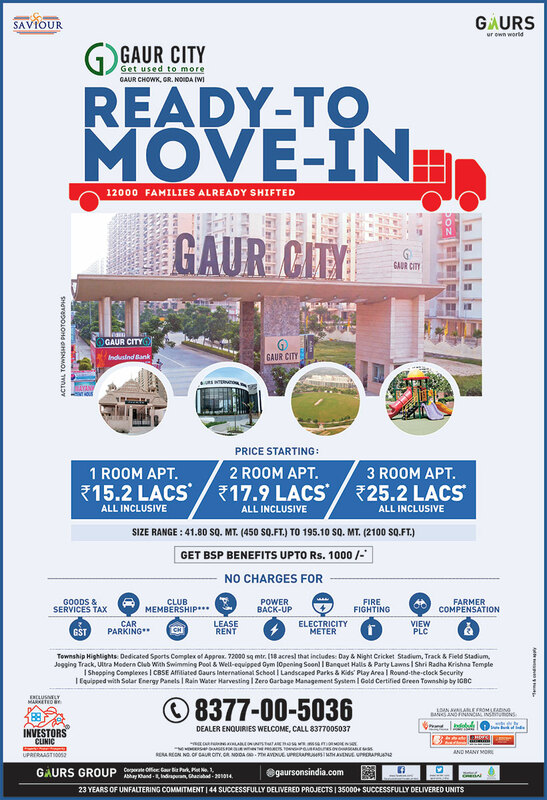 Samachar Plus conducts an exclusive report on the tremendous response at Gaur City under an exclusive offer. 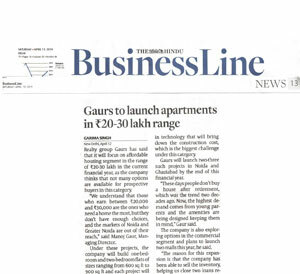 Mr. Manoj Gaur, MD, Gaurs Group shared his views on Housing for all by 2022 in an exclusive interview with Zee Business. 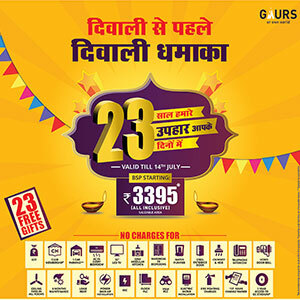 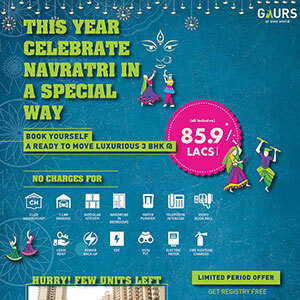 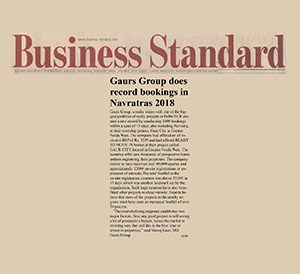 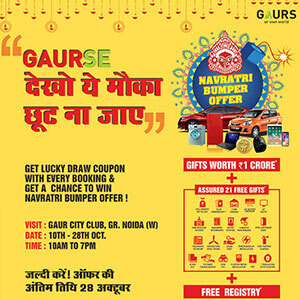 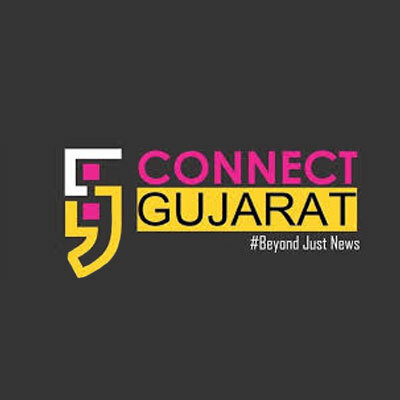 The ongoing special Navratri offers of Gaurs Group along with views of Mr. Manoj Gaur, M.D., Gaurs Group, got featured in the leading business platform, Zee Business. 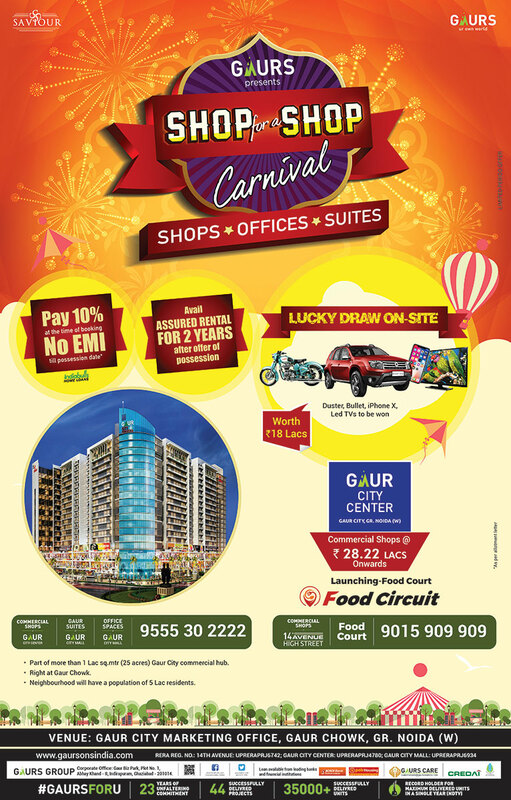 Barbeque Nations opens at Gaur Central Mall. 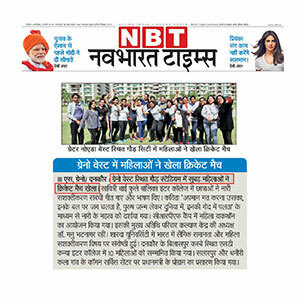 Ashwiny Iyer Tiwari was honoured with the Best Debut Director award for Nil Battey Sannata by our MD, Manoj Gaur and Director, Manju Gaur at the 62nd Filmfare Awards. 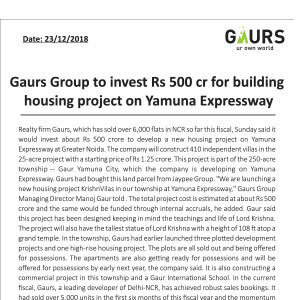 Mr. Manoj Gaur, MD, Gaurs Group talks with NDTV Profit on the ongoing project, The Eastern Peripheral Expressway and its impact on real estate sector in the future. 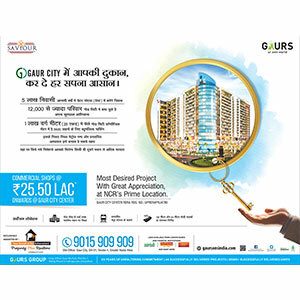 In an exclusive interaction with NDTV Profit, Mr. Manoj Gaur, MD Gaurs Group, talks about the route plan of CREDAI for the ongoing projects in Delhi NCR. 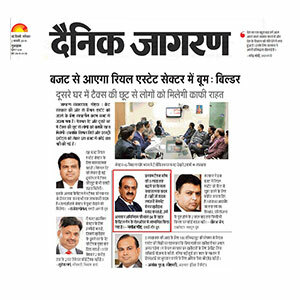 In an exclusive interview with Zee Business, Mr. Manoj Gaur, MD, Gaurs Group talks about the salient features of Siddharth Vihar, Ghaziabad. 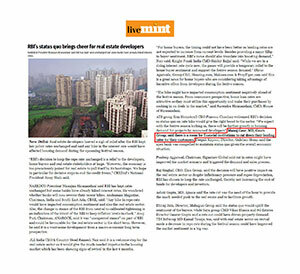 Mr. Manoj Gaur, MD, Gaurs Group discussing the effects of RERA in an exclusive discussing with NDTV. 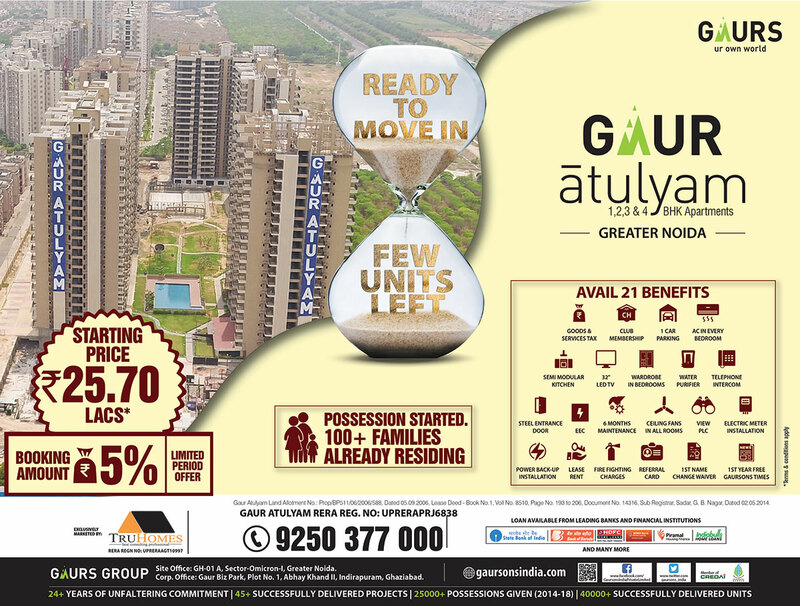 Gaur City bagged the Township of the year award at NDTV Property Awards 2016. 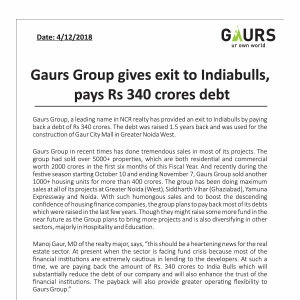 In an exclusive conversation with News World India, Mr. Manoj Gaur, MD, Gaurs Group, shared his views on demonetization and its impact on the real estate sector. 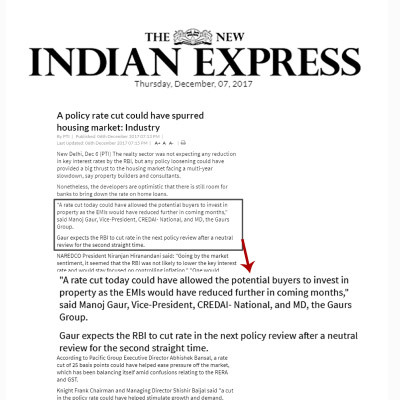 In an exclusive episode on ETV UP's show "Realty Check", Mr. Manoj Gaur,MD, Gaurs Group shared his views on RERA regulations and its guidelines. 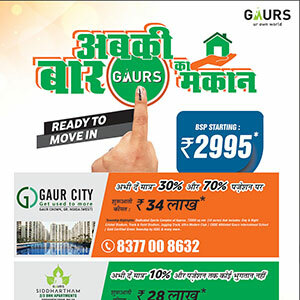 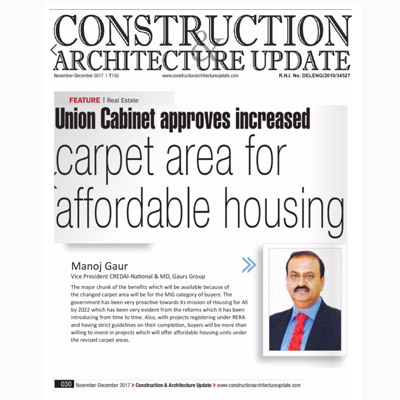 In an exclusive episode of ETV UP's show "Realty Check" Mr. Manoj Gaur, MD, Gaurs Group shared his views over the latest trend in the realty sector market of NCR. 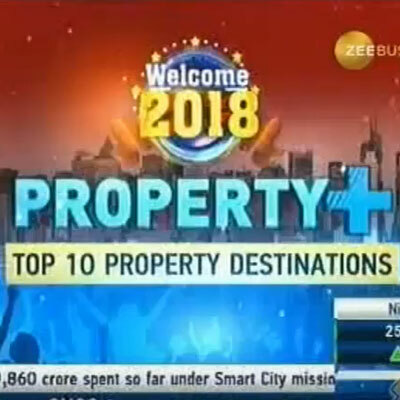 On an exclusive episode of CNBC Awaaz's show 'Property Guru', Mr. Manoj Gaur, MD, Gaurs Group talks about how the realty sector performed this year during the festive season. 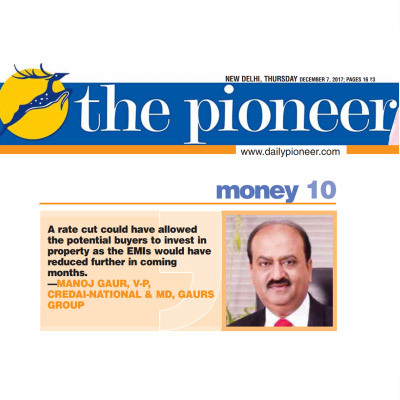 In an exclusive conversation with Dilli Ajtak, Mr. Manoj Gaur, MD, Gaurs Group shared his views on demonetization. 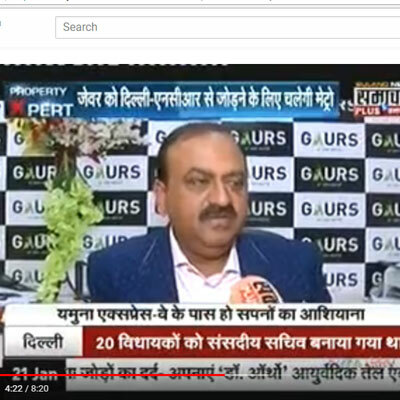 In an exclusive episode of NDTV Profit's 'The Property Show', Mr. Manoj Gaur, MD, Gaurs Group shared his views over the recently notified RERA in Uttar Pradesh. 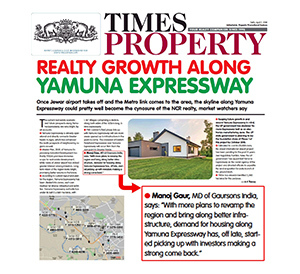 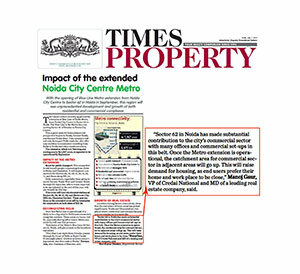 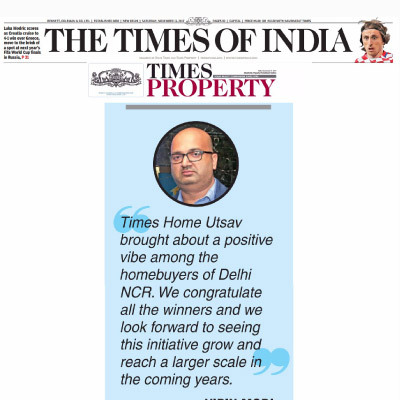 Mr. Manoj Gaur, MD, Gaurs Group shared his views on why Greater Noida West is one of the most highly scoring affordable and sought after real estate destinations in Delhi NCR in an exclusive interview with NDTV Profit. 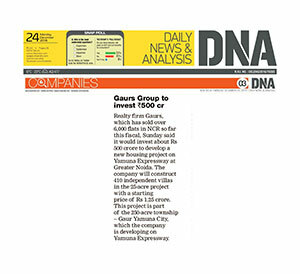 Mr. Manoj Gaur, MD, Gaurs Group in an interview with NDTV Prime shared his view on how the company has managed to spearhead the real estate in India. 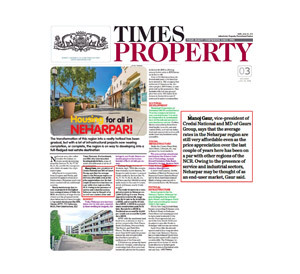 Gaurs Group bagged the award for the best execution track record at NDTV Property Awards 2015. 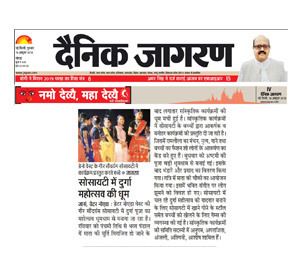 Shreya Ghoshal was honoured with the best female playback singer award for the same song by our MD, Manoj Gaur and Director, Manju Gaur at the 61st Filmfare Awards. 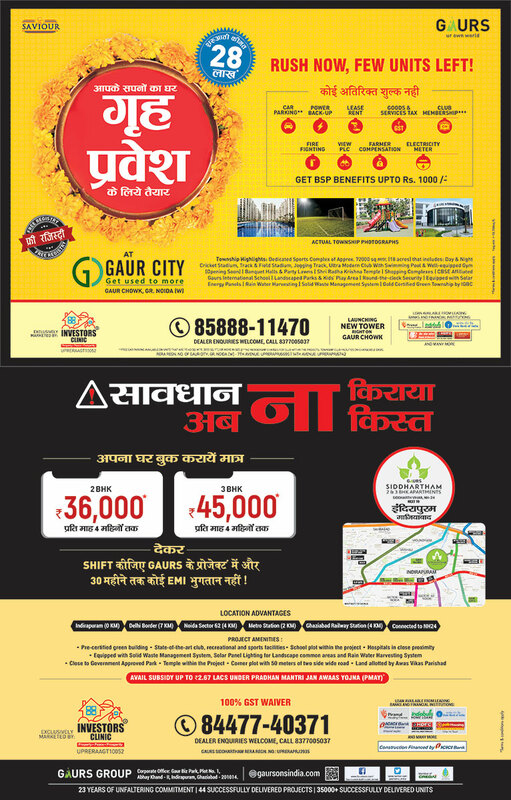 Gaur City has been named as Zero Garbage City. 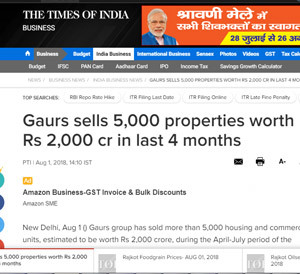 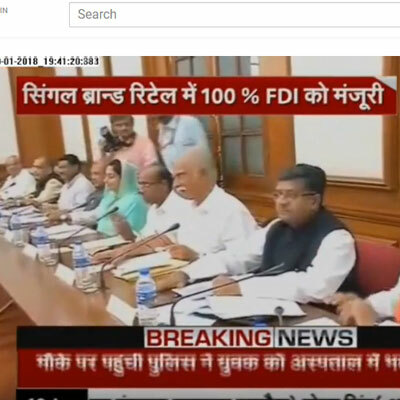 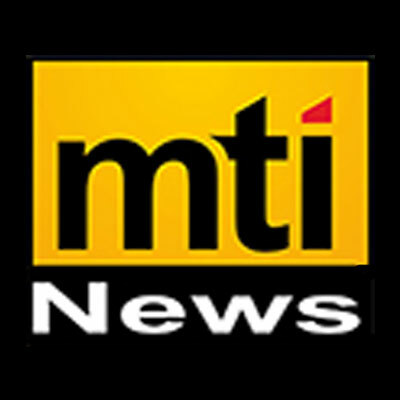 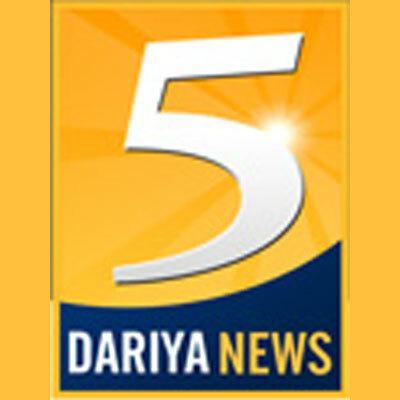 Checkout special coverage by NDTV Profit. 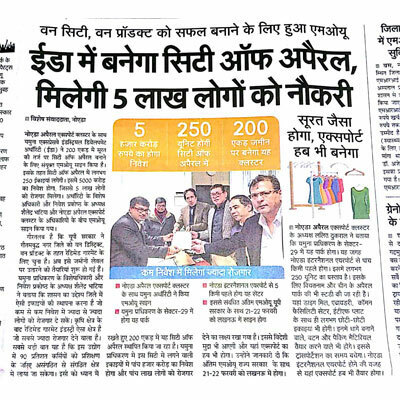 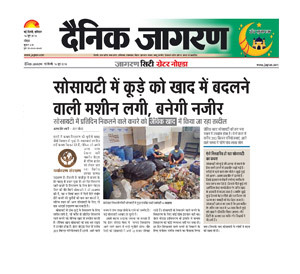 Media coverage by ETV on Gaur City- Zero Garbage City. 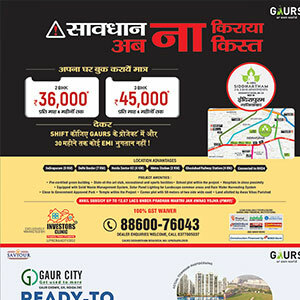 Gaur City- Zero Garbage City, media coverage by NDTV Profit. 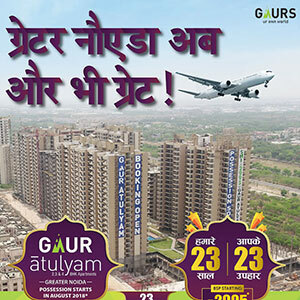 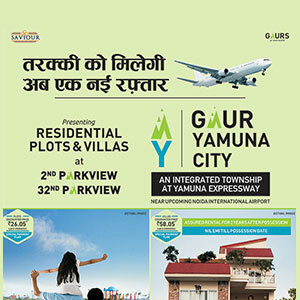 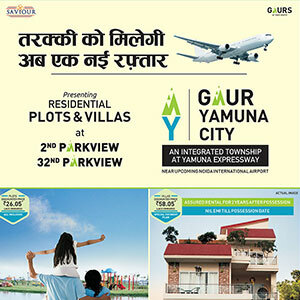 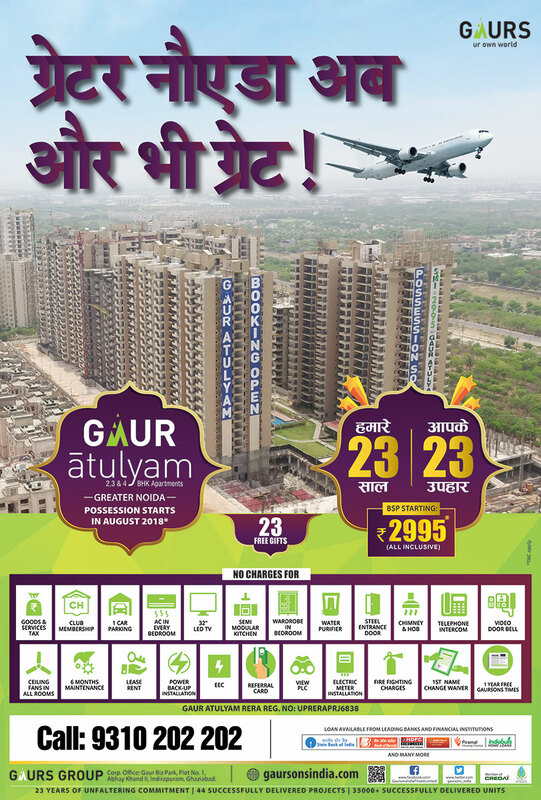 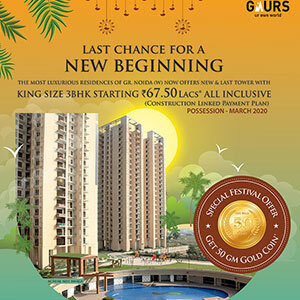 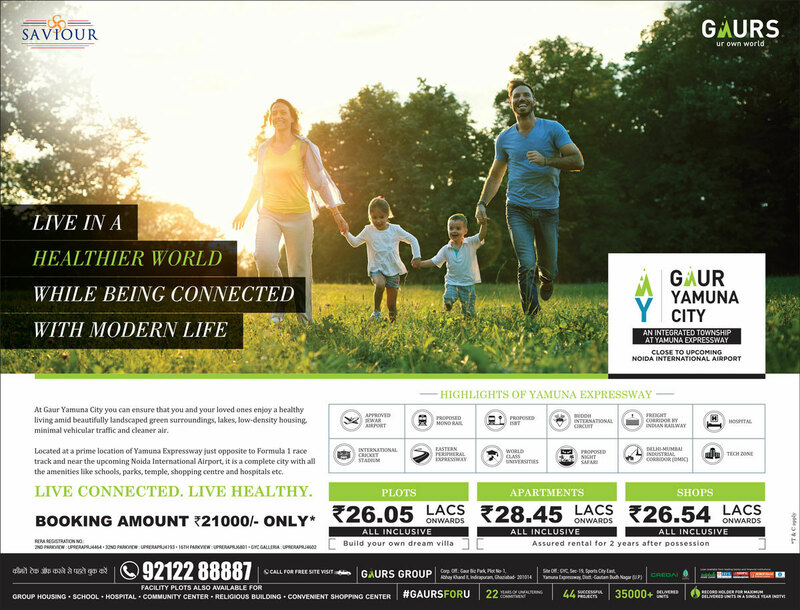 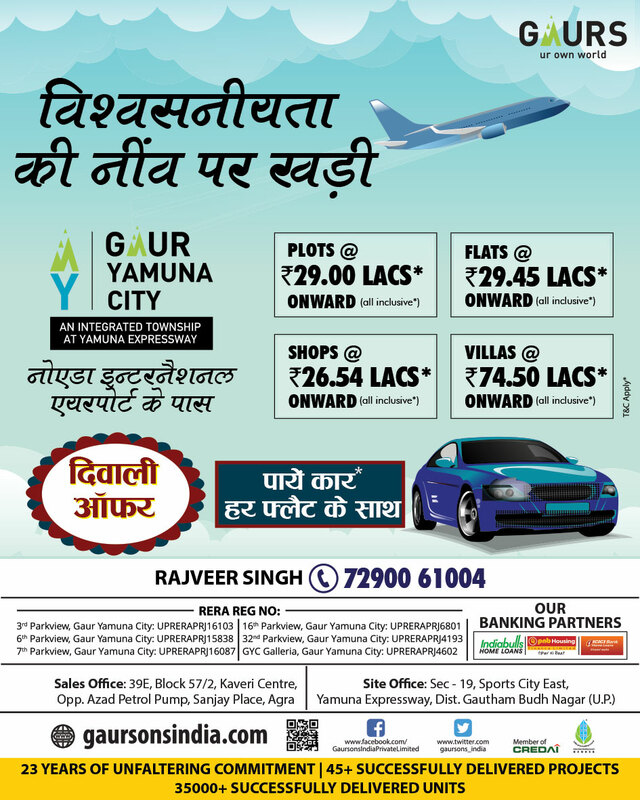 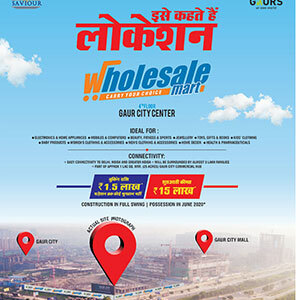 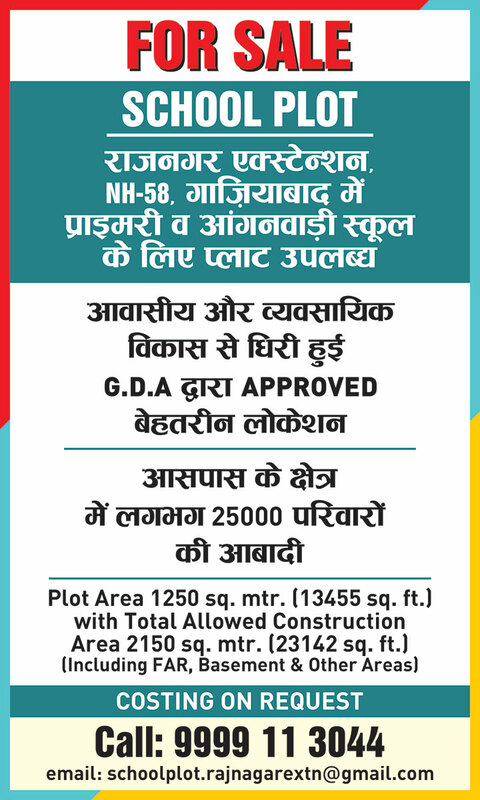 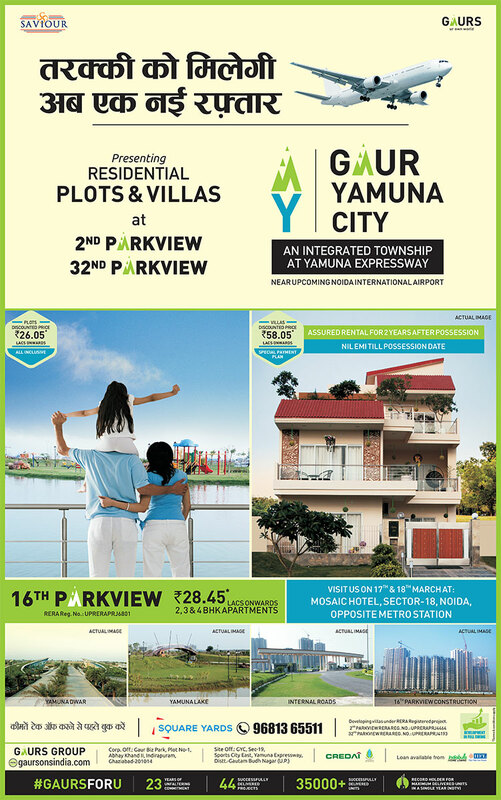 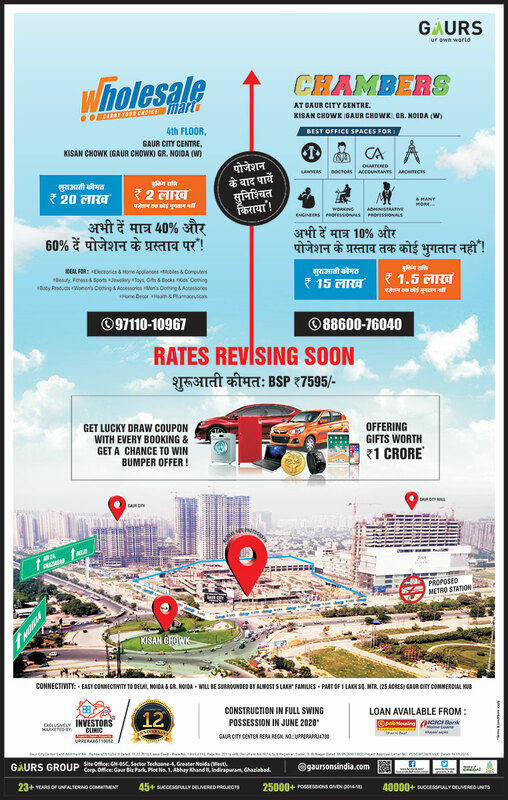 With Rs 5000 Crore Investment Gaurs Group Launched Gaur Yamuna City. 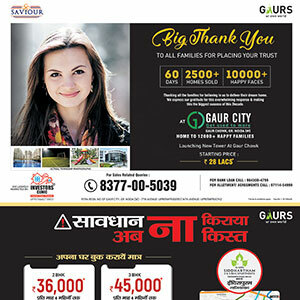 Gaurs Group recognizes the power of women. 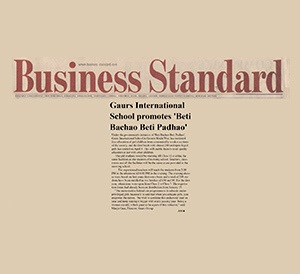 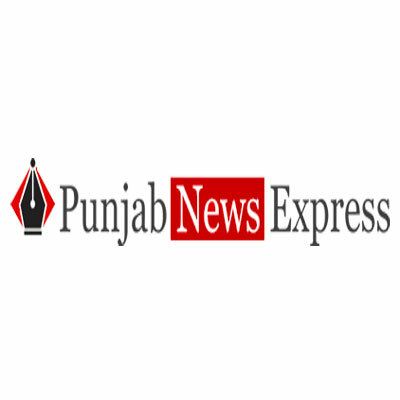 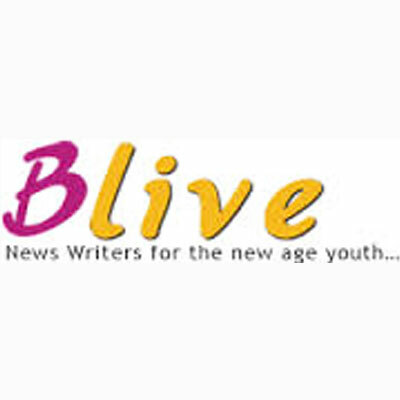 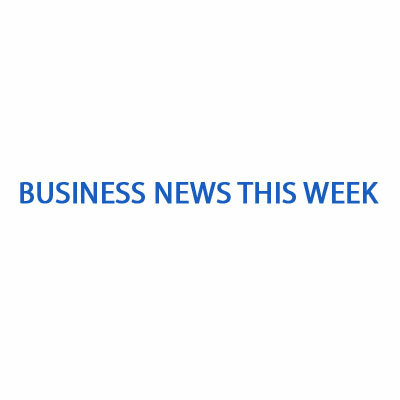 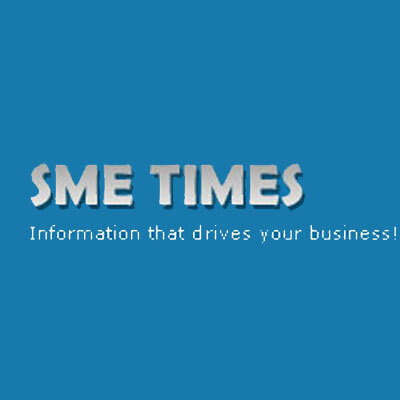 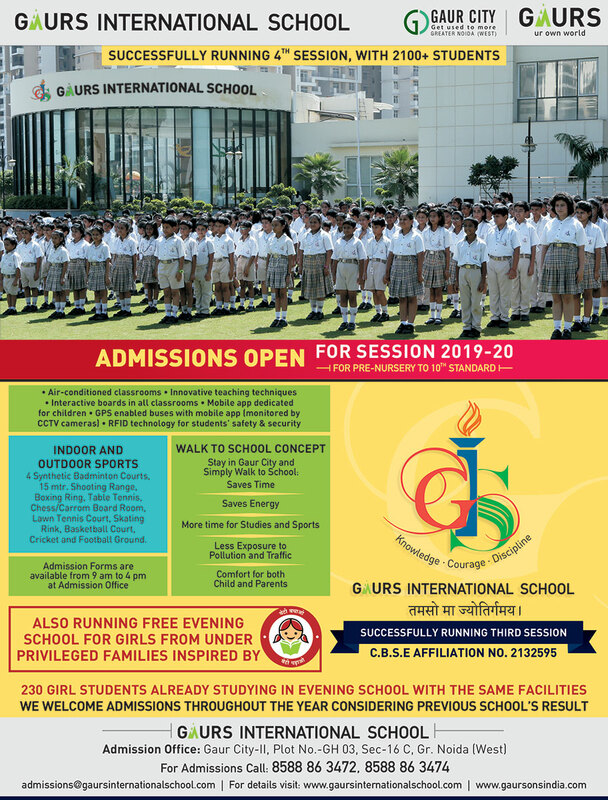 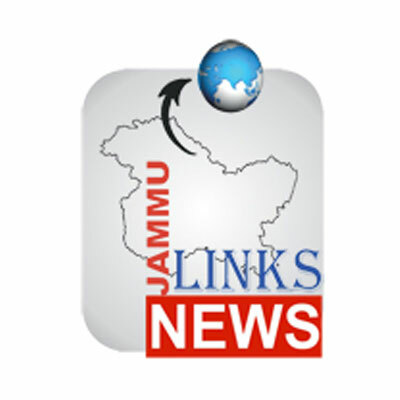 Business Brief Gaurs Group Offers Free Education to Children of Pulwama Martyrs. 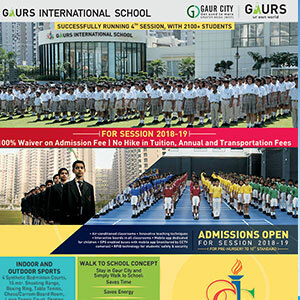 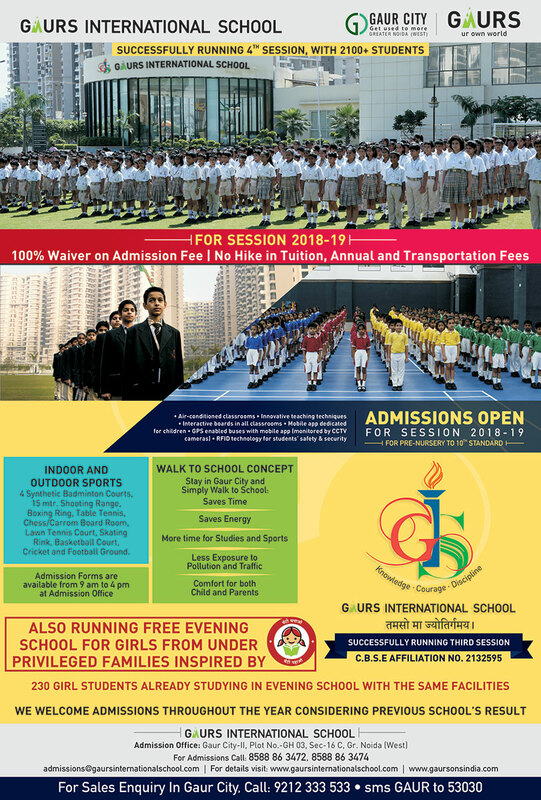 Students of Gaurs International School welcomed PM Modi at CREDAI Youthcon 2019. 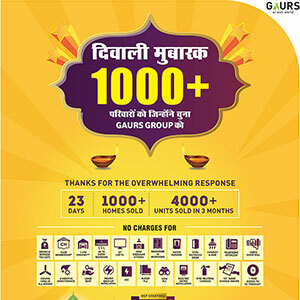 Gaurs Group raises Rs 640 crore from PNB Housing Finance Limited. 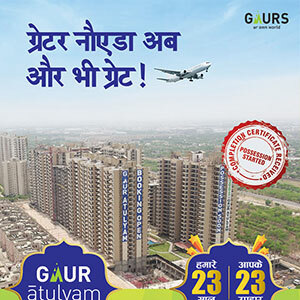 Gaurs Group sells over 10,000 units for a gross sales revenue of more than half a billion dollars in CY 18.